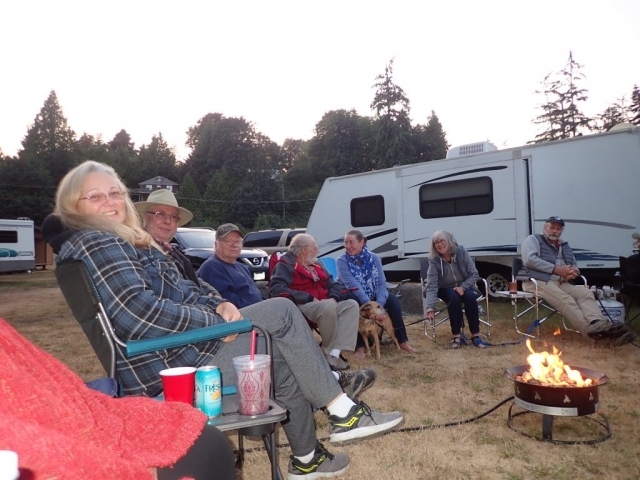 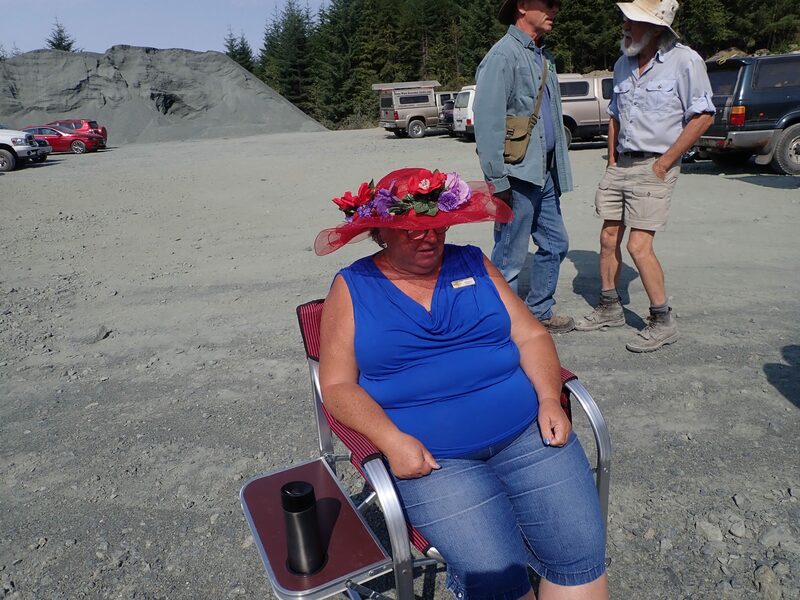 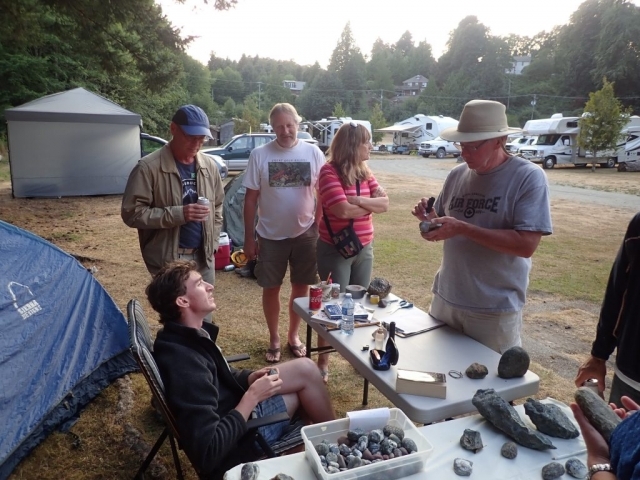 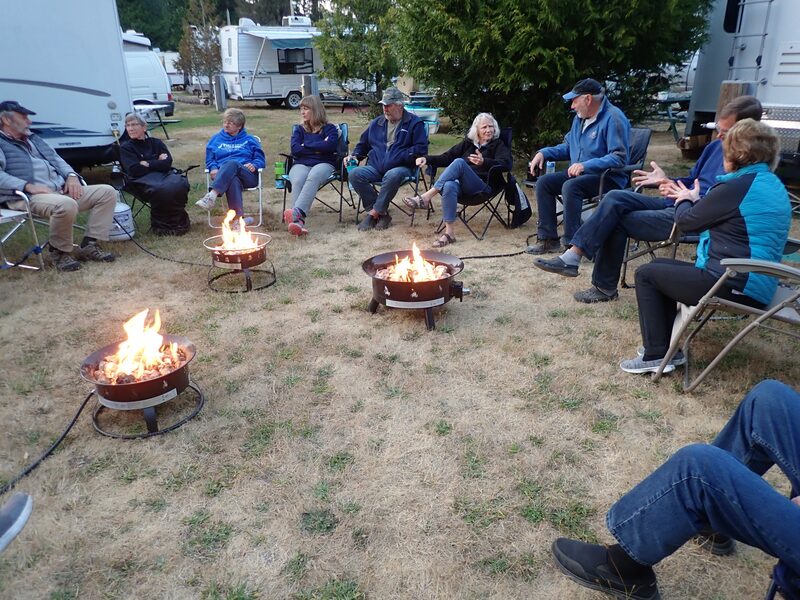 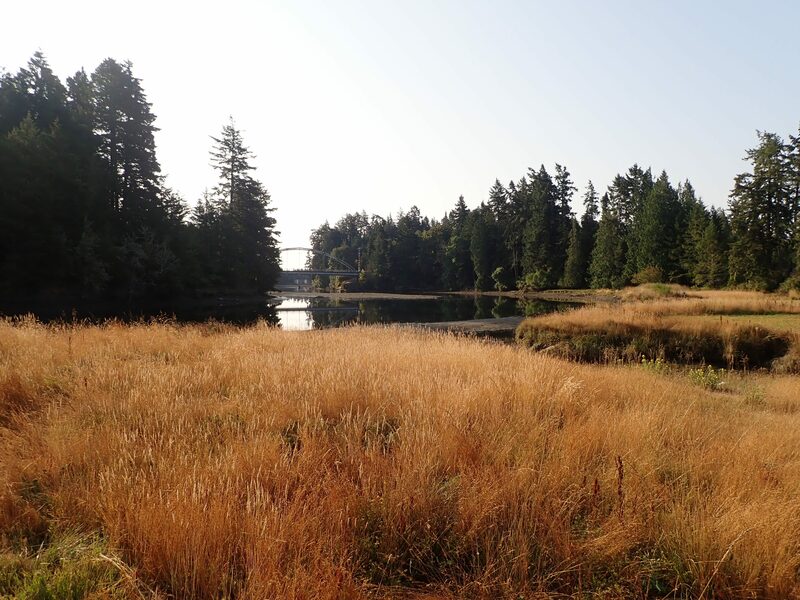 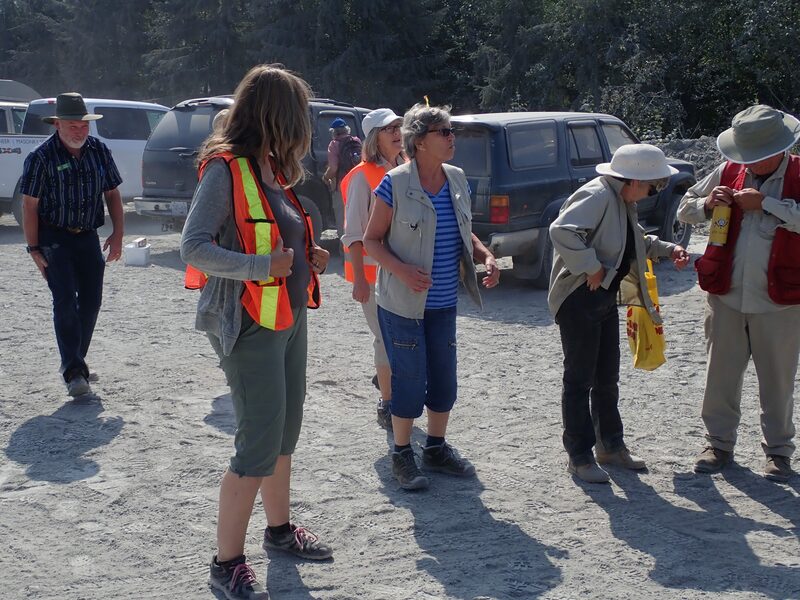 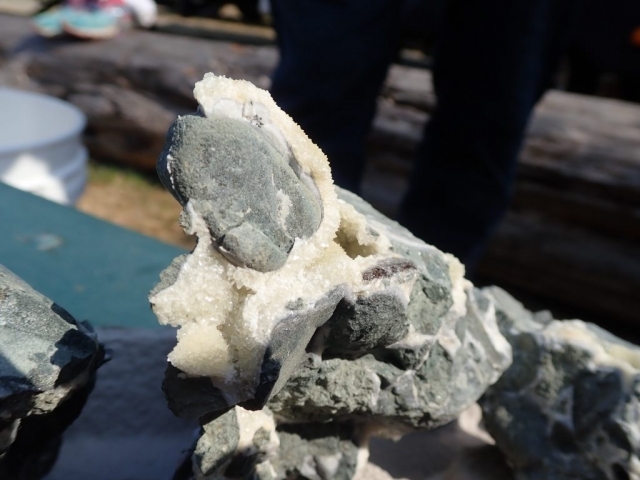 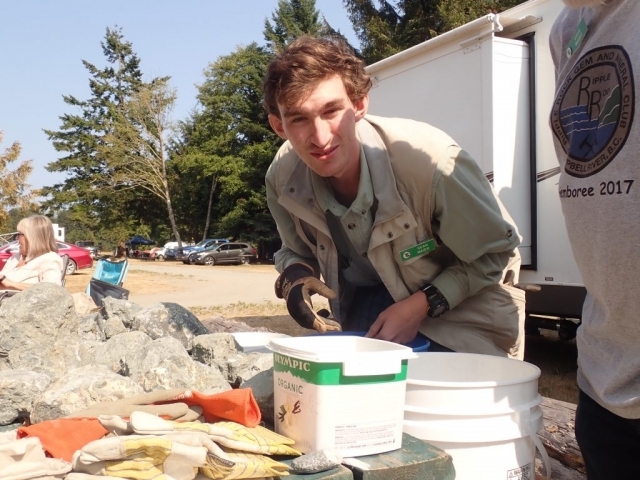 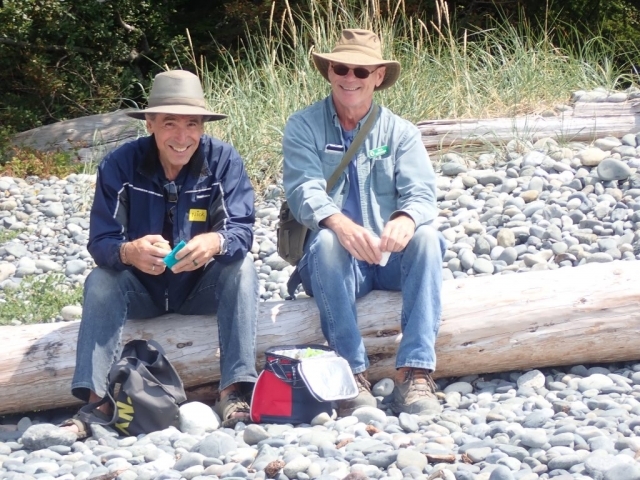 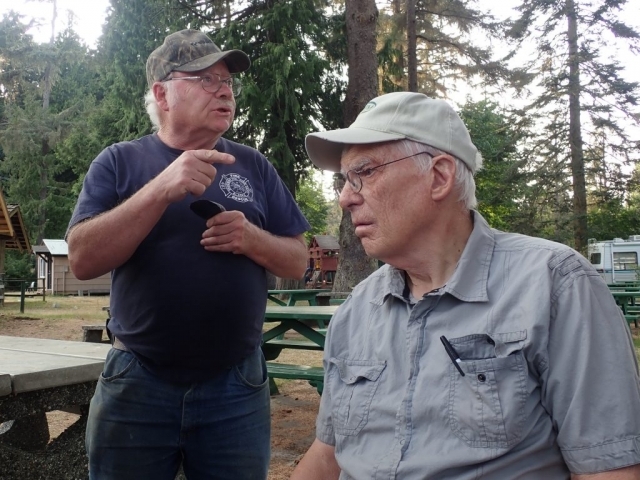 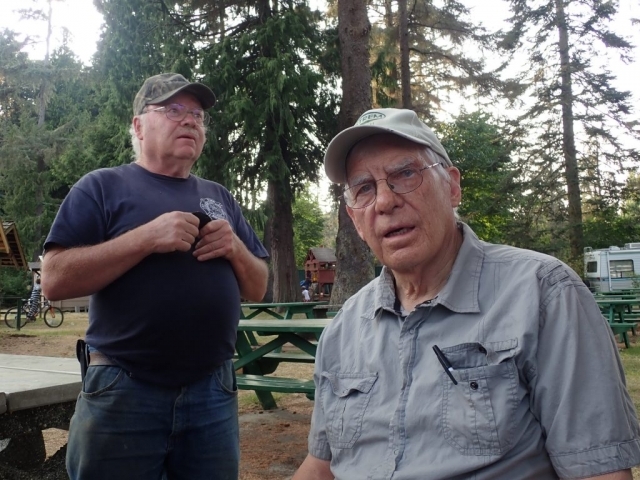 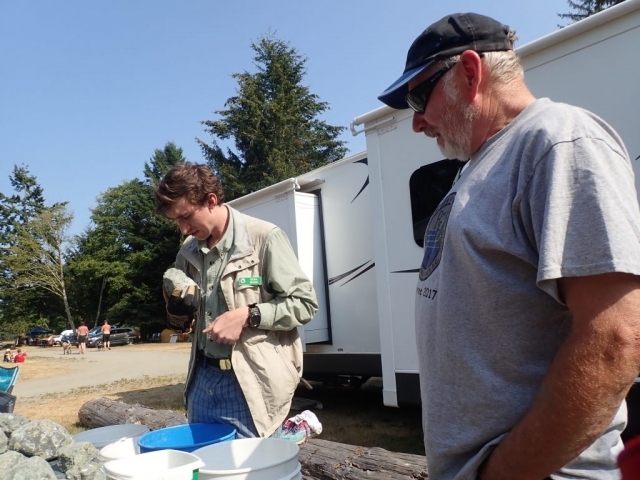 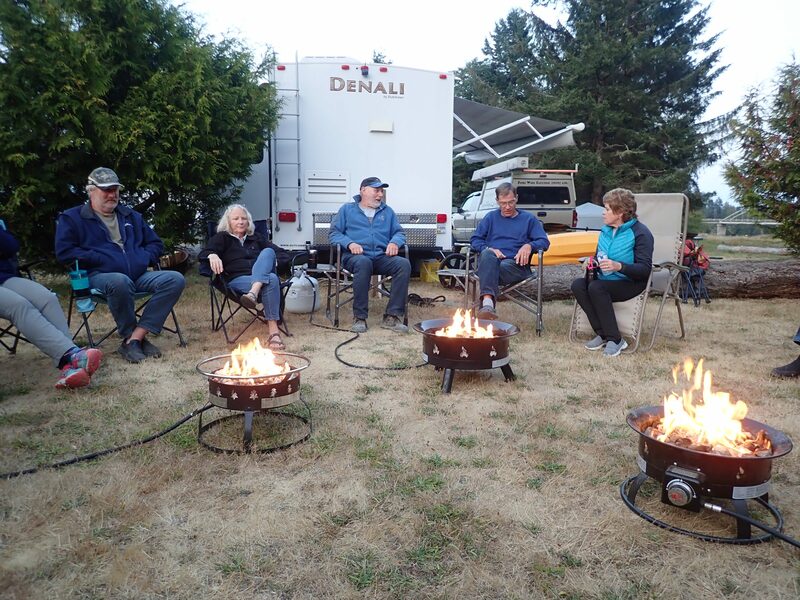 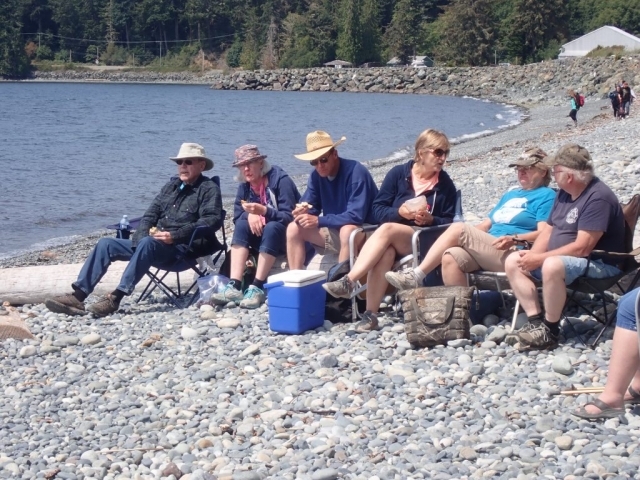 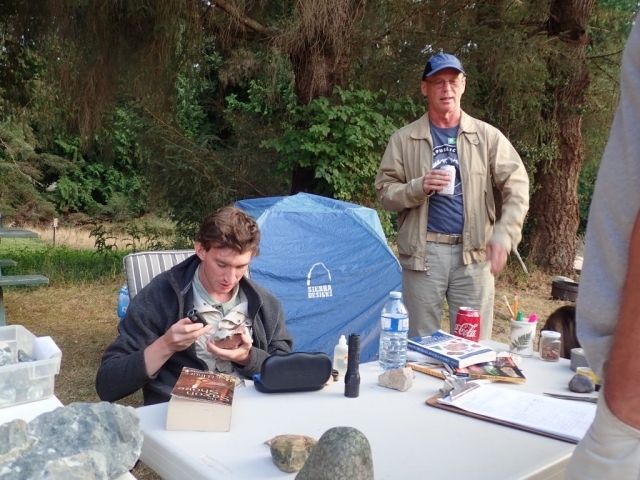 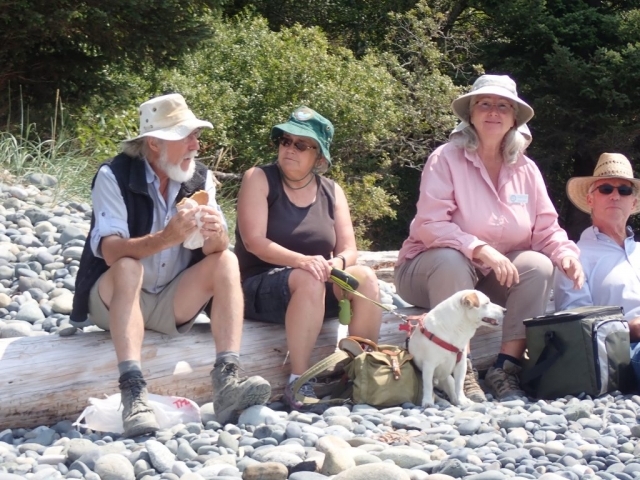 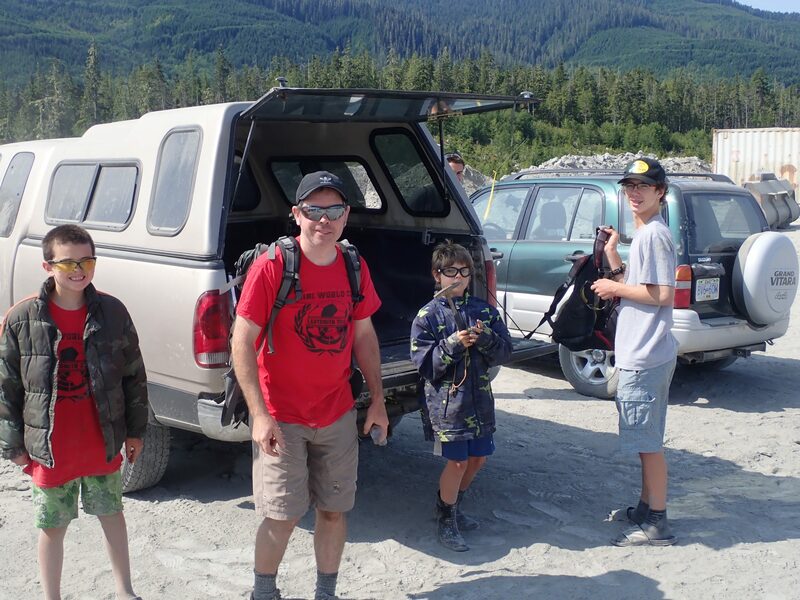 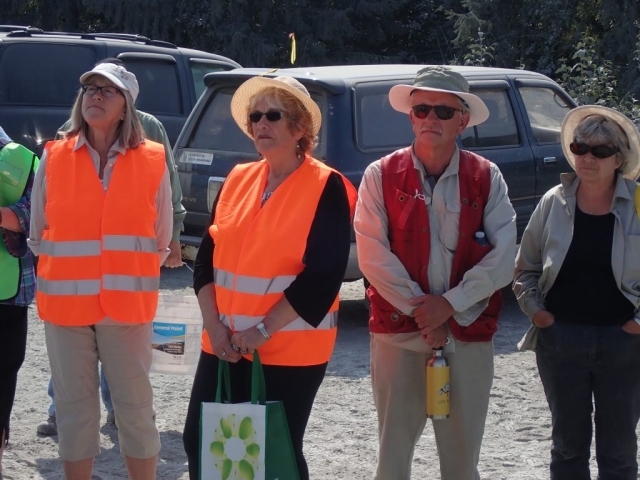 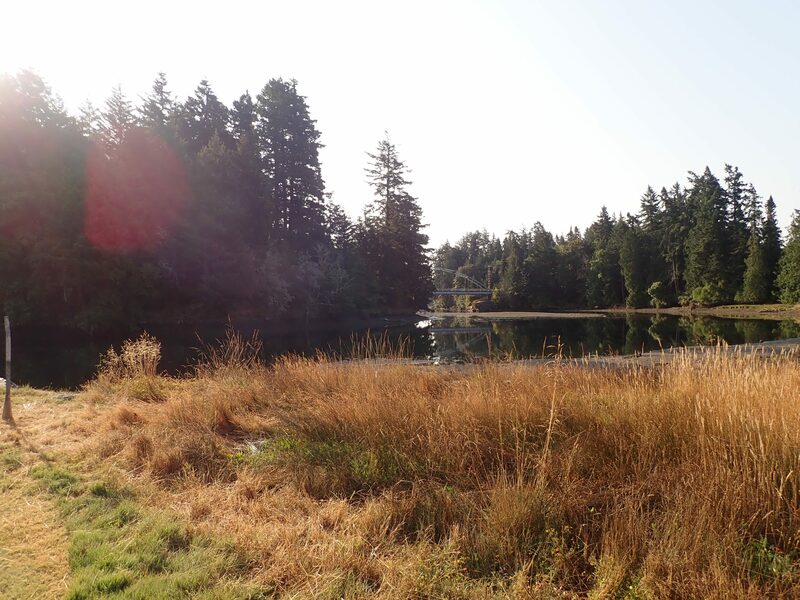 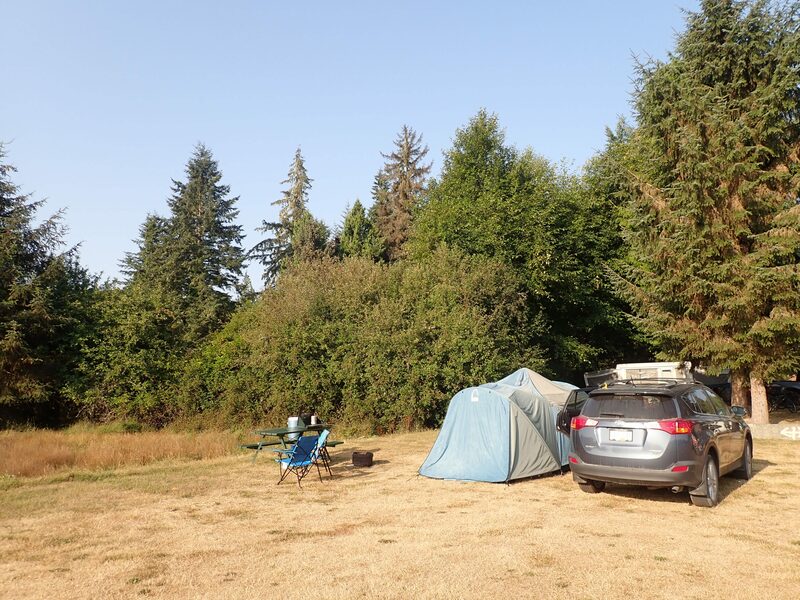 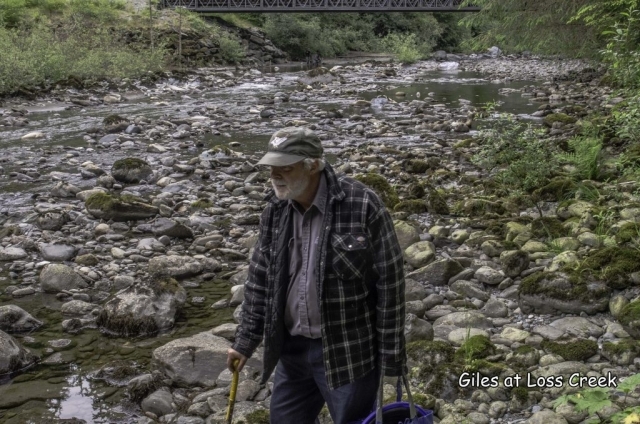 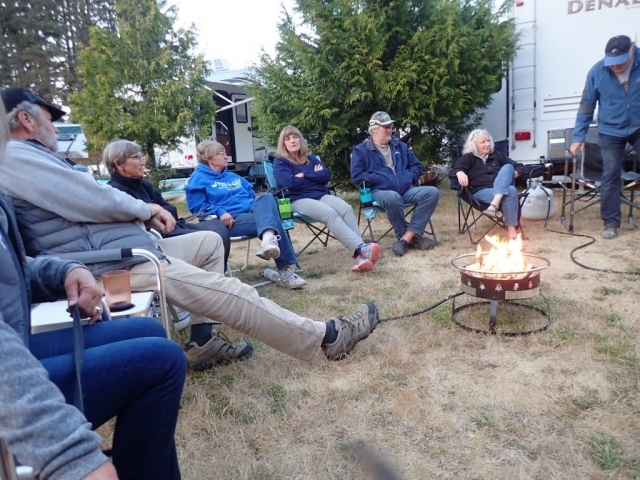 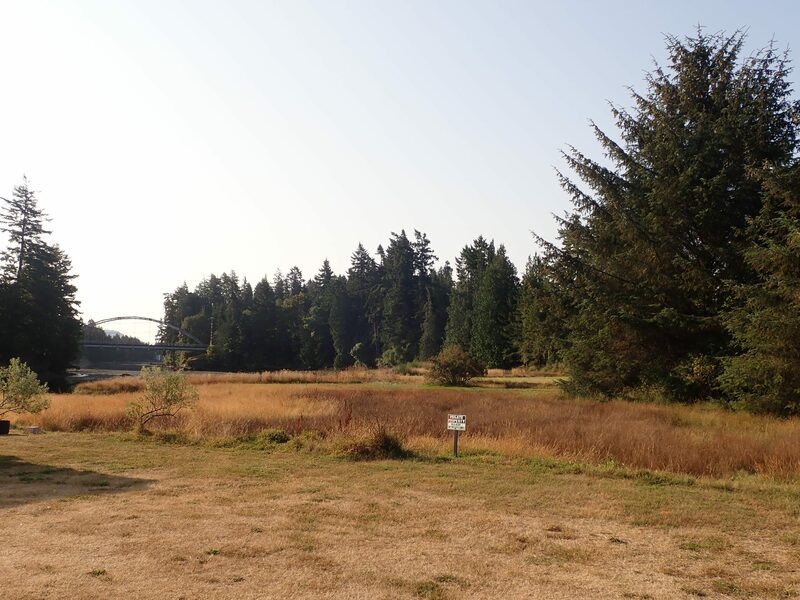 The 2018 Gemboree was hosted by the Victoria LMS and held at the Sooke River Campground. 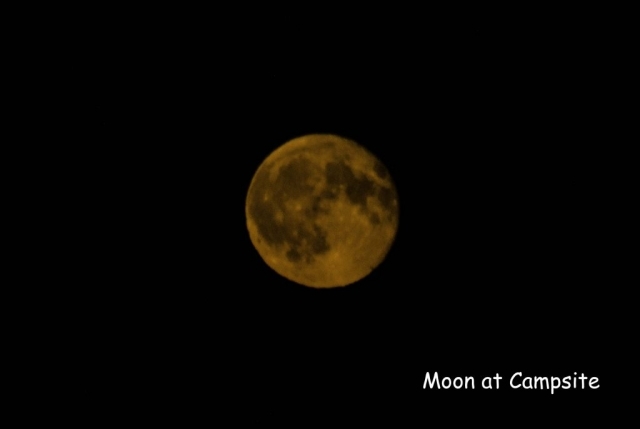 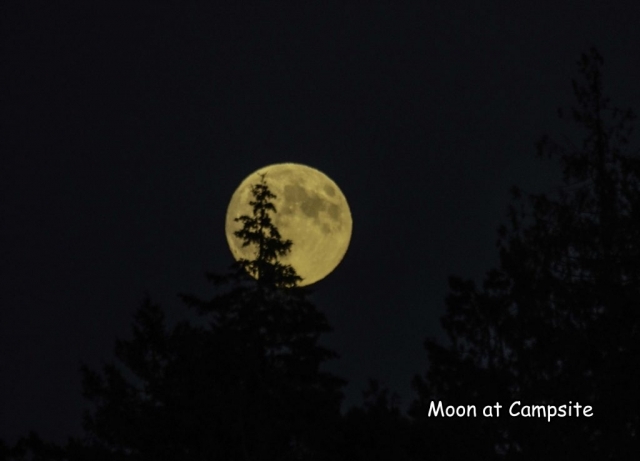 Our web server space is limited, so only low resolution photos are uploaded here. 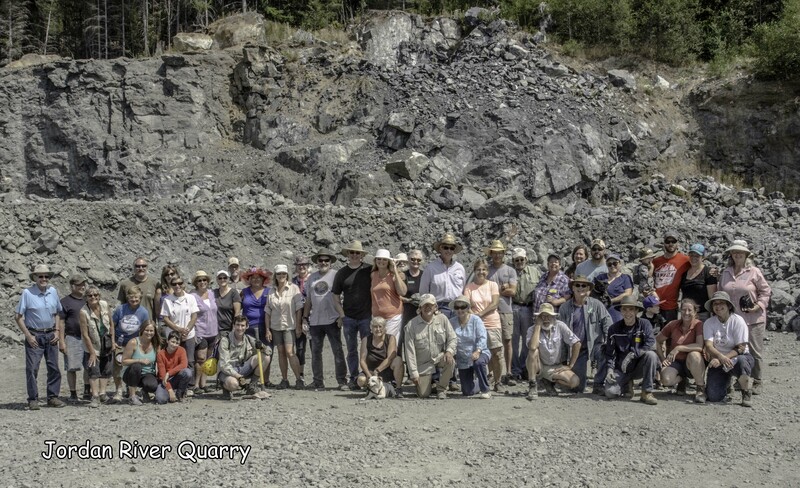 If you want to download full-resolution photos, please follow the full-resolution photo link for each event. If you have photos you would like to add to the albums, please send or share them to web@vlms.ca and I’ll be happy to add them in. 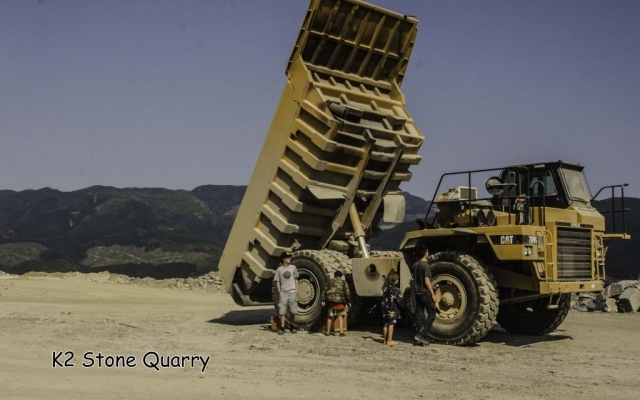 Photos with captions courtesy of Doug McLeod. 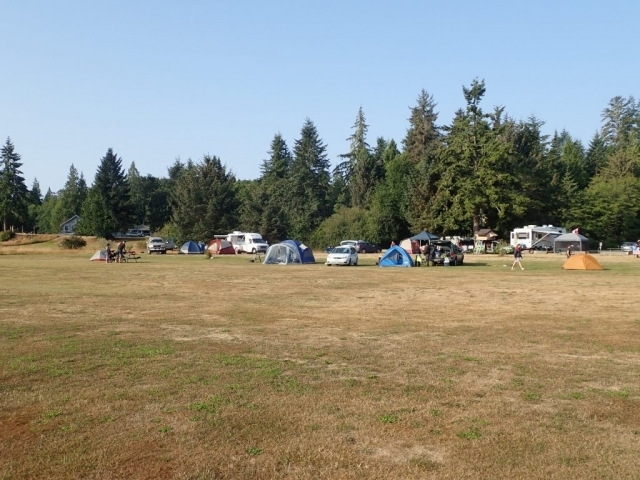 Well, after one and a half years of planning, the VLMS pulled off a darn good Gemboree. 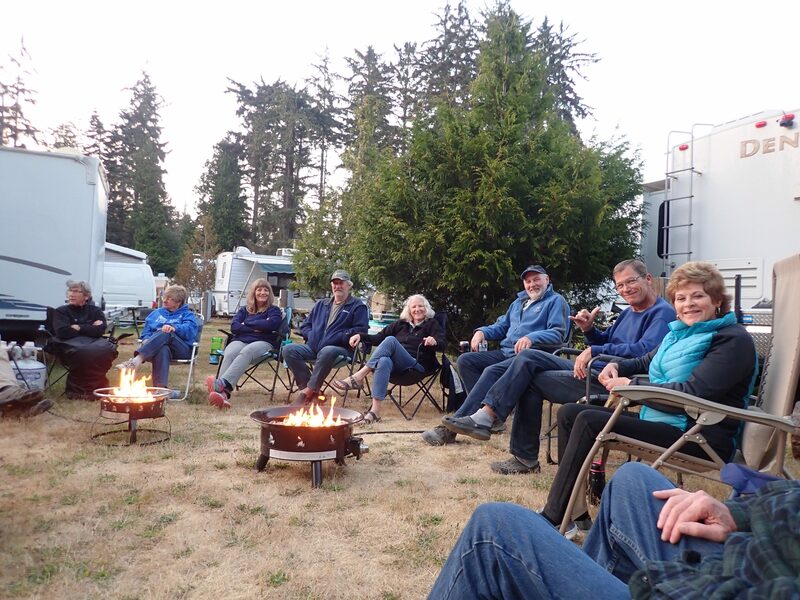 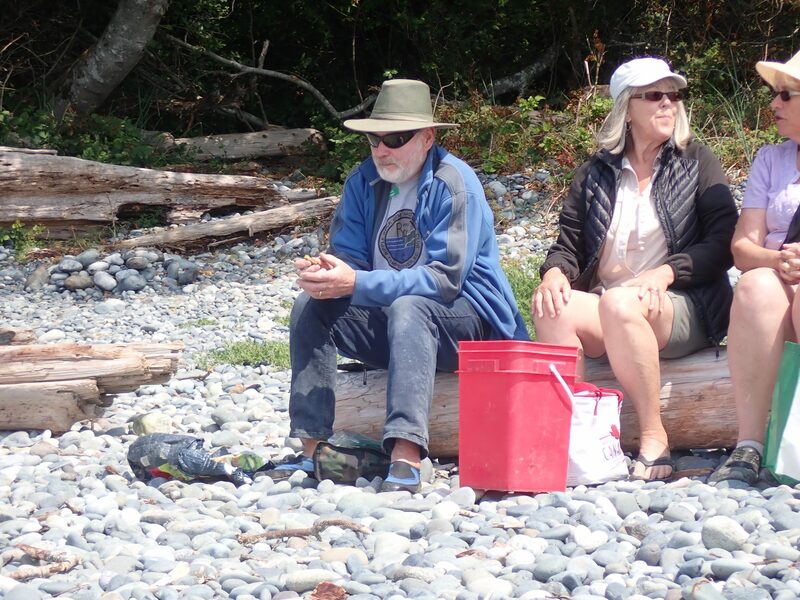 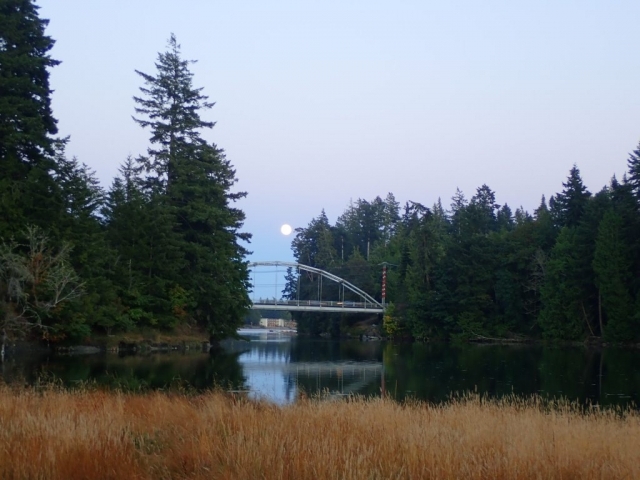 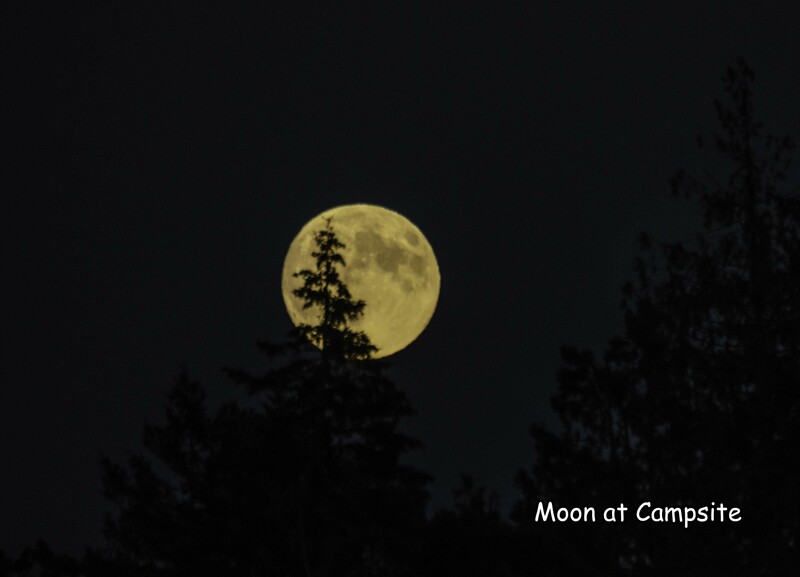 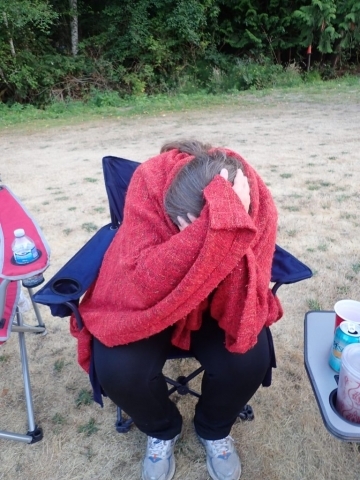 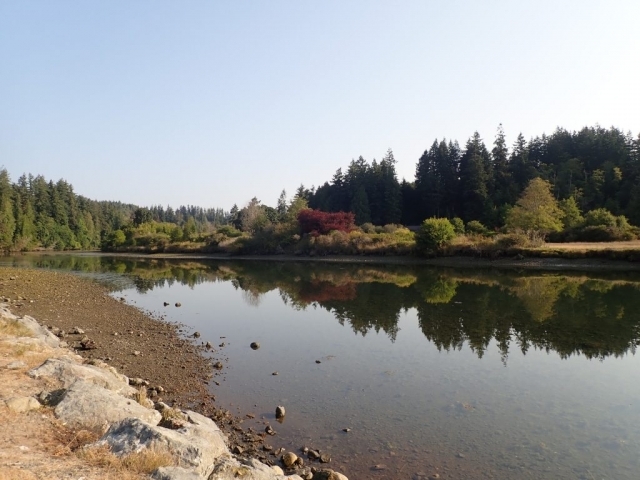 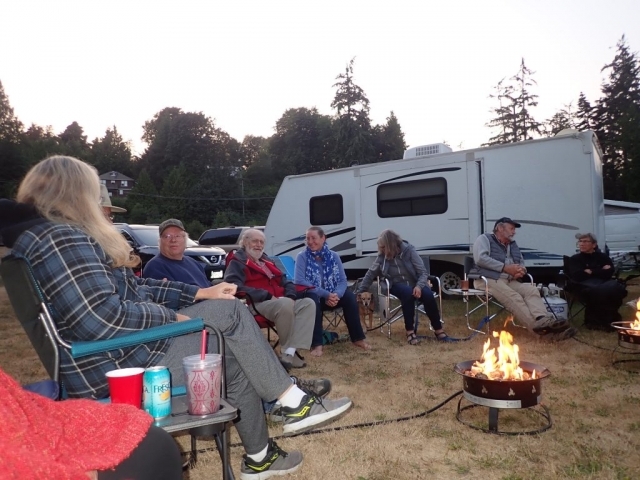 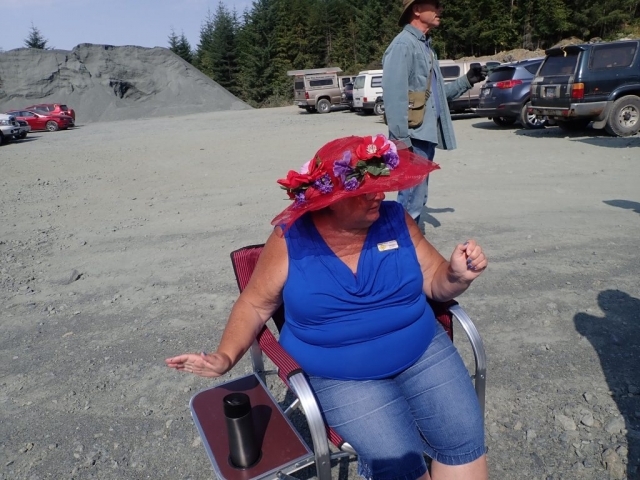 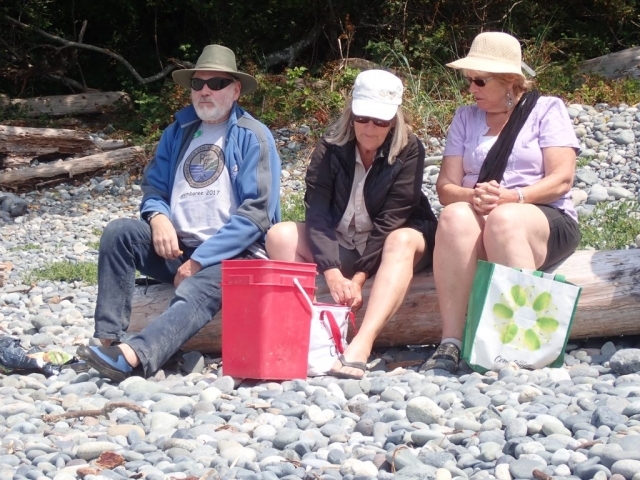 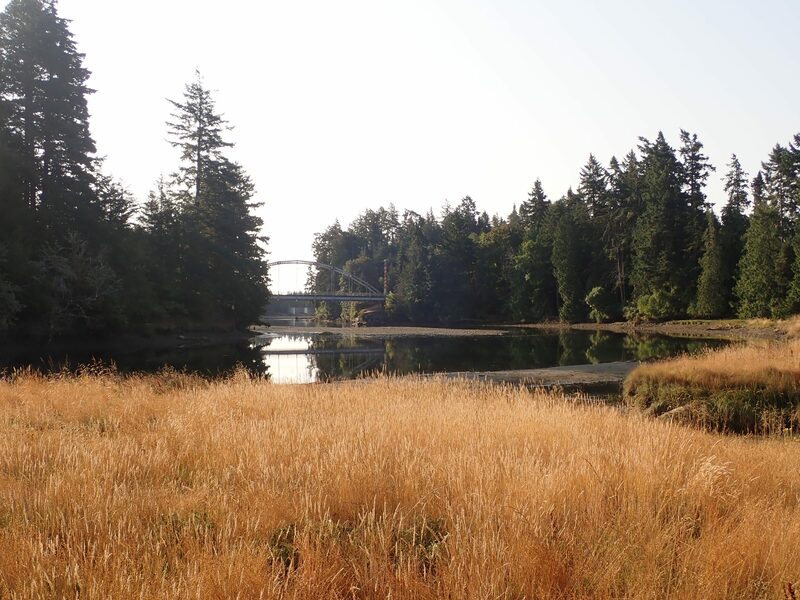 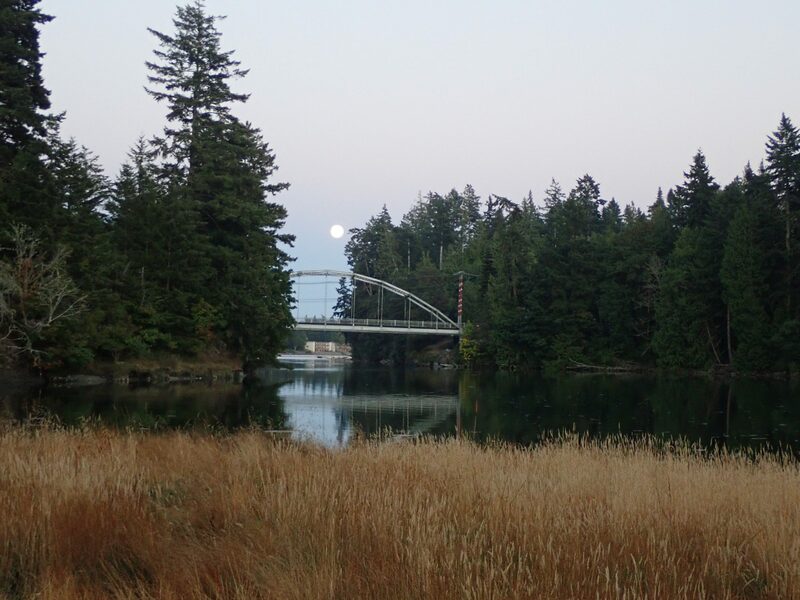 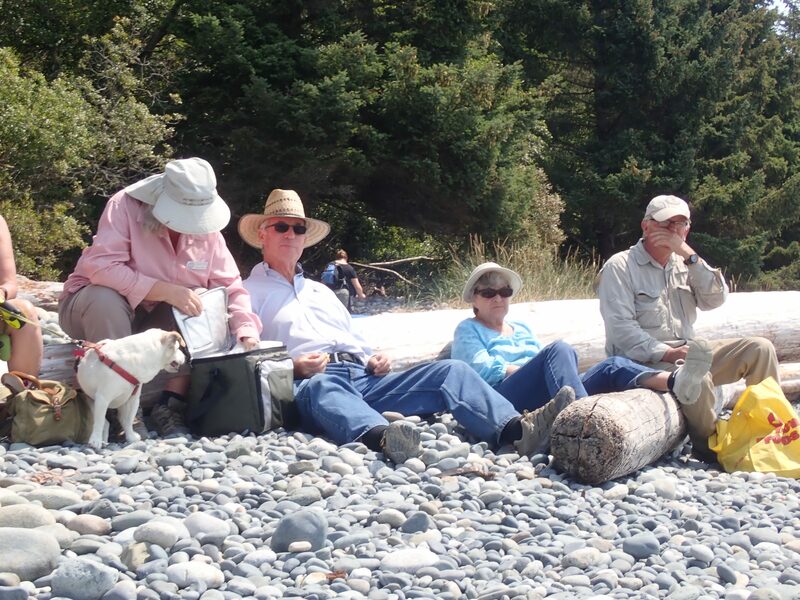 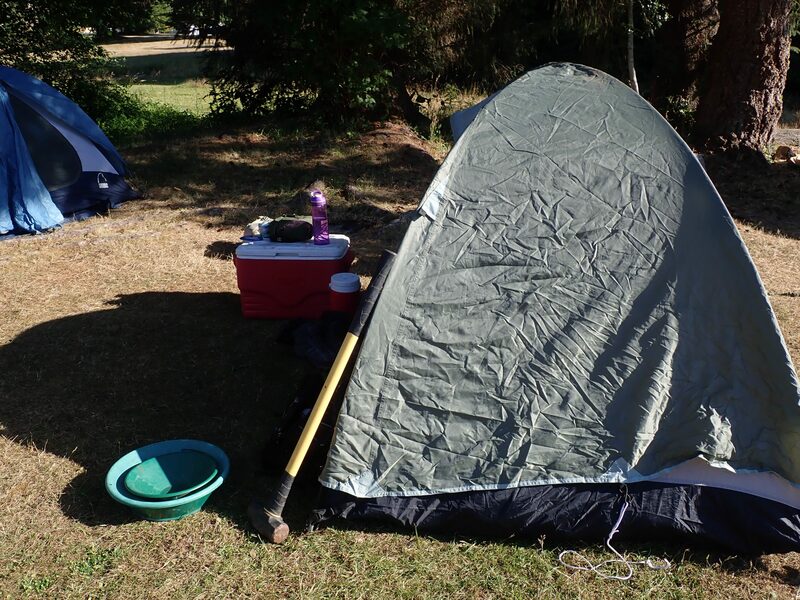 We had approximately 60 adults and 9 children attend the 3-day affair at the Sooke River Campgrounds. 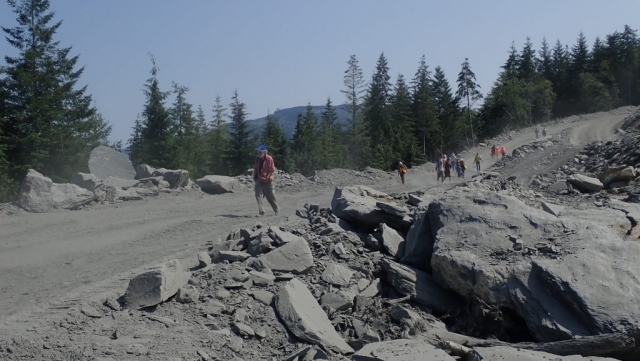 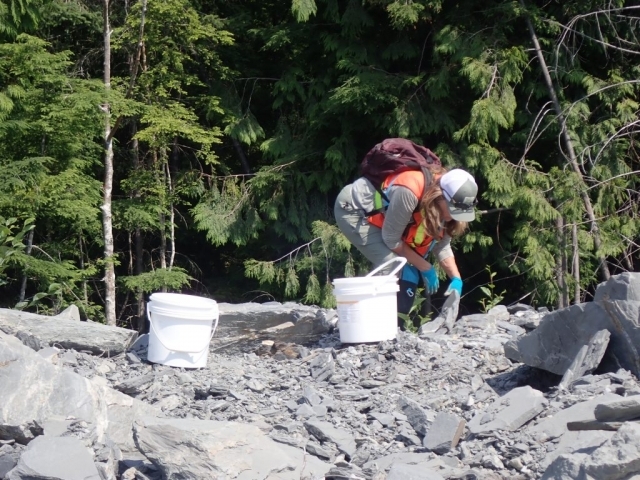 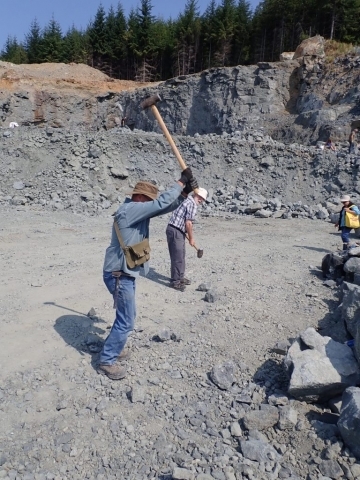 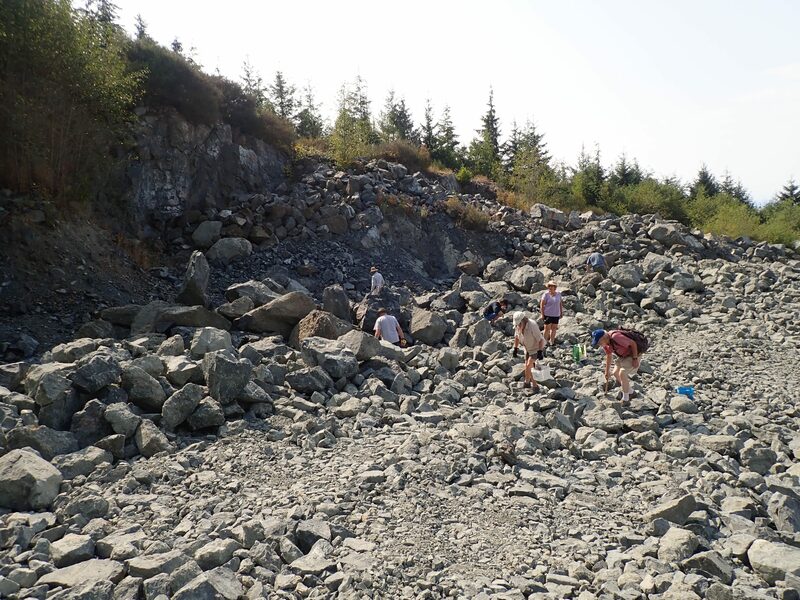 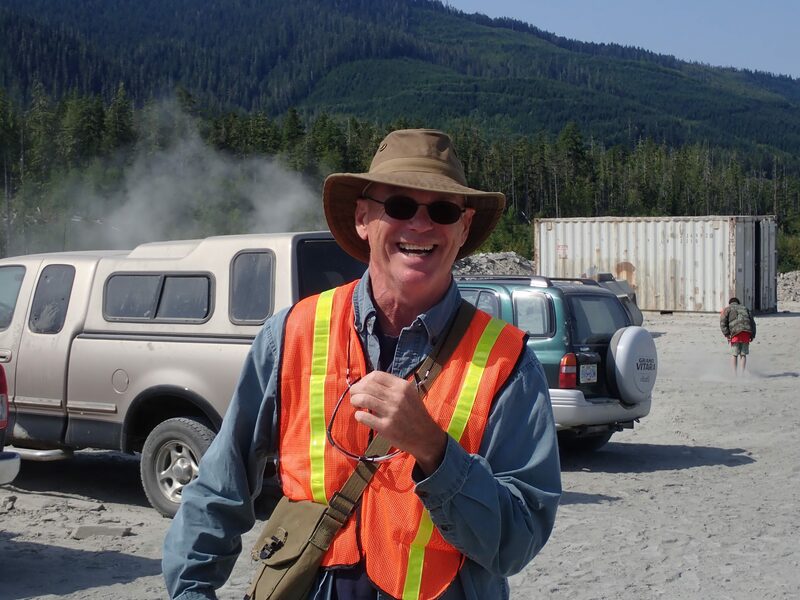 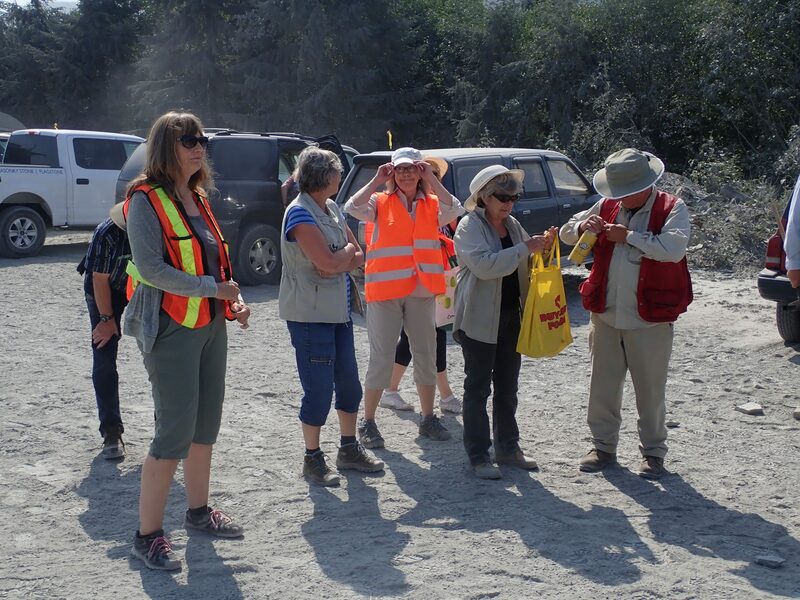 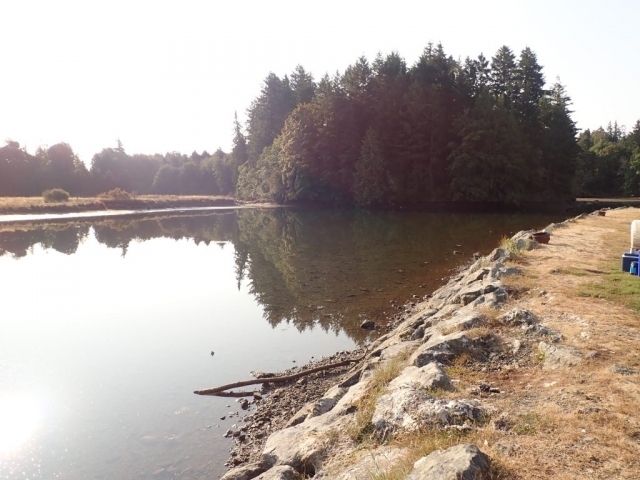 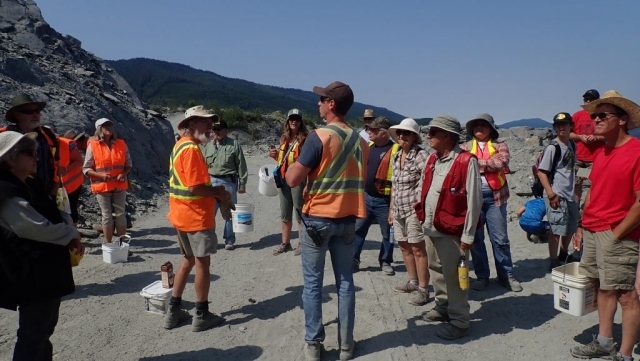 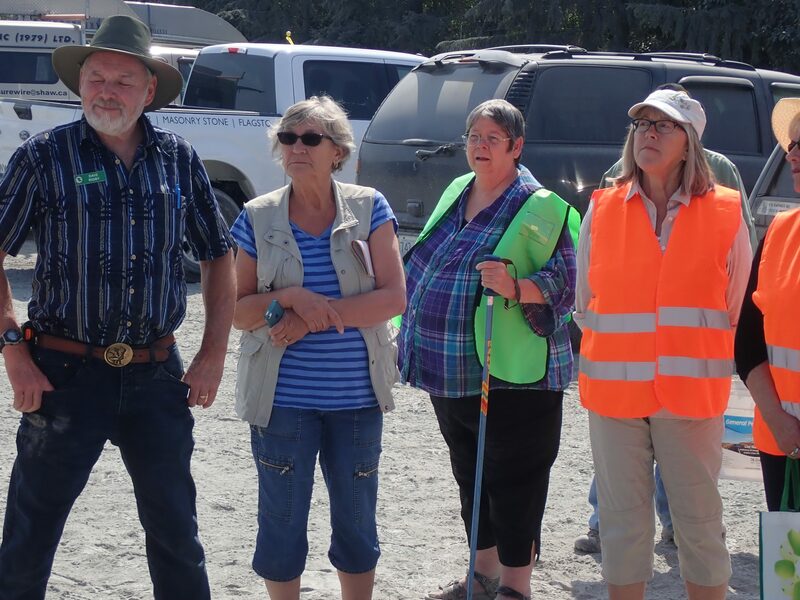 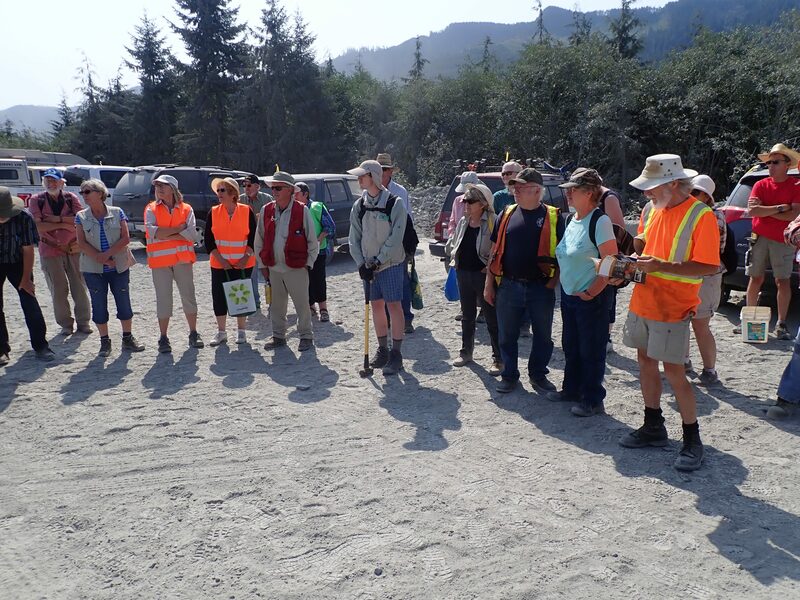 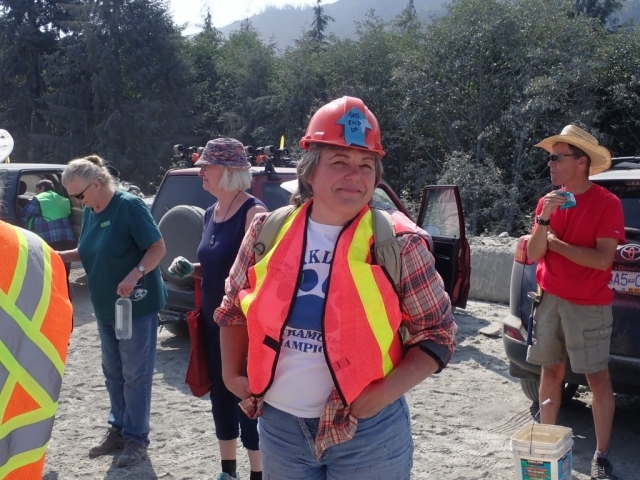 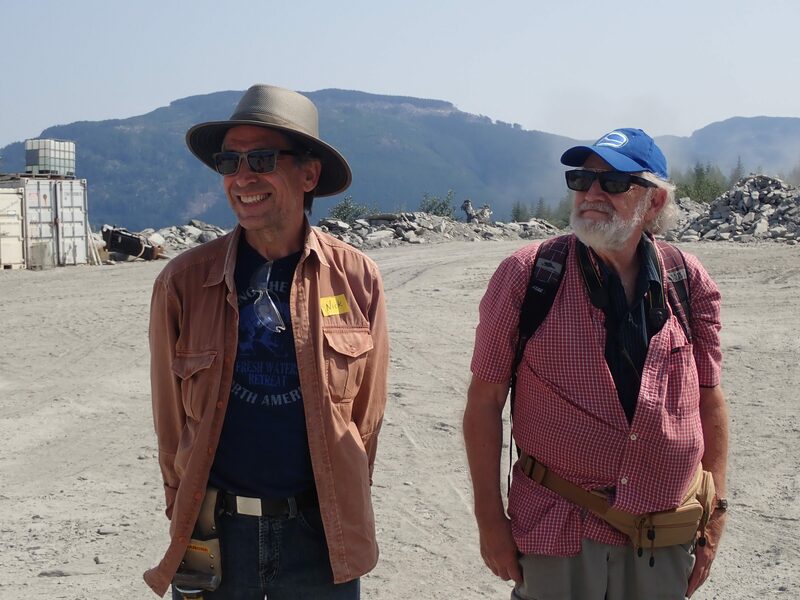 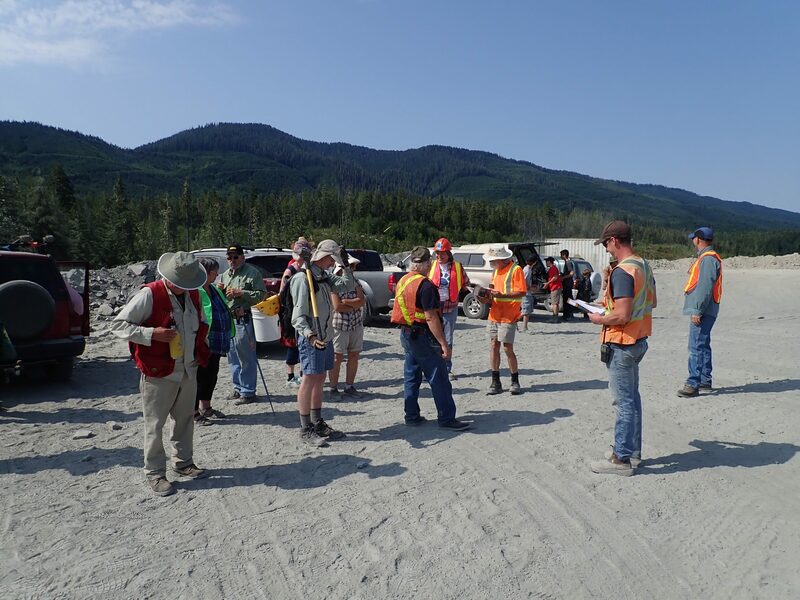 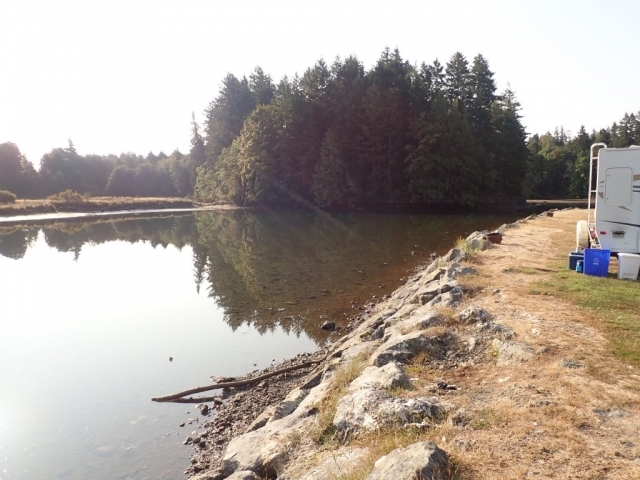 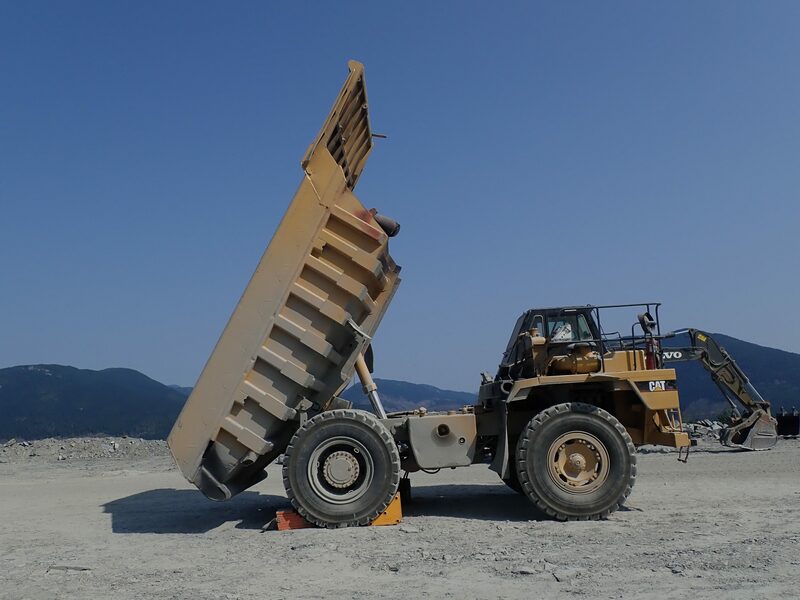 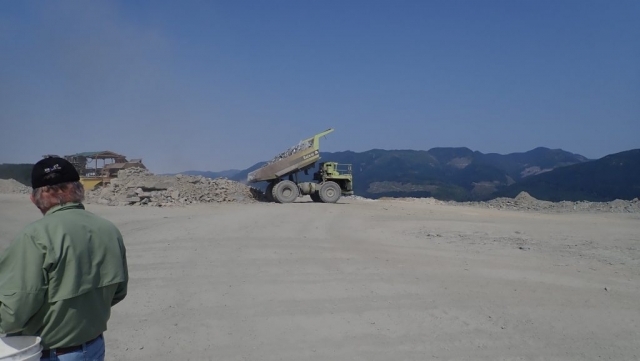 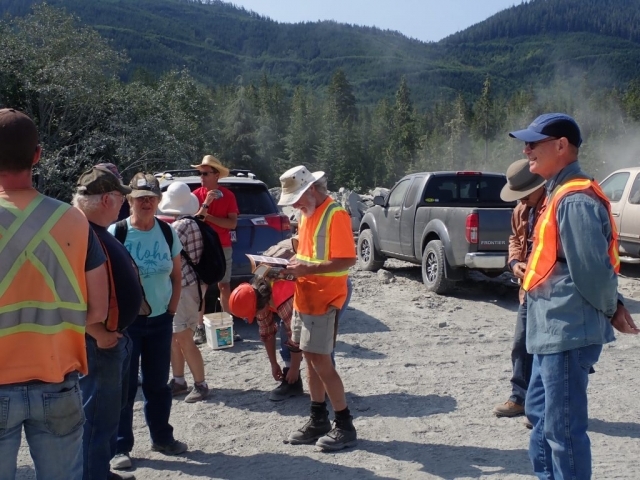 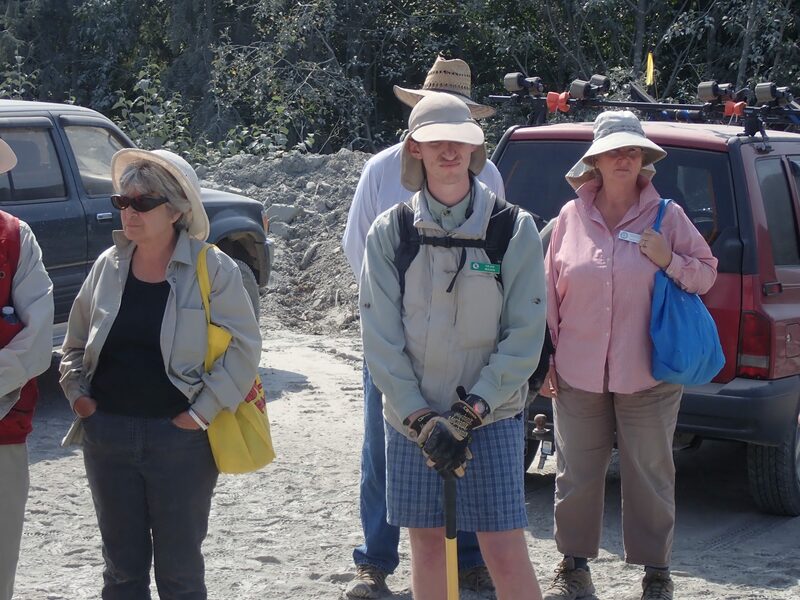 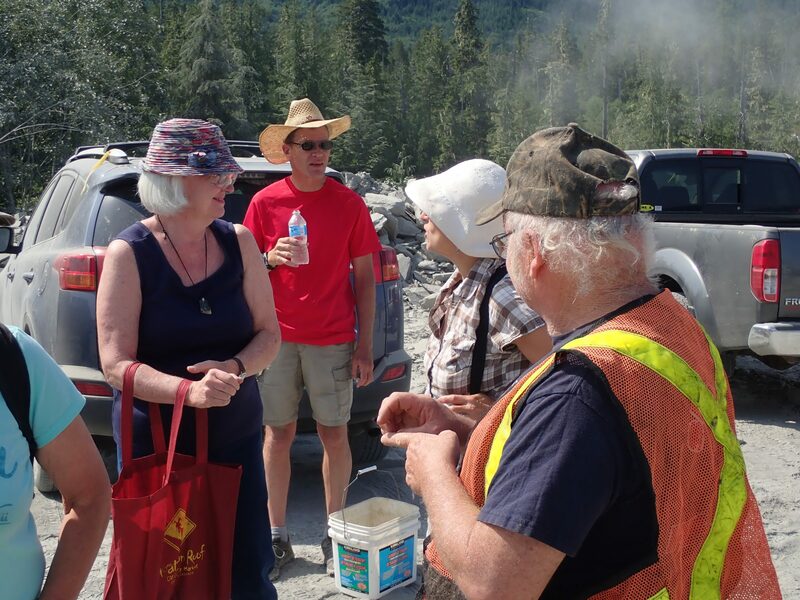 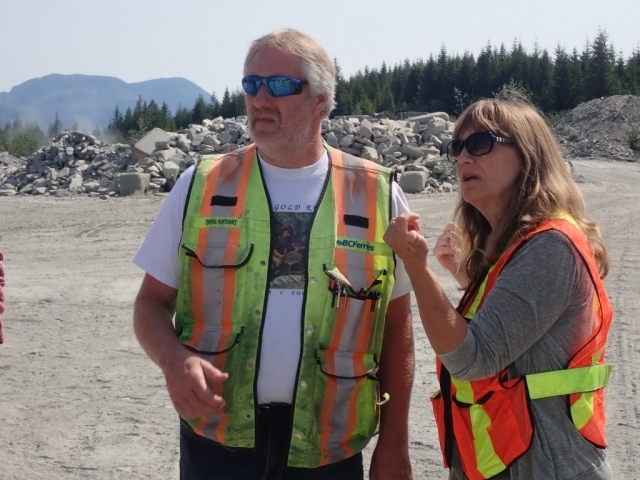 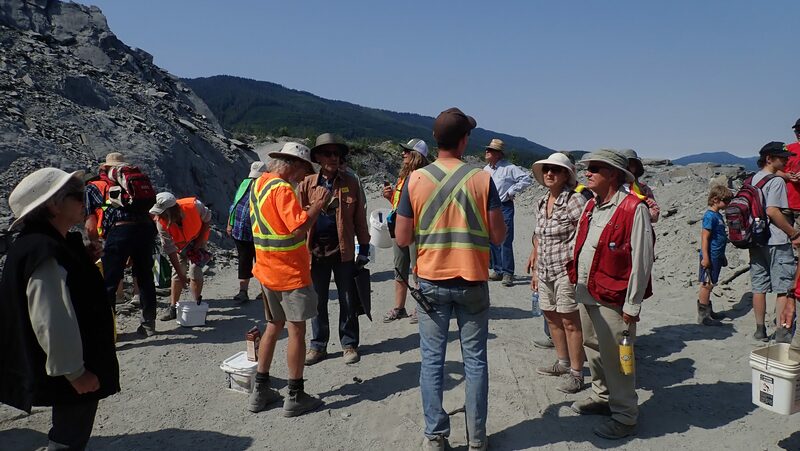 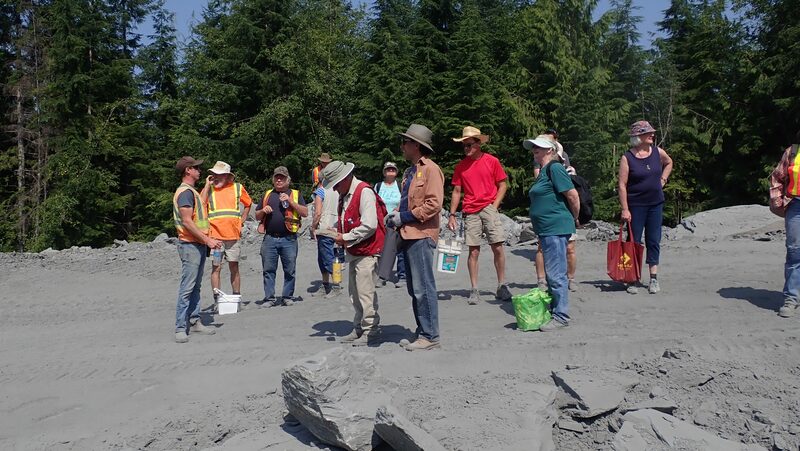 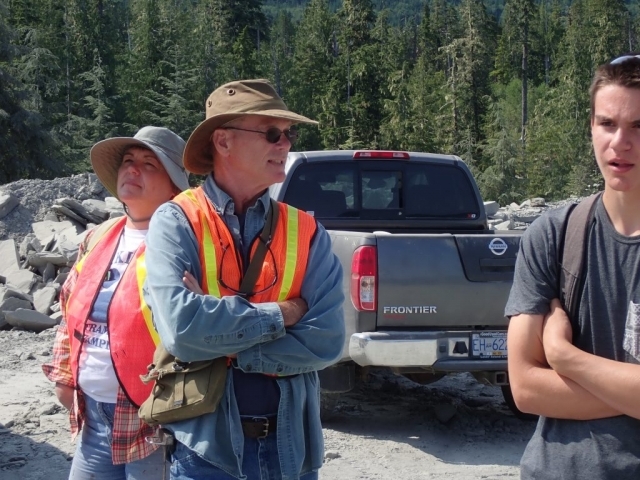 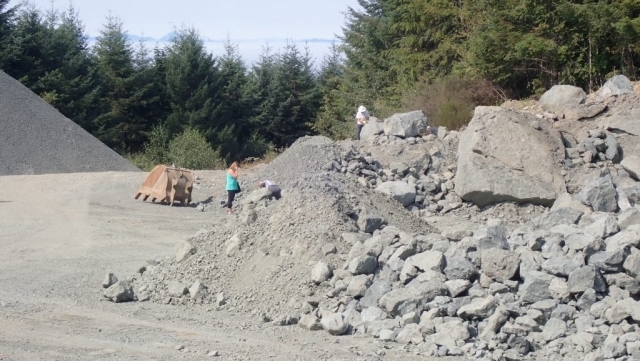 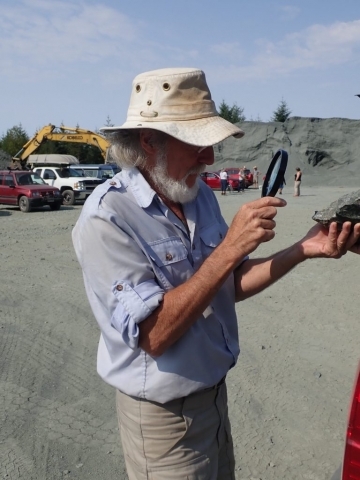 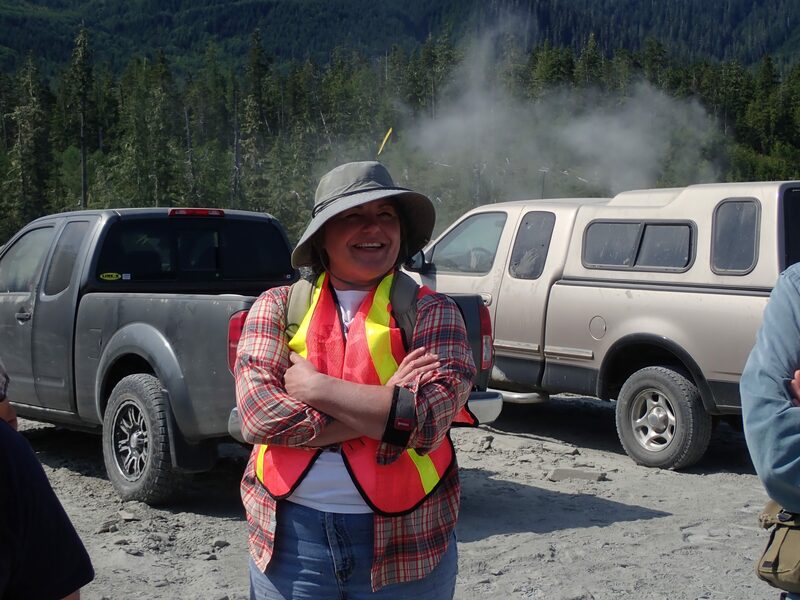 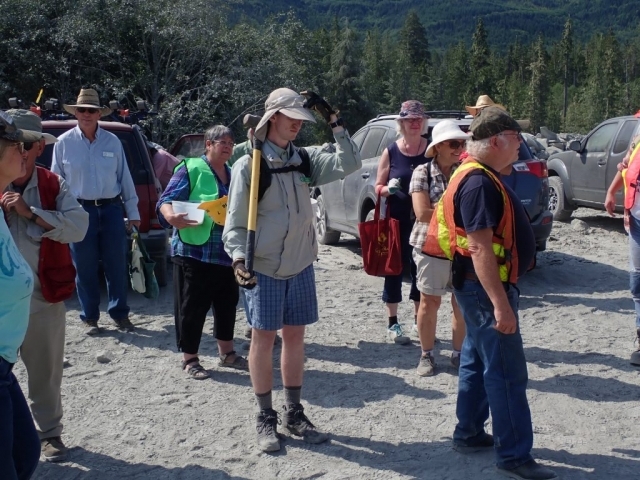 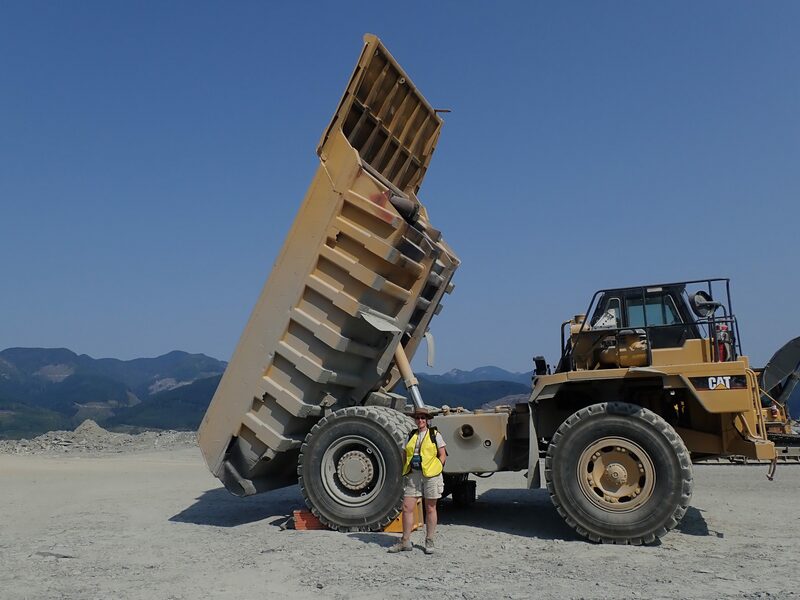 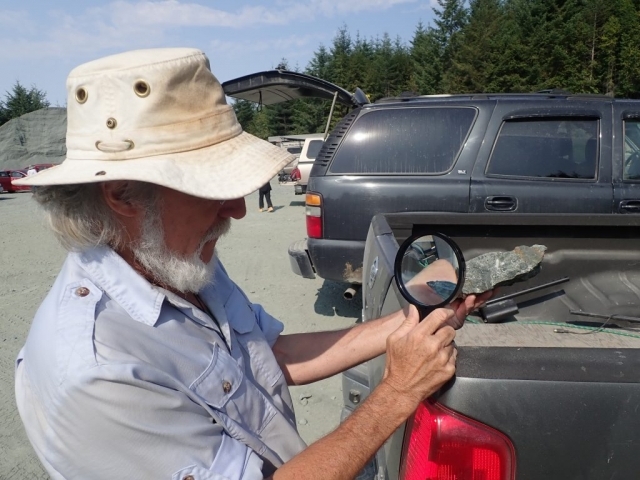 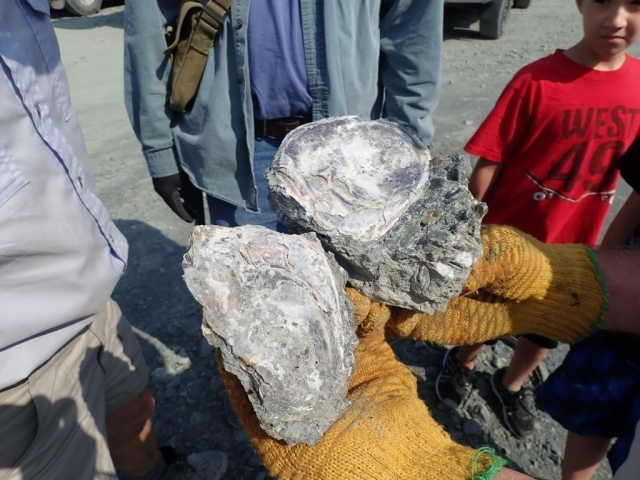 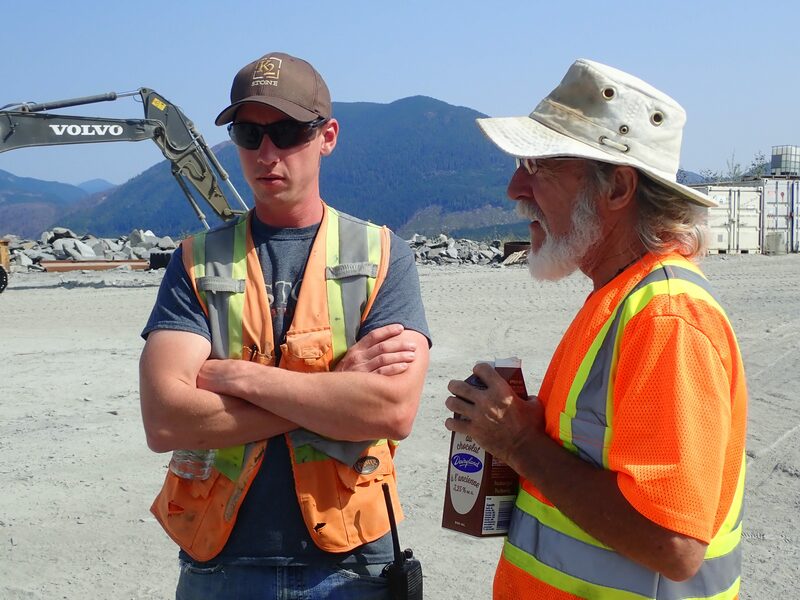 The morning was hot and filled with anticipation as our newly-appointed wagon master Bill Needoba led us to the K2 Ocean Pearl Quarry on Mosquito Creek near Port Renfrew. 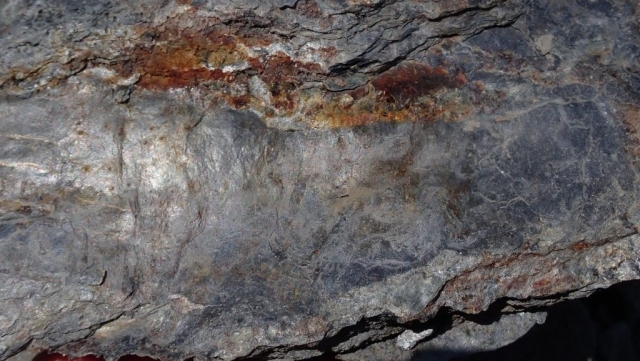 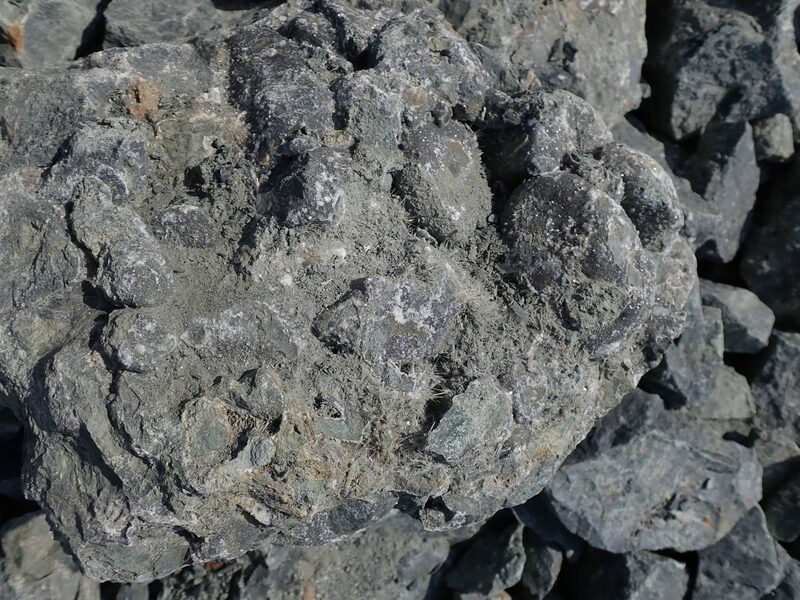 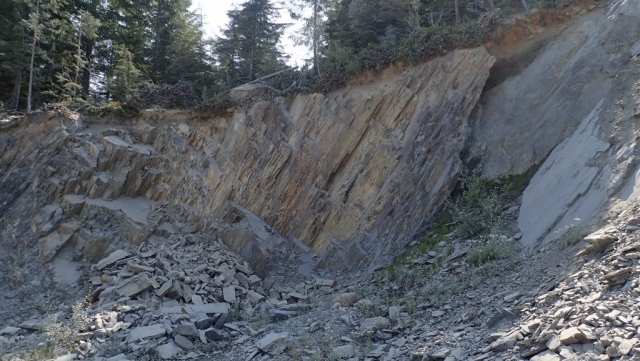 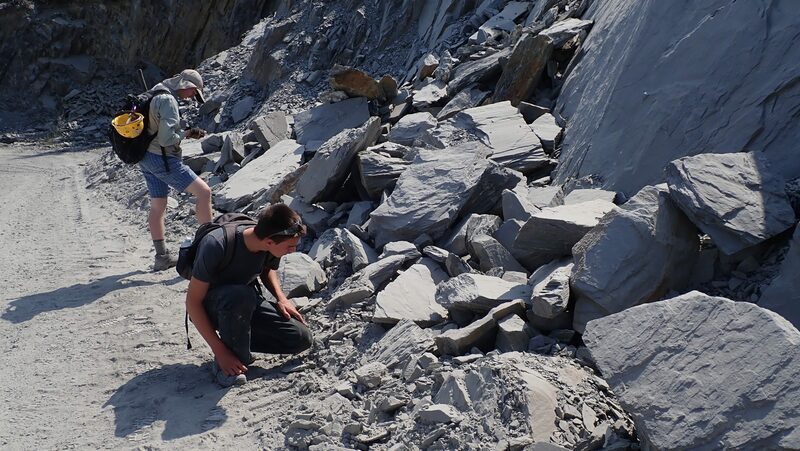 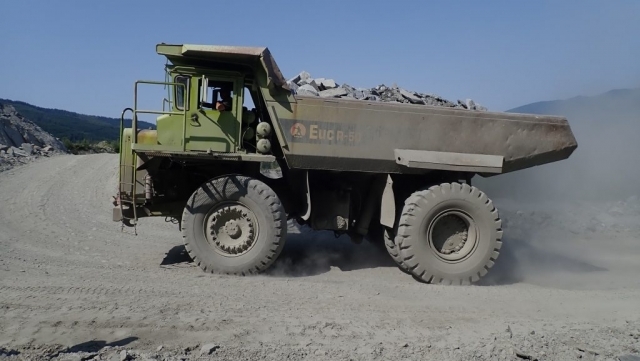 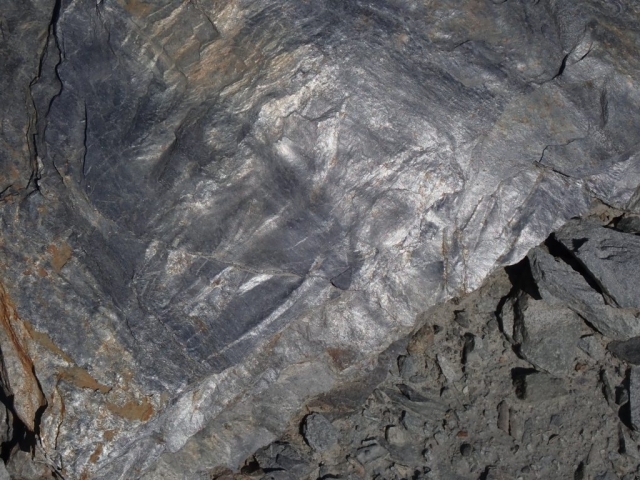 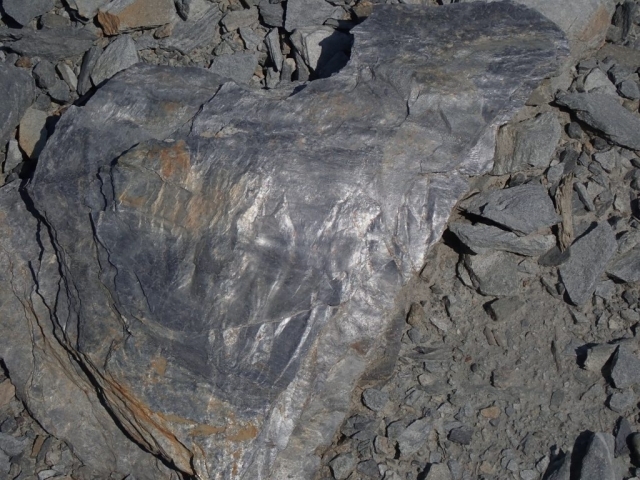 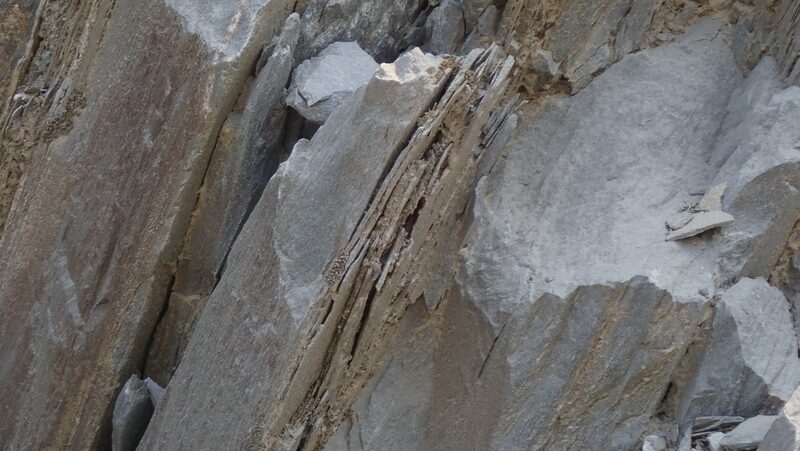 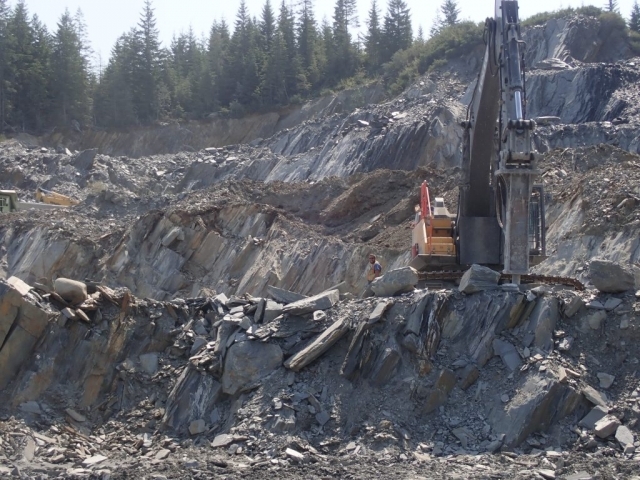 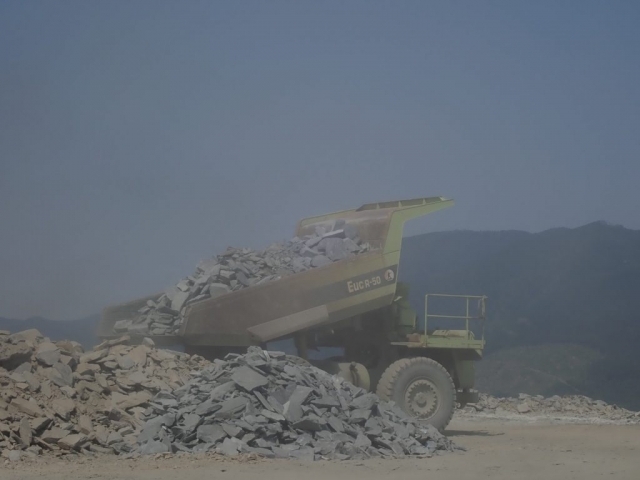 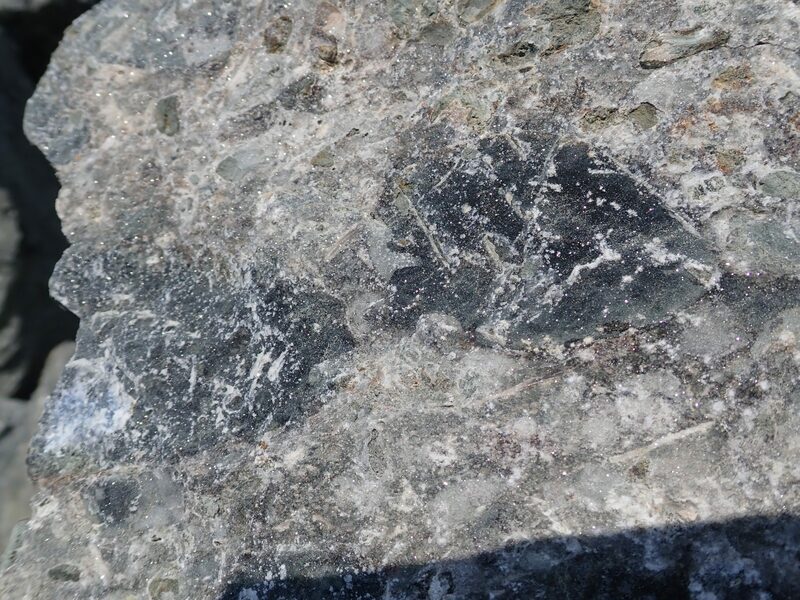 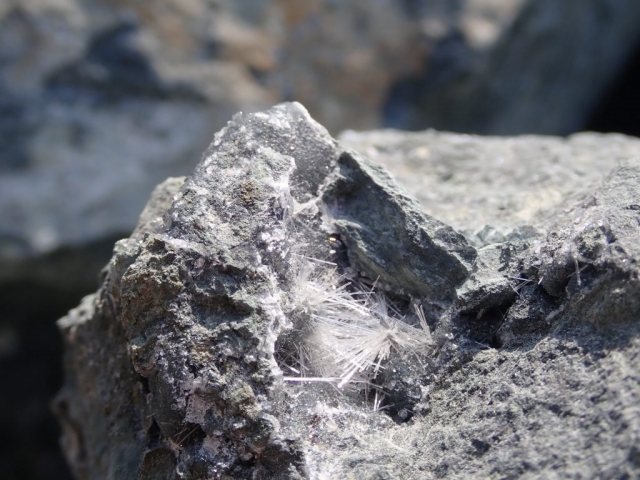 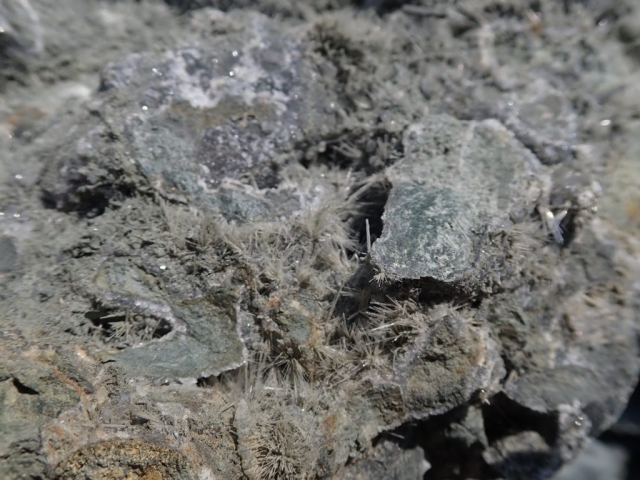 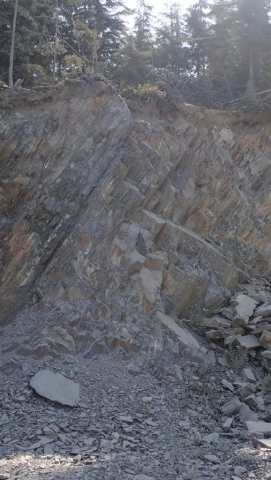 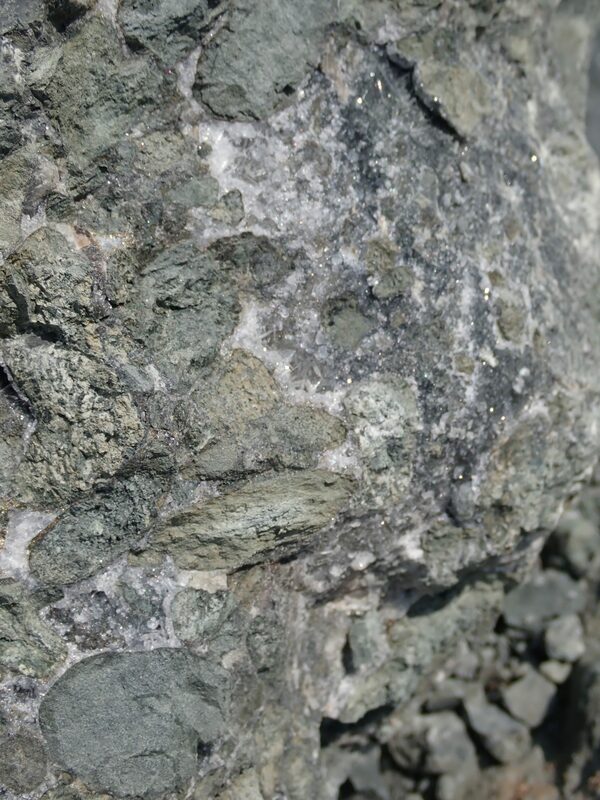 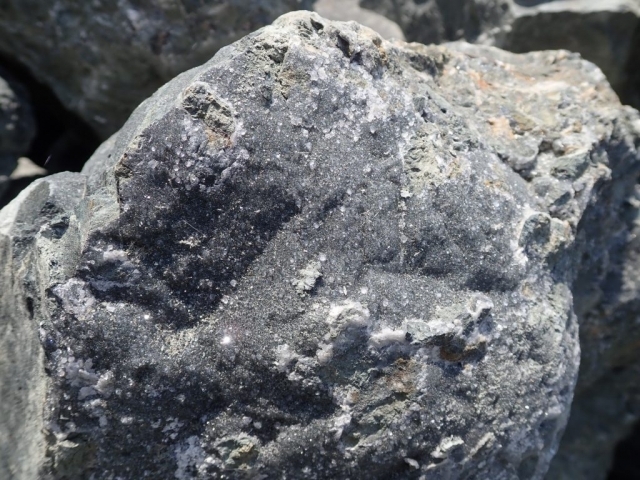 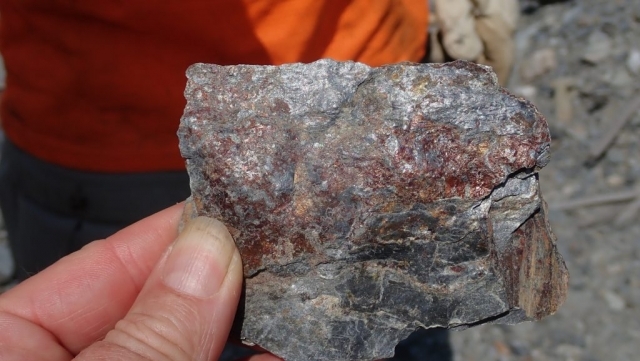 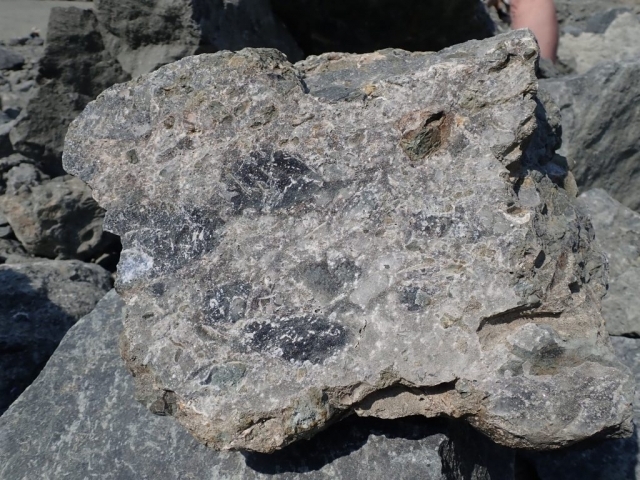 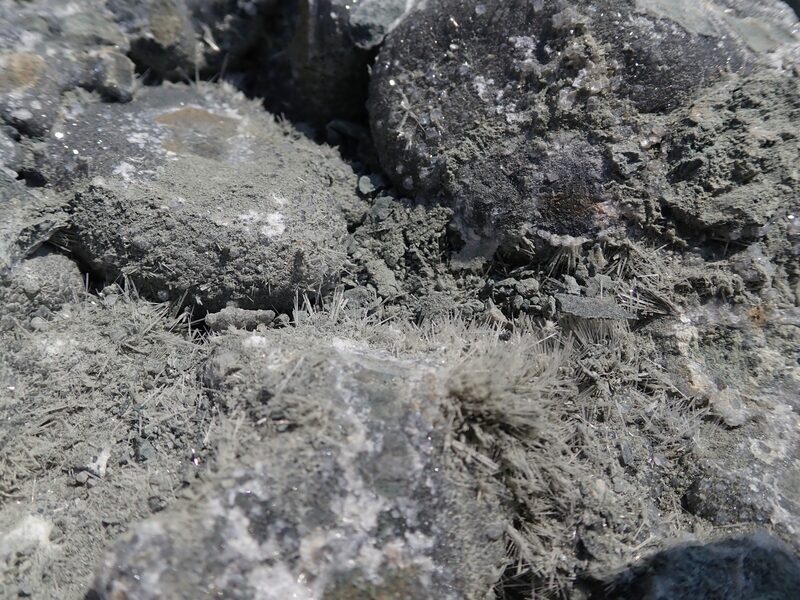 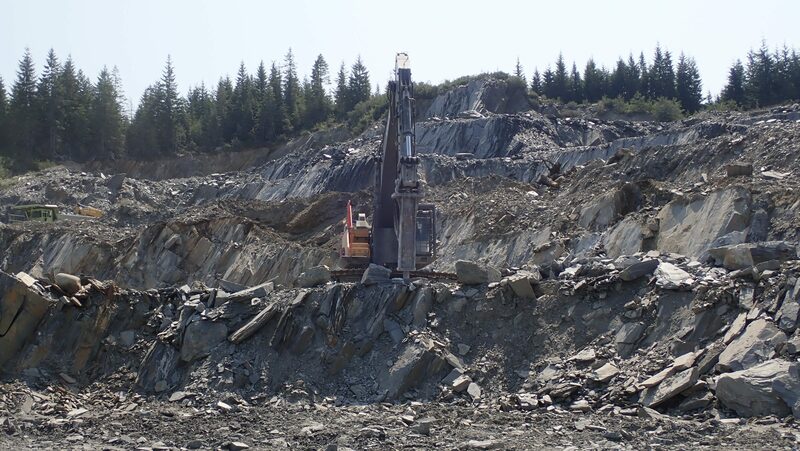 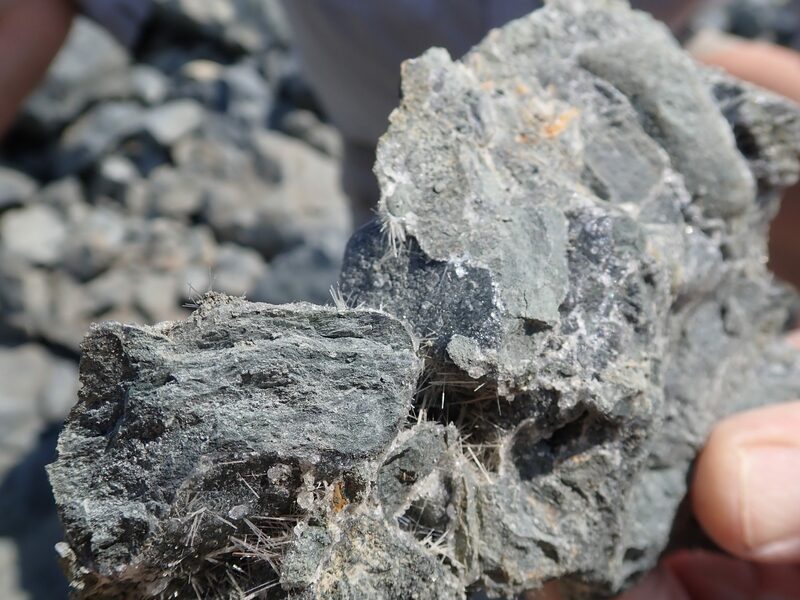 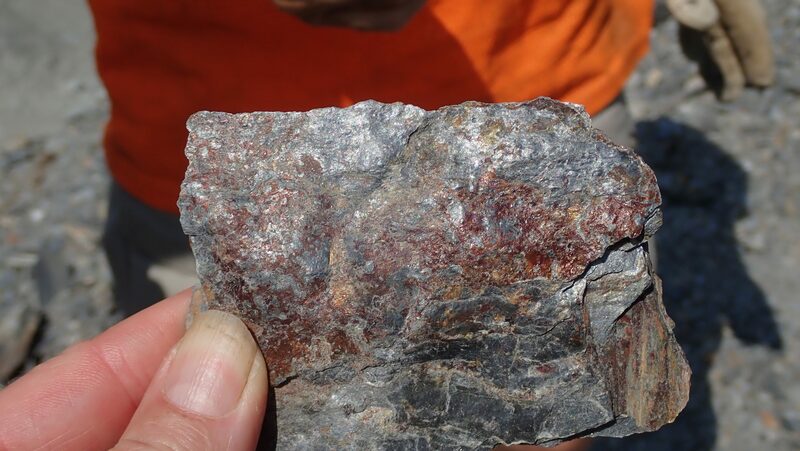 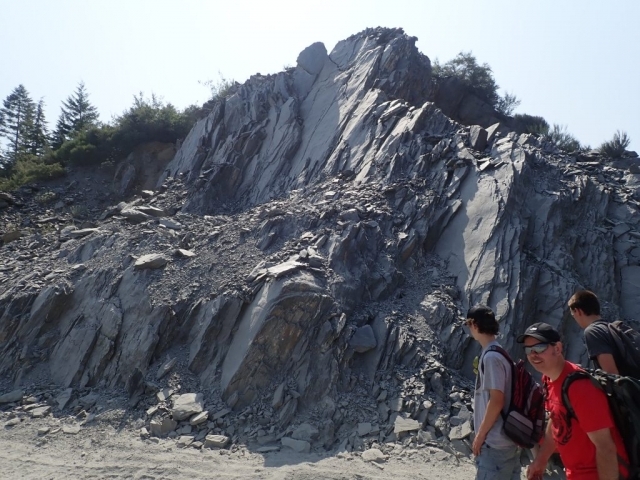 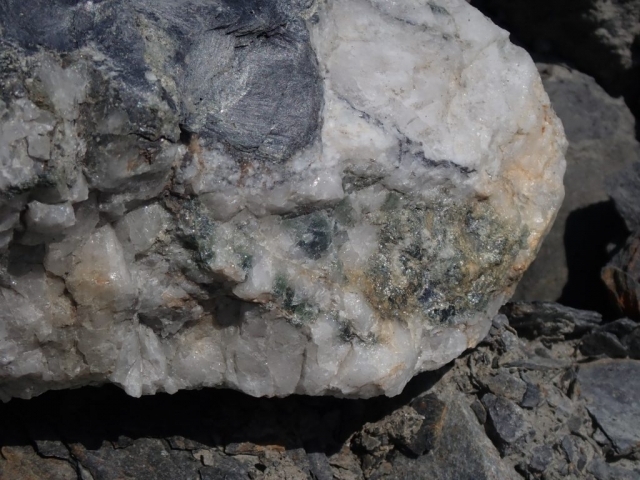 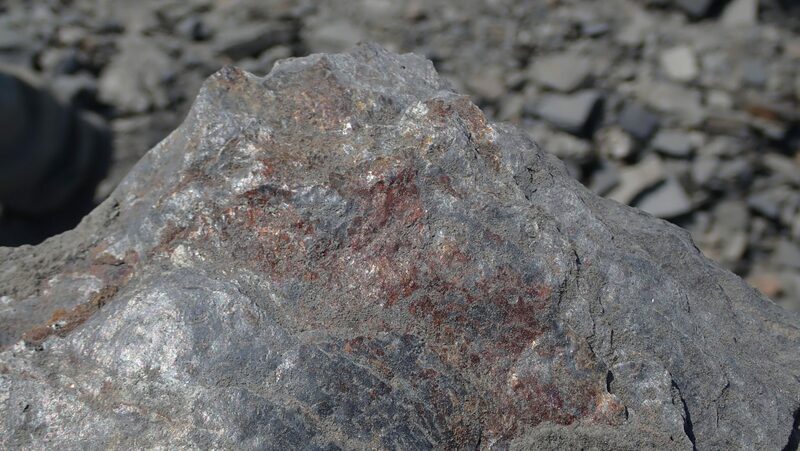 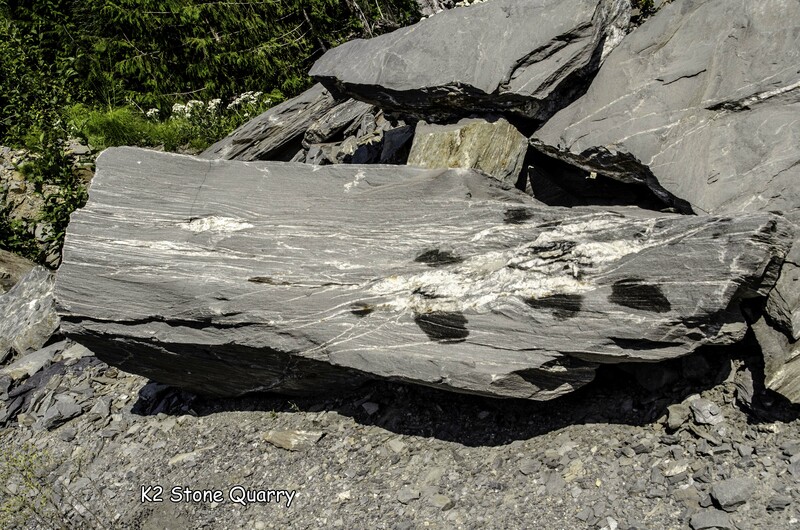 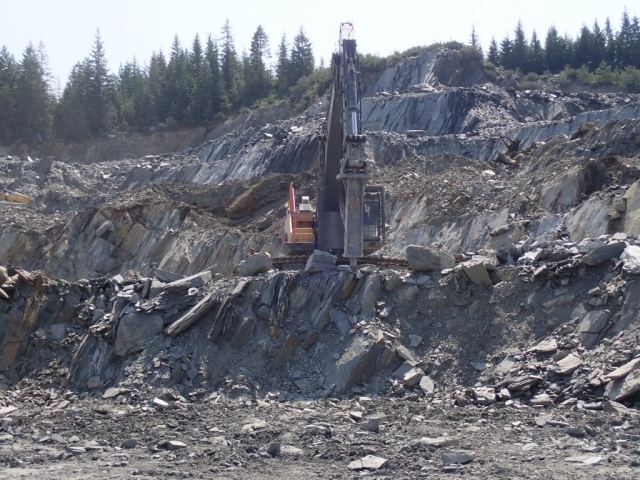 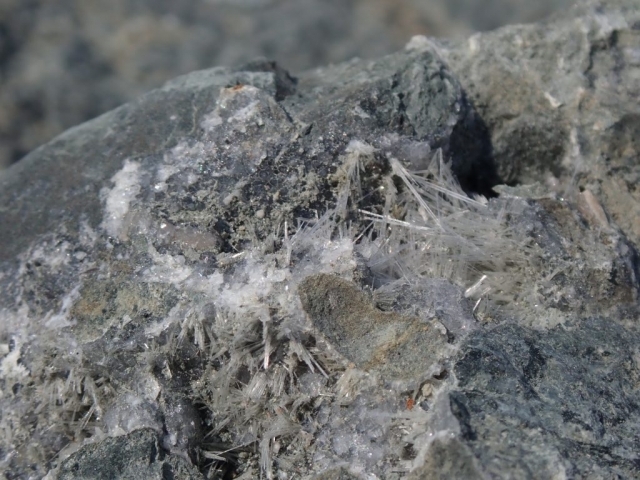 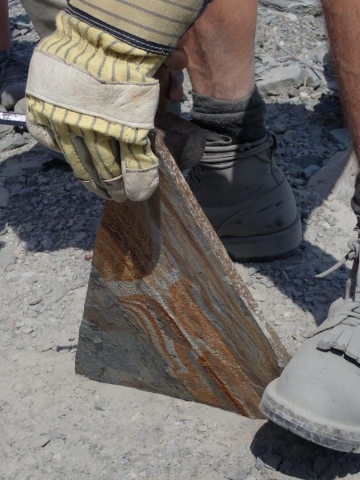 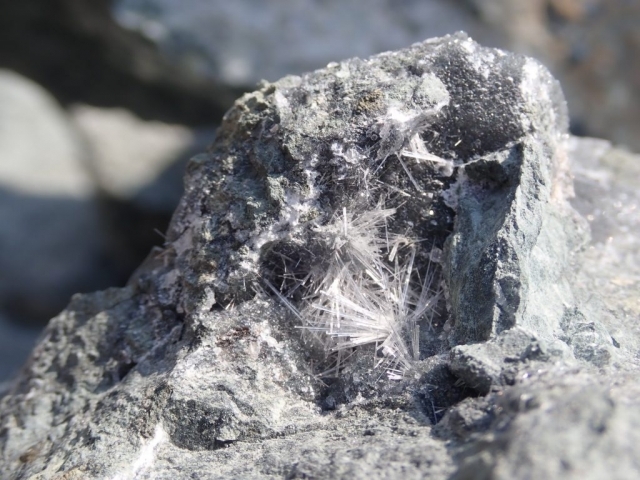 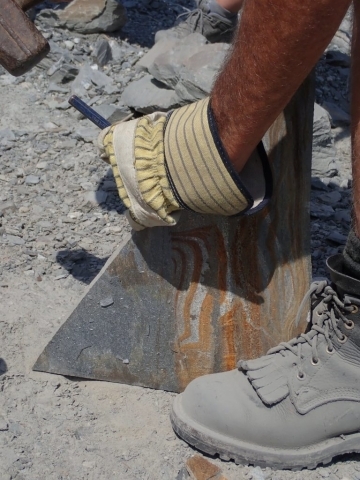 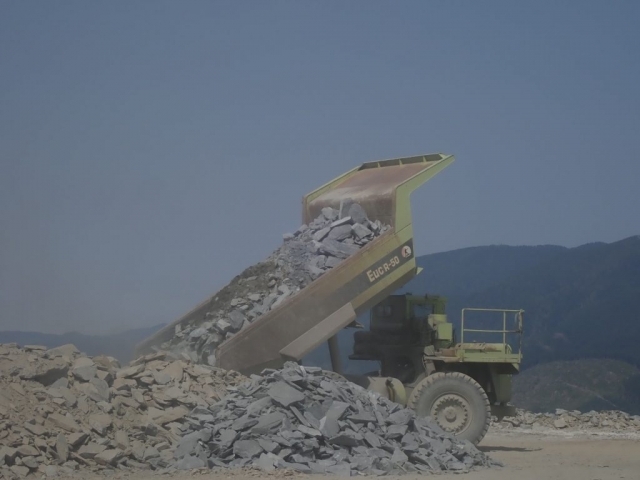 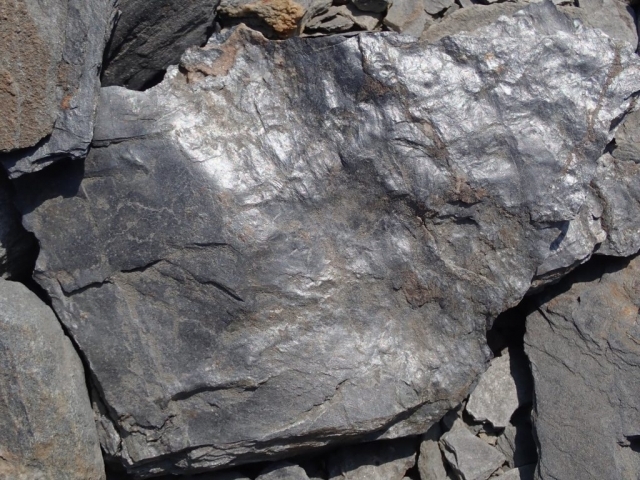 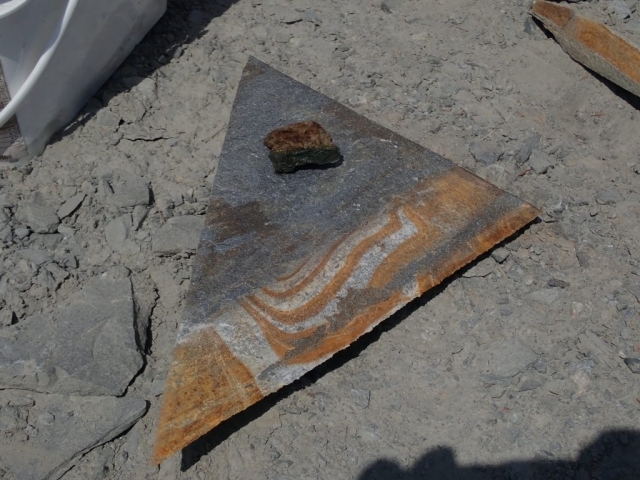 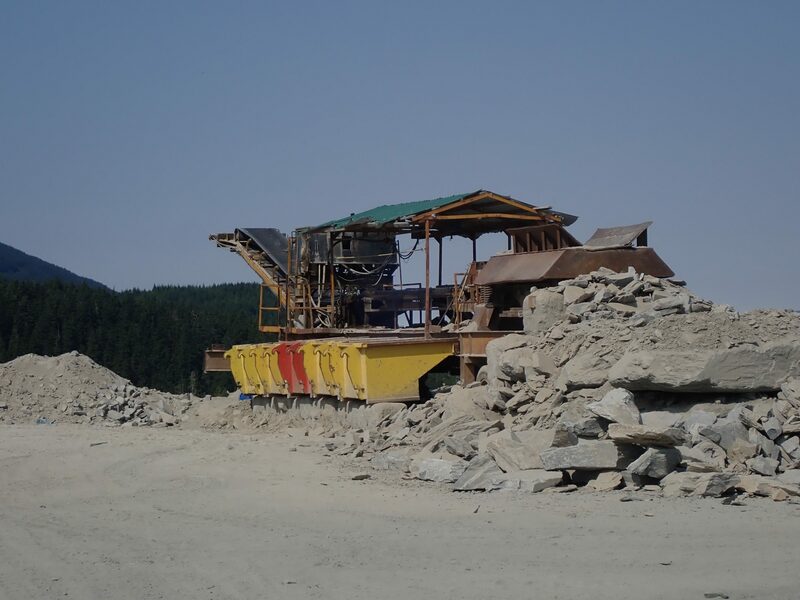 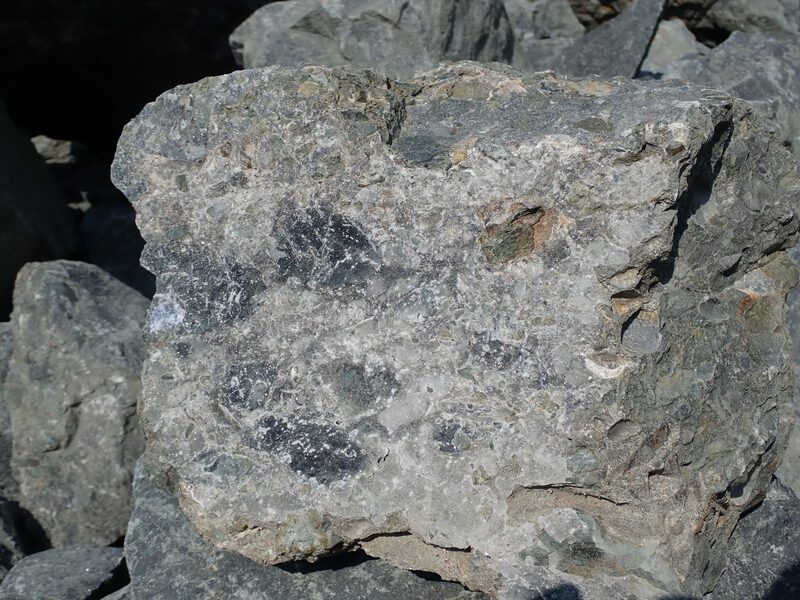 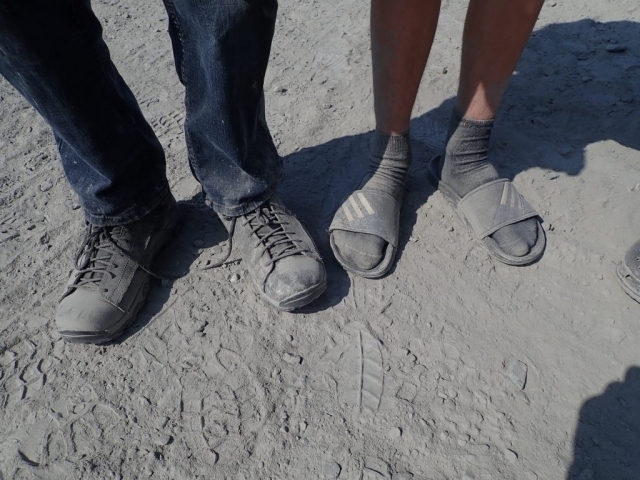 There we learned that K2 has 3 different kinds of slate at their quarry: (i) black, oily slate – good for construction and aggregate material, (ii) a light blue-gray, and (iii) a dark gray. Both the latter two types are desirable for stone products. 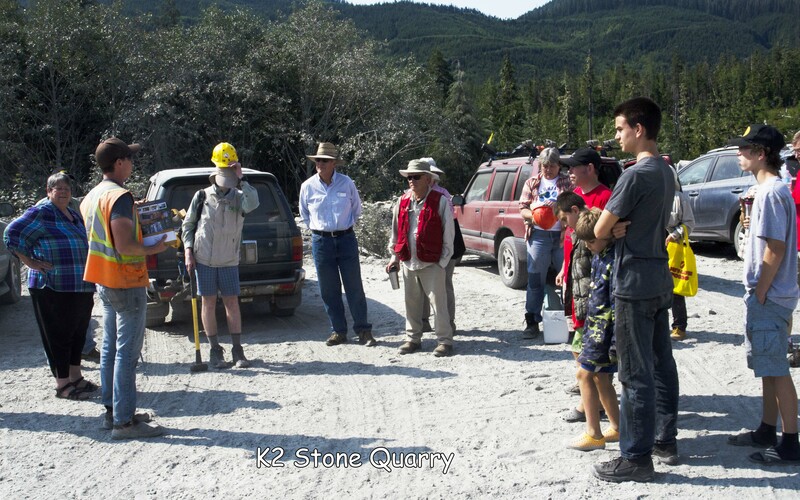 Matt Girard was our guide and explained all the processes needed to take the stone out of the ground and then to market. 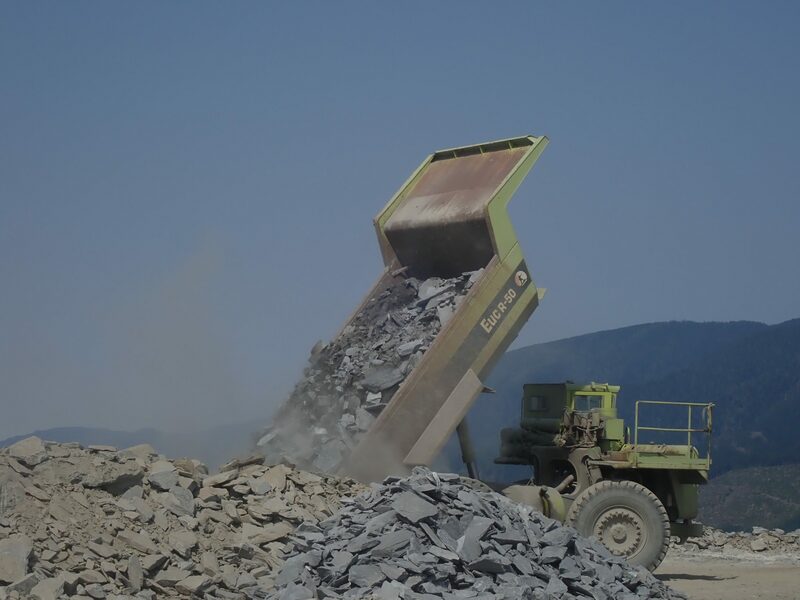 Any excess or unwanted material is used in conjunction with concrete and other aggregate, so nothing is wasted. 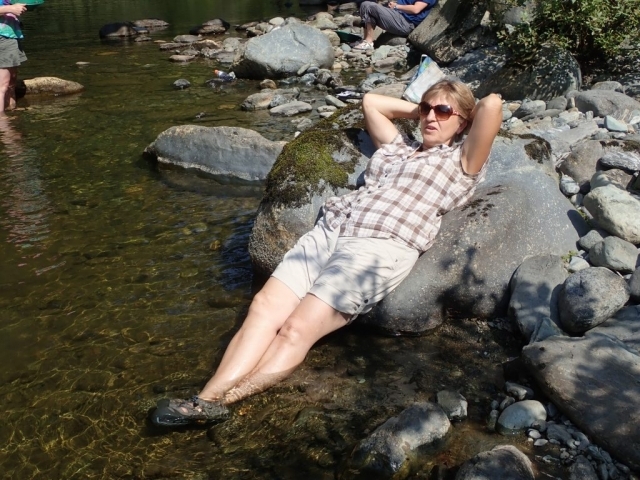 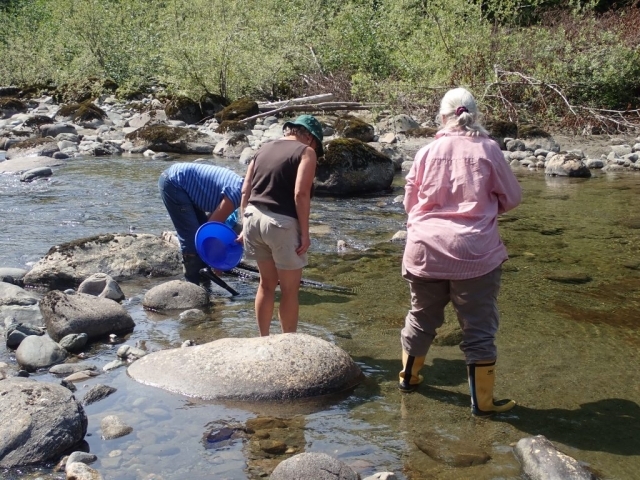 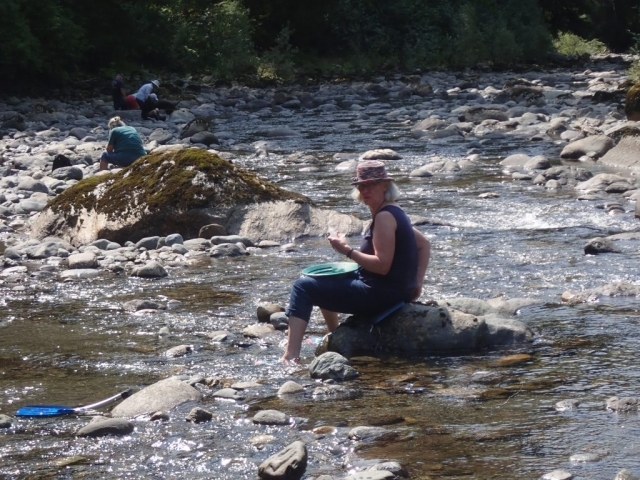 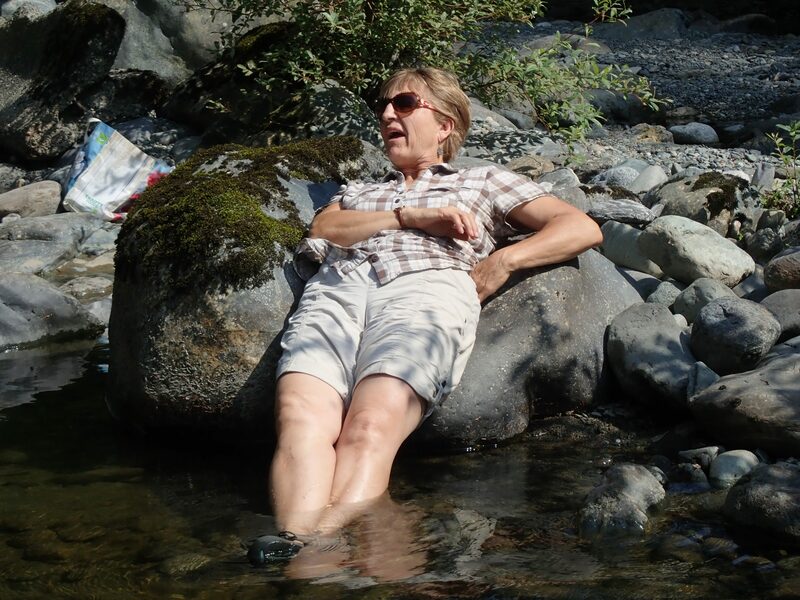 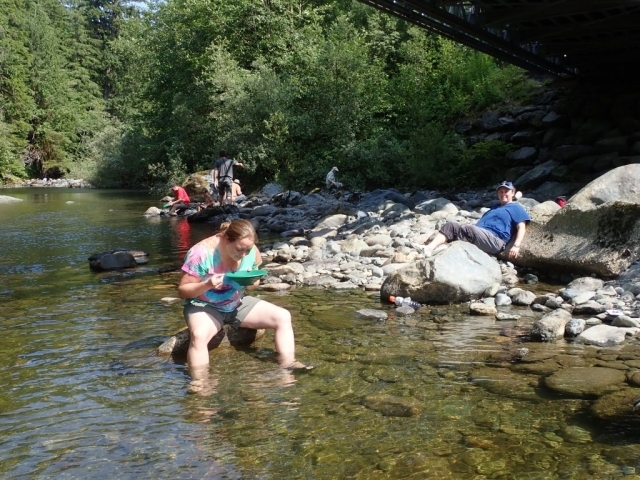 Our afternoon was spent gold-panning in more temperate climes at Loss Creek. 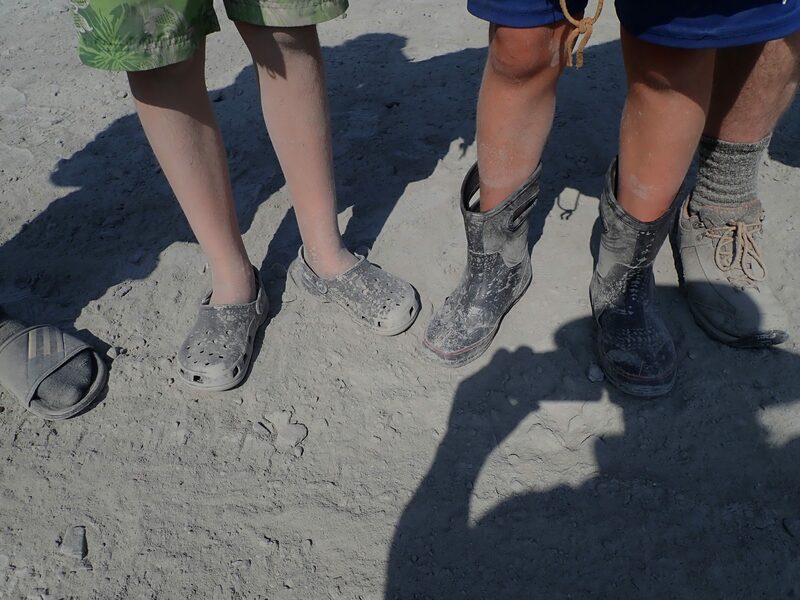 The water was definitely welcomed in comparison to our dry hot morning quarry run. 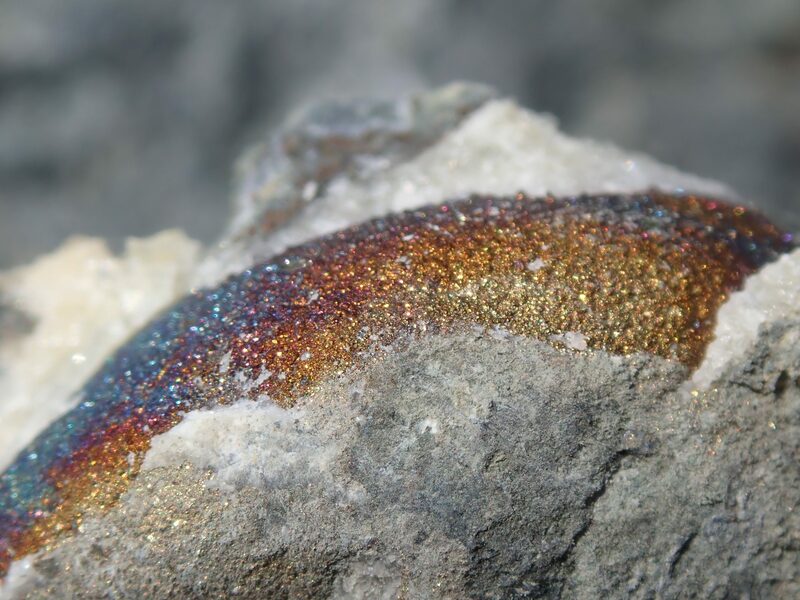 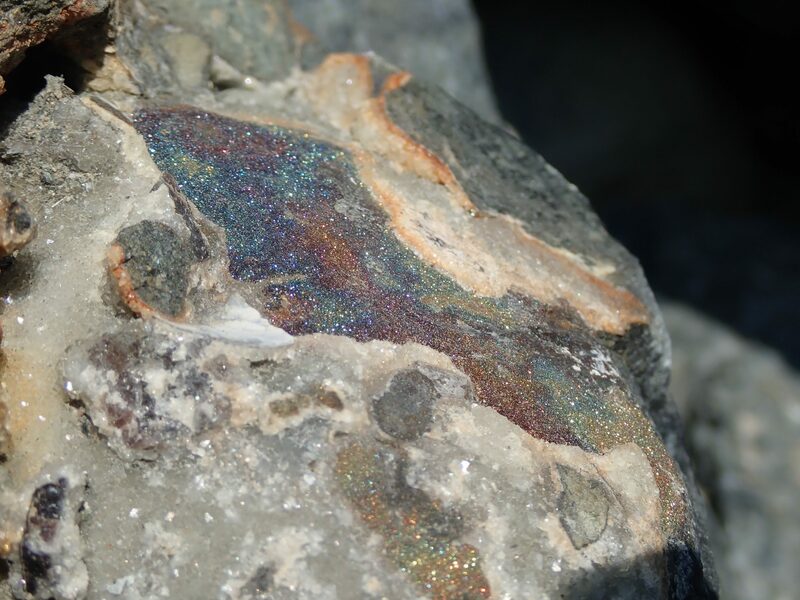 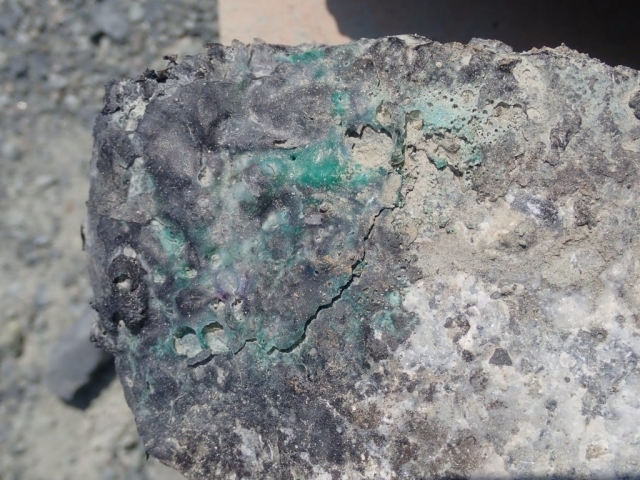 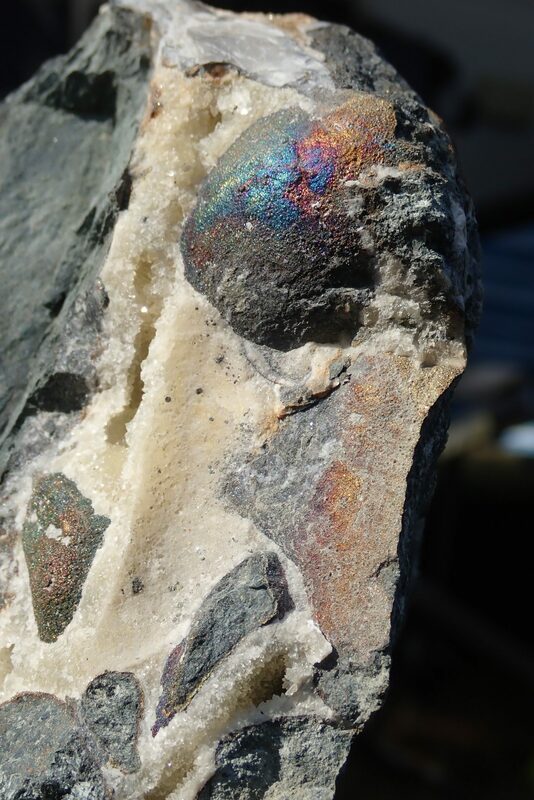 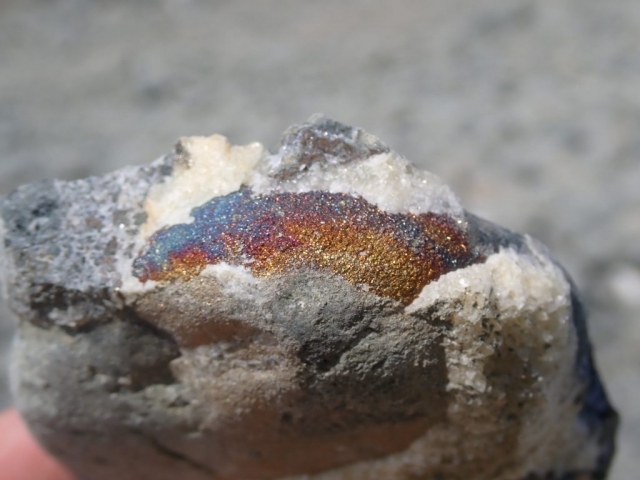 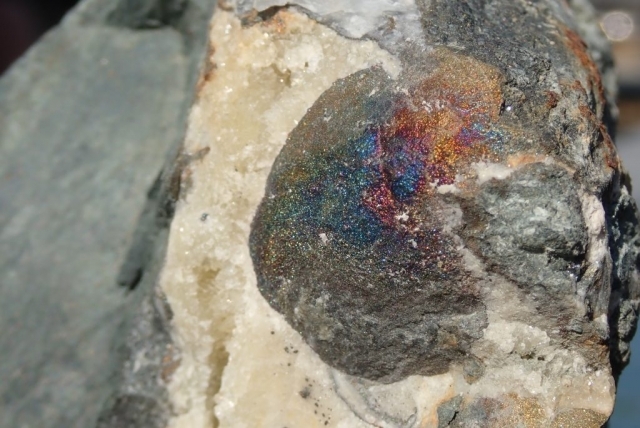 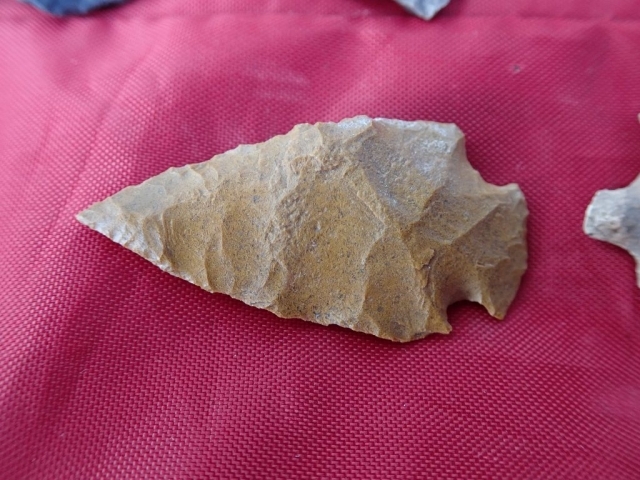 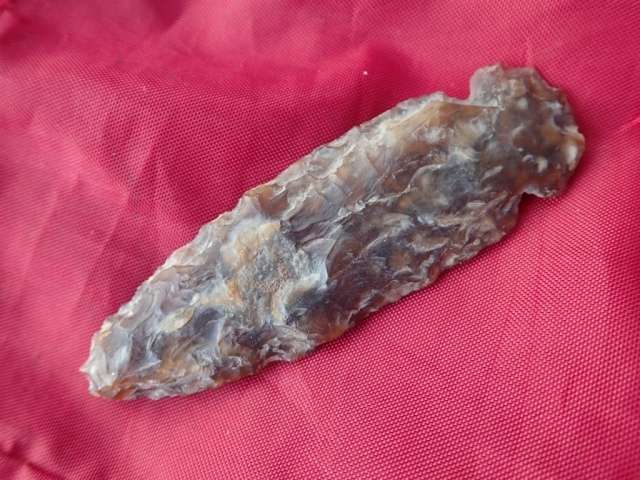 Several participants found “colour” in their pans and some were able to do rock hounding in the creek as well. 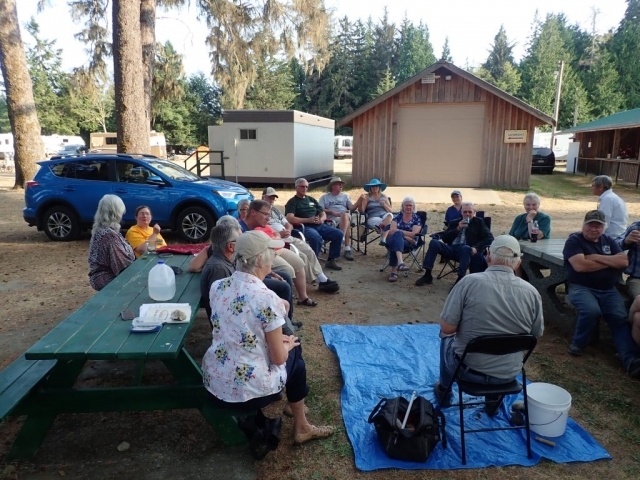 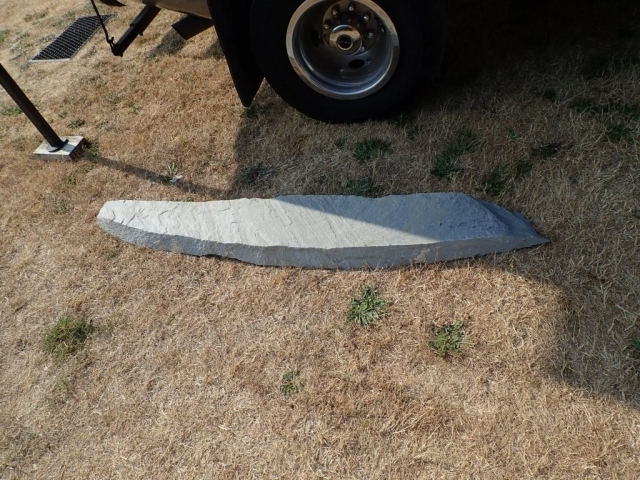 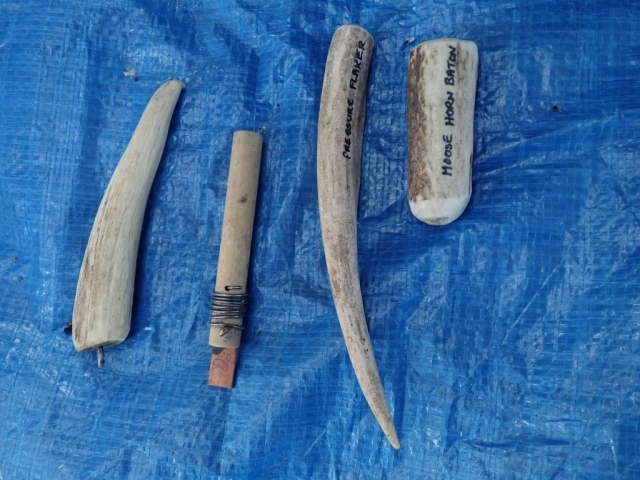 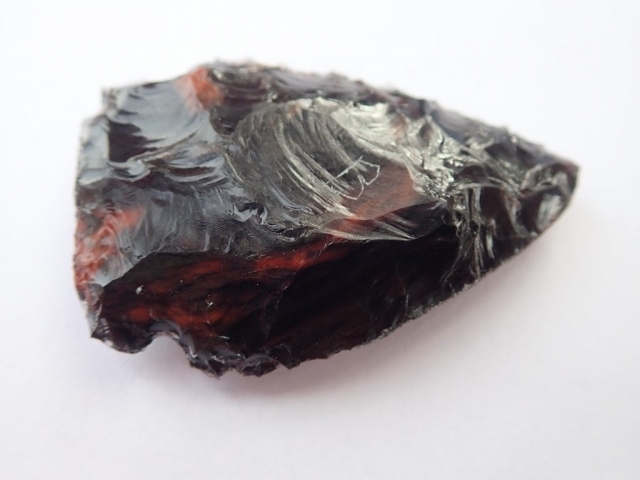 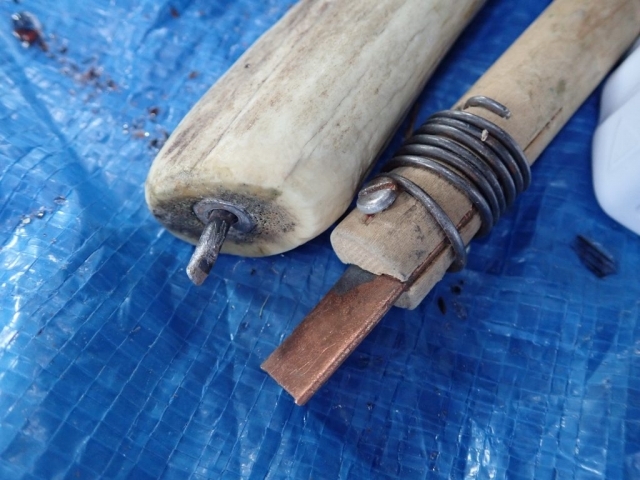 The Friday agenda was ended with a steak BBQ put on by the Sooke Lions and with an arrow-knapping demonstration by our very own Bruzz Bethel. 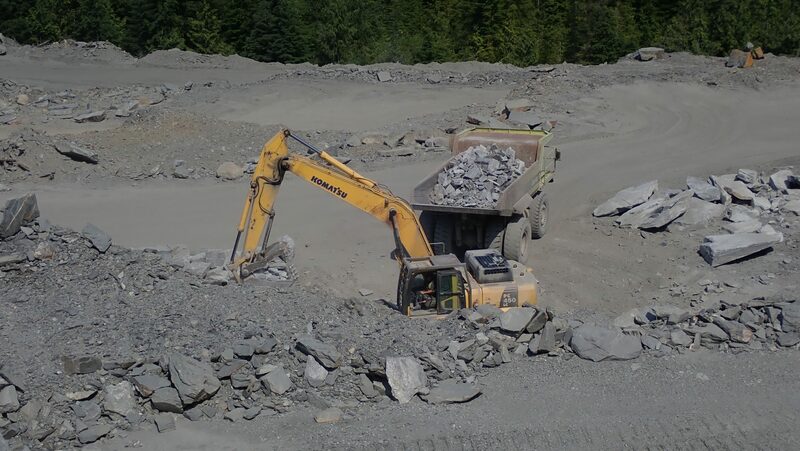 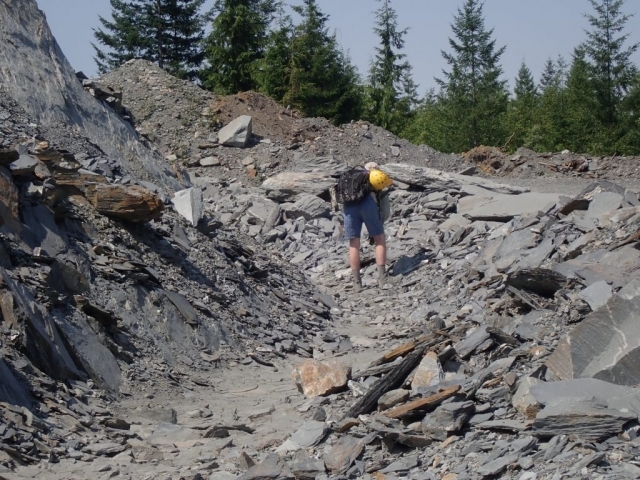 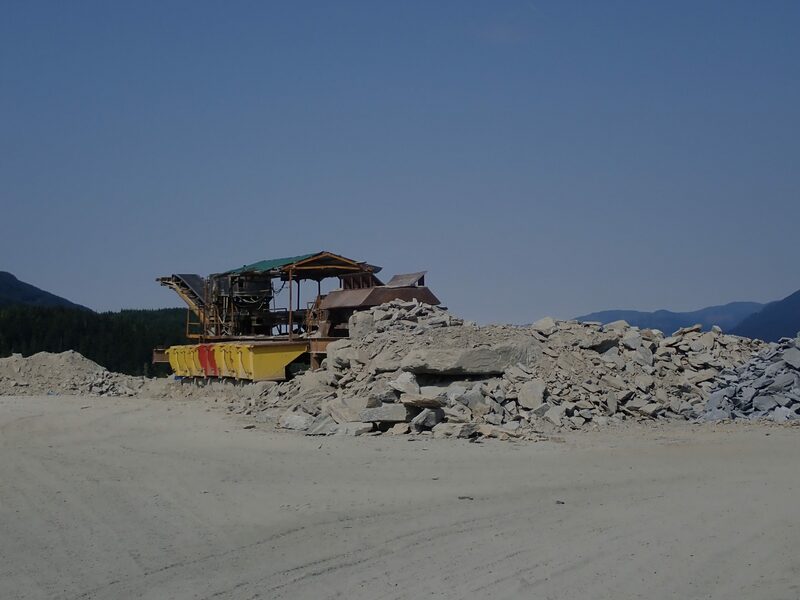 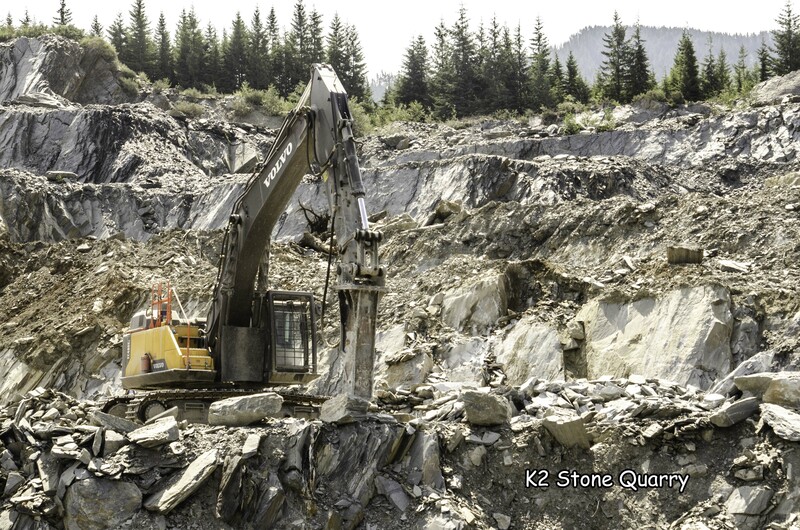 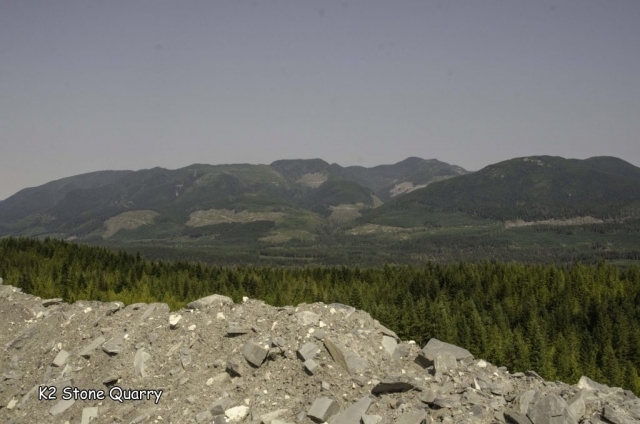 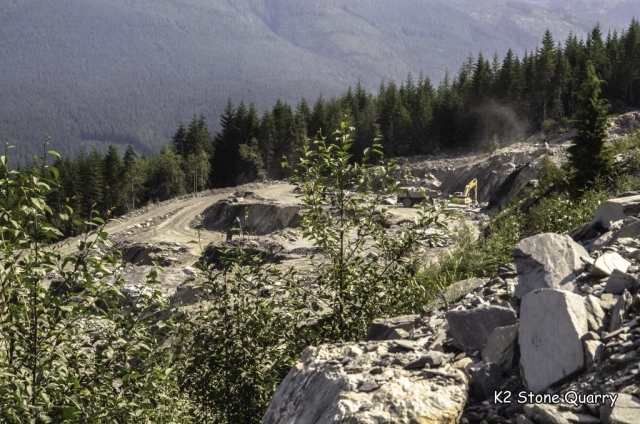 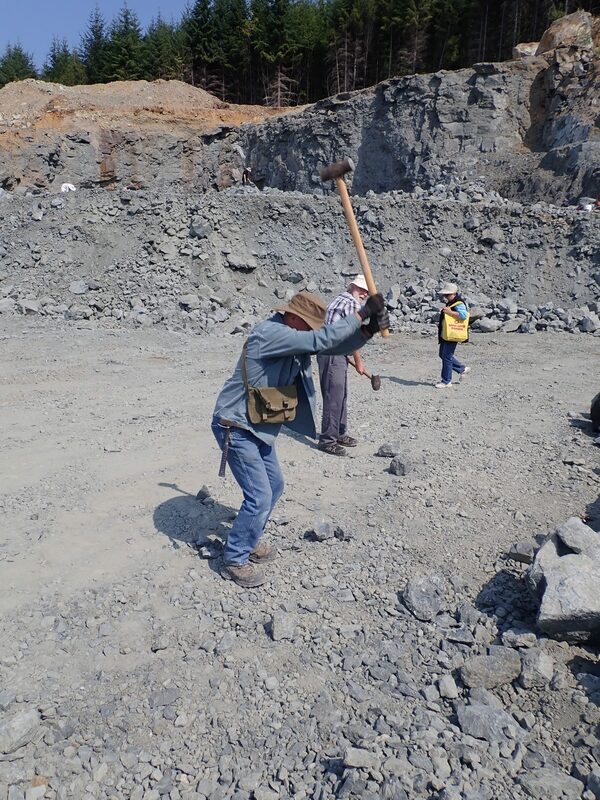 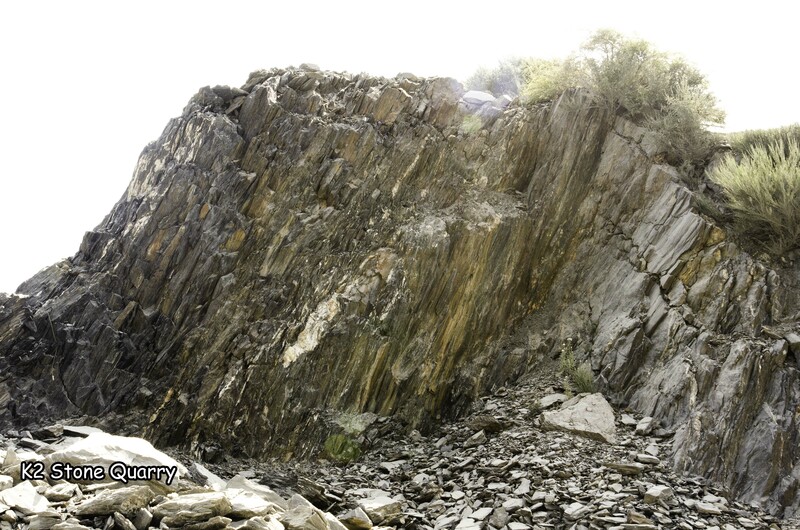 The K2 Quarry is located past Lizard lake on a challenging and extremely dusty logging road. A convoy of around 12 high-clearance vehicles made the trip, loaded to the gunnels with all who wanted to attend. 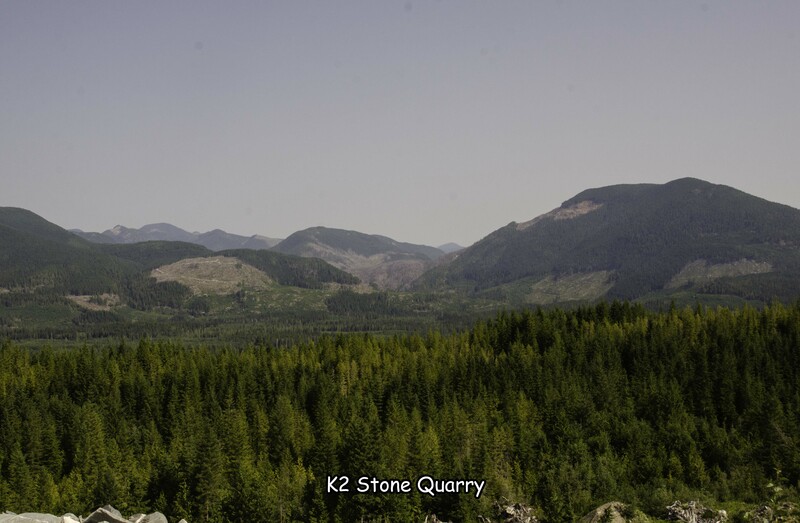 We were met for the last segment by Matt Girard from the Nanaimo office of K2 Stone. In the quarry we had an hour walk-and-talk on how K2 operates. 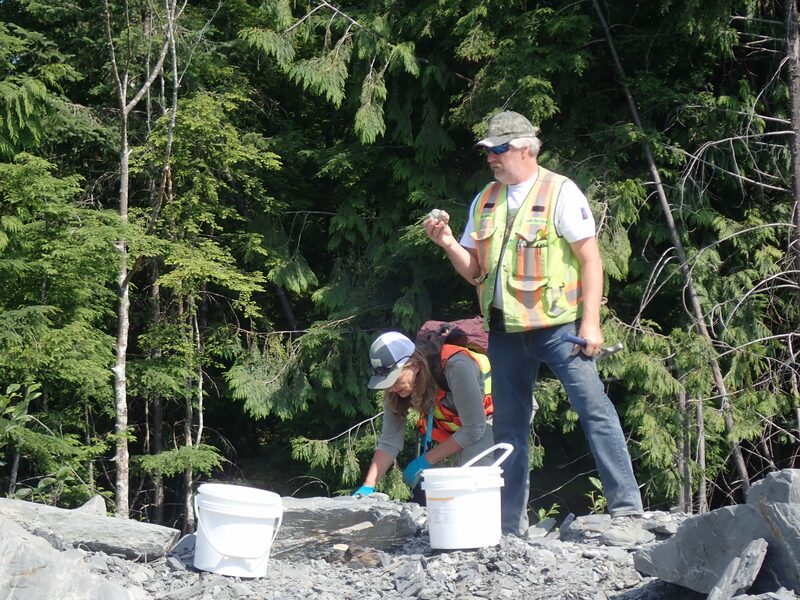 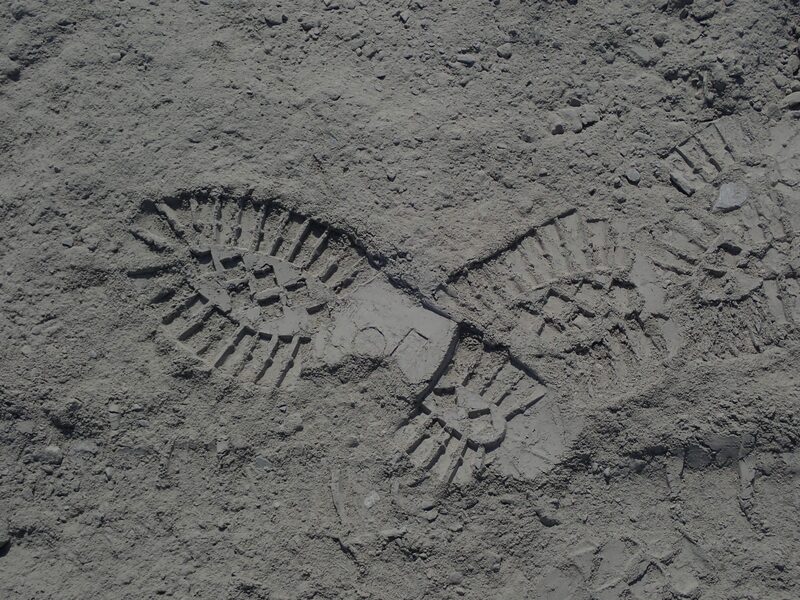 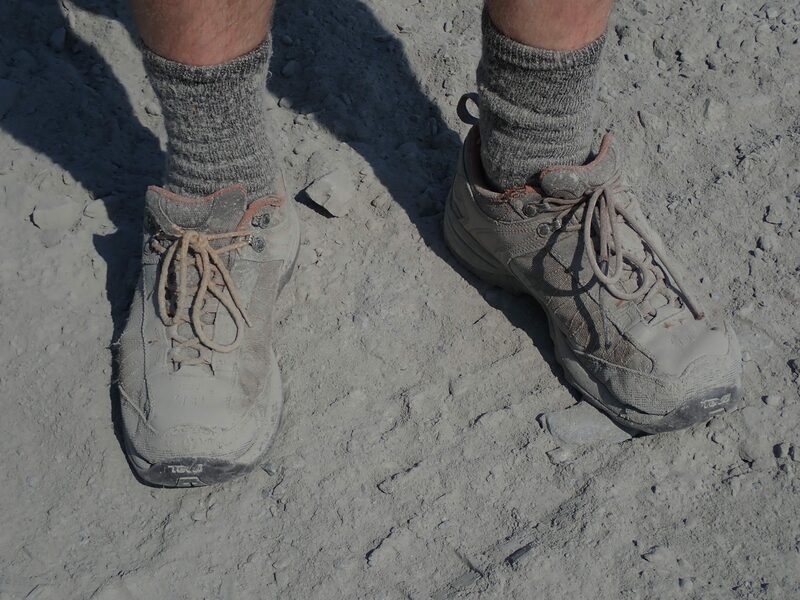 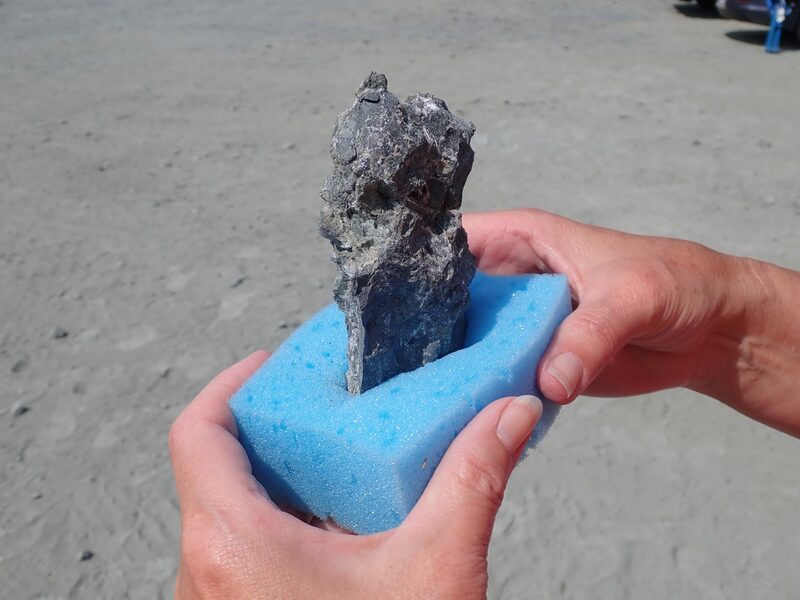 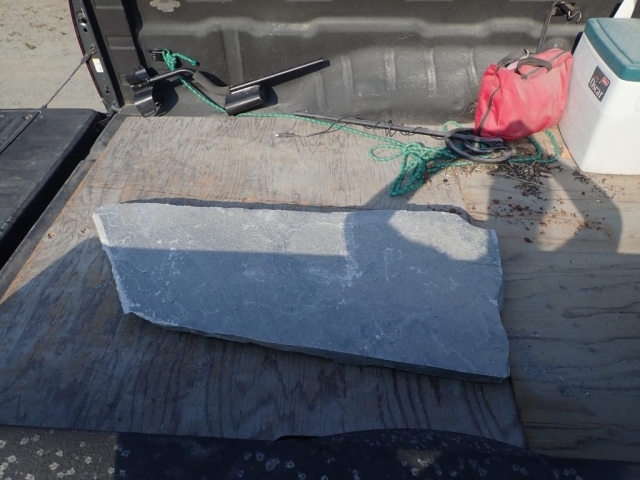 We were allowed to take any sample of rock we could physically carry to our vehicles – which led to some team efforts. Patrick Lydon (of the Victoria LMS) let us try panning on his claim on Loss Creek. 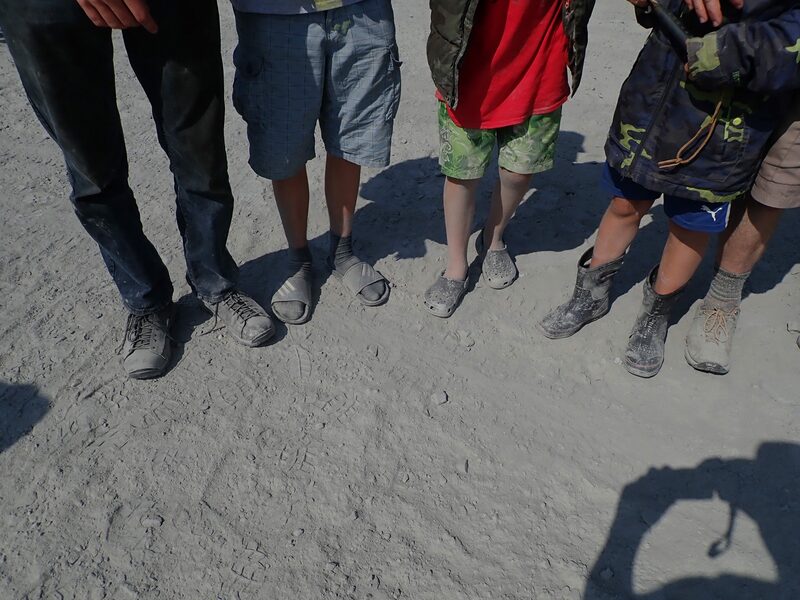 After the hot and dusty quarry the latecomers seemed just as interested in dangling their toes in the water as in searching for gold. 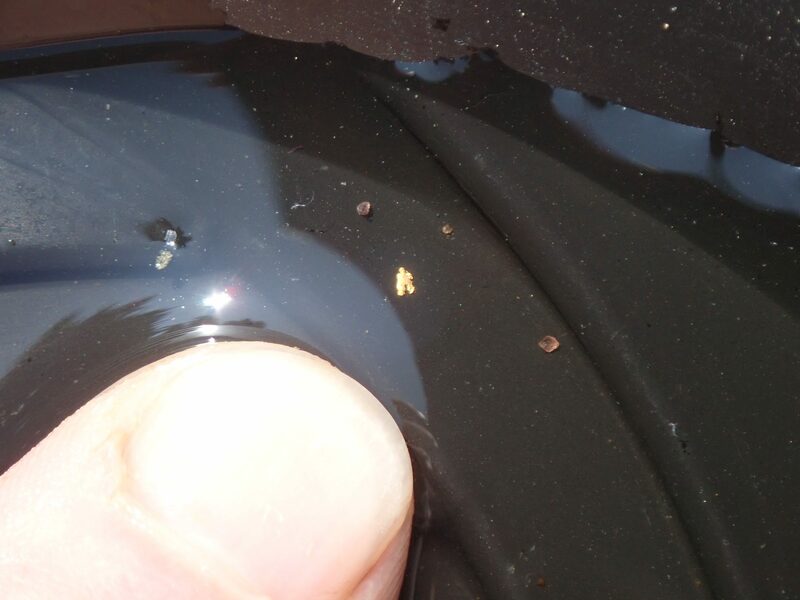 Nevertheless some people found a few flakes of actual gold. 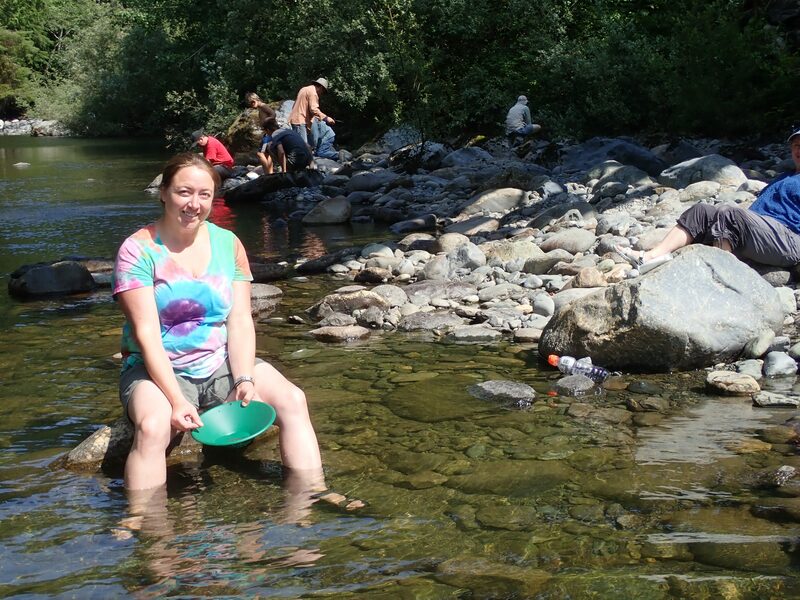 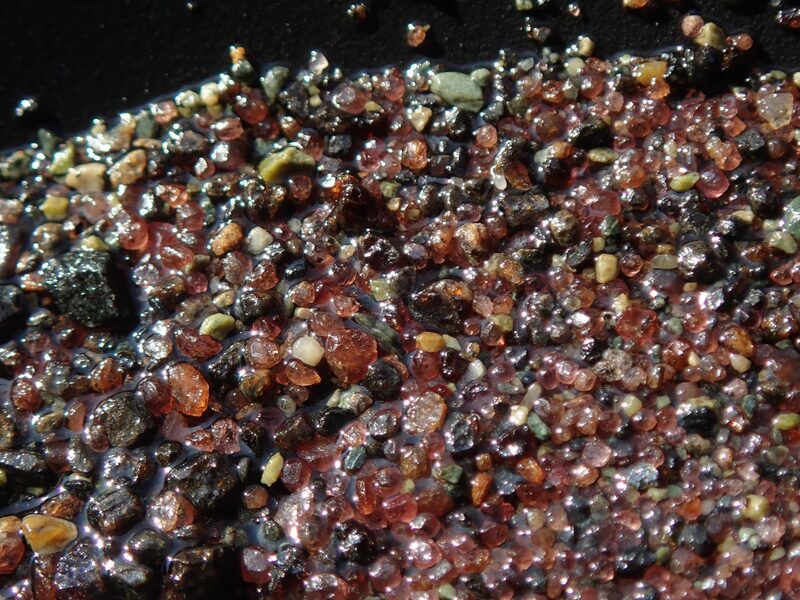 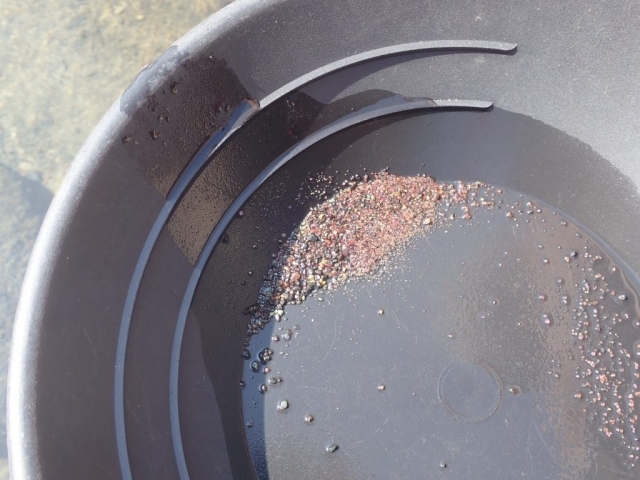 Almost as much fun were the garnets to be found all down the creek which conveniently collected in the panning pans. 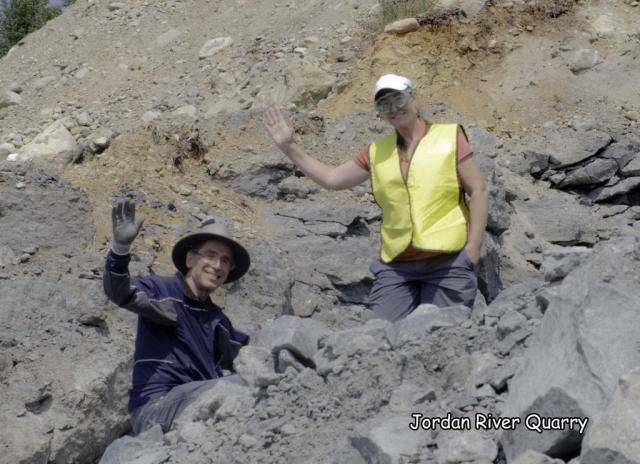 Saturday morning was spent at a rock quarry in Jordon River. 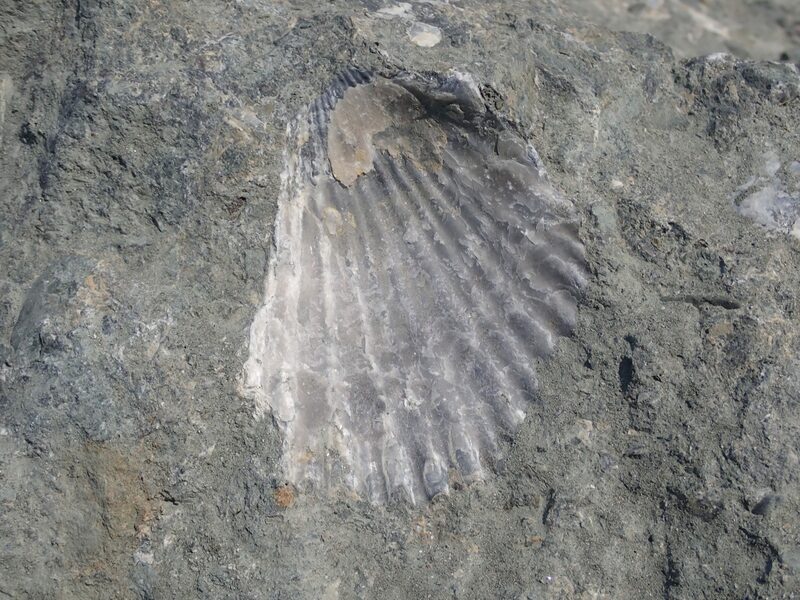 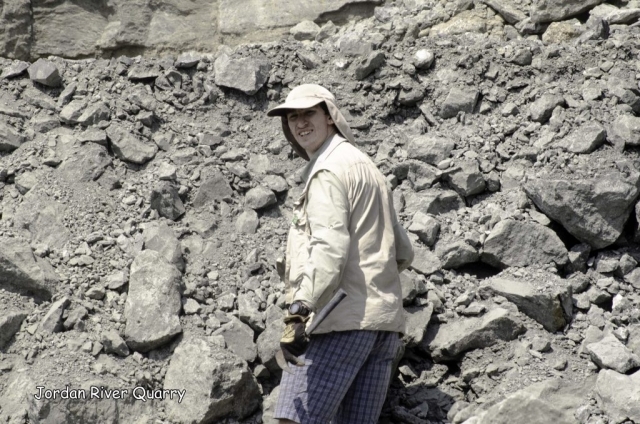 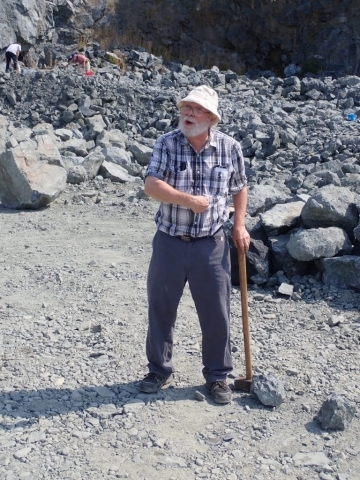 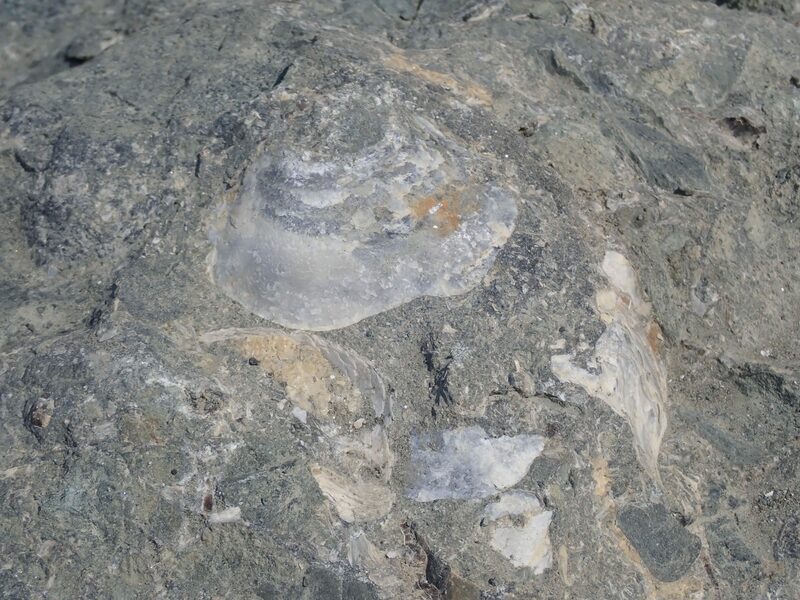 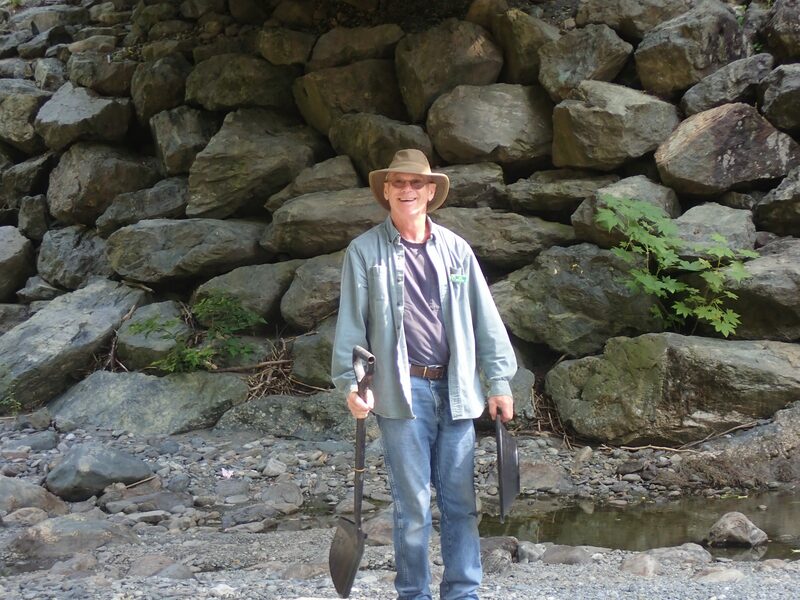 Giles LeBrun had known for some time that there were fossils at this quarry. 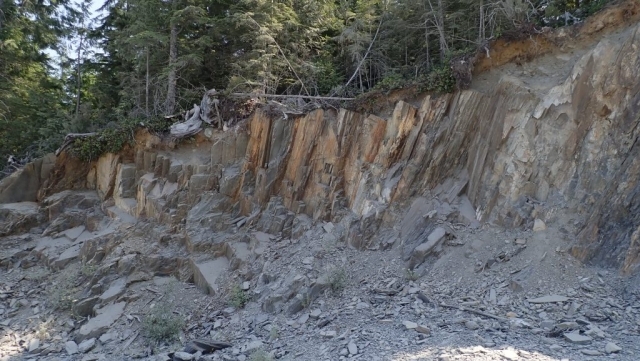 What is extraordinary about this spot is that it represents where the plutonic (volcanic) portion of the lower Island meets with the ocean sediments. 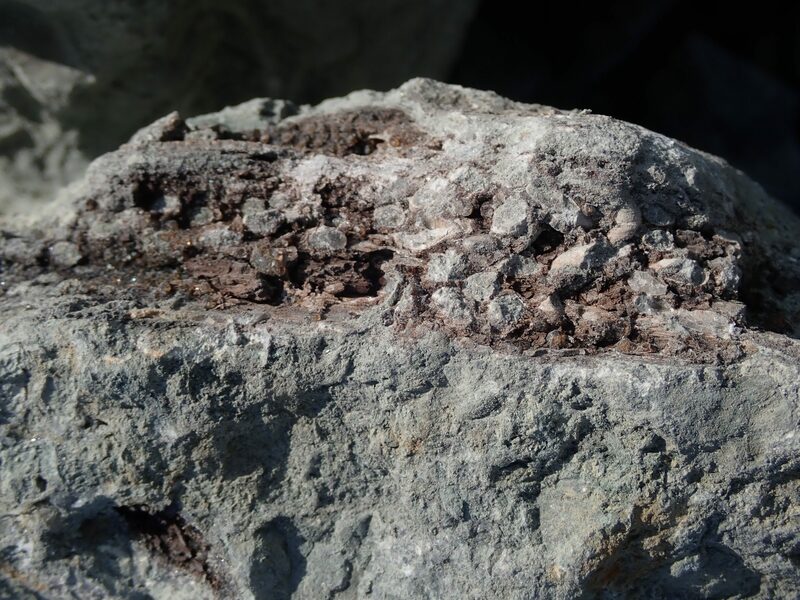 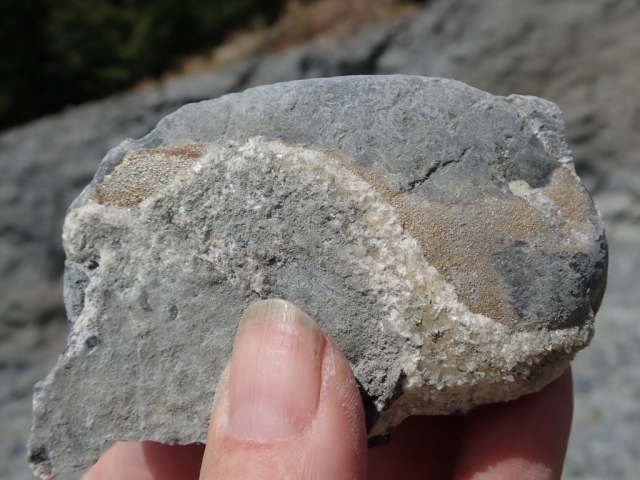 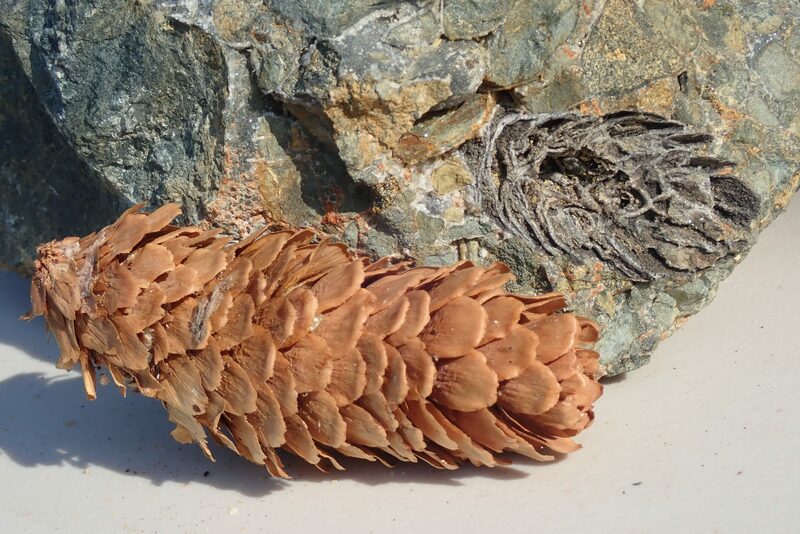 As a consequence, we were able to find fossils that had been mineralized. 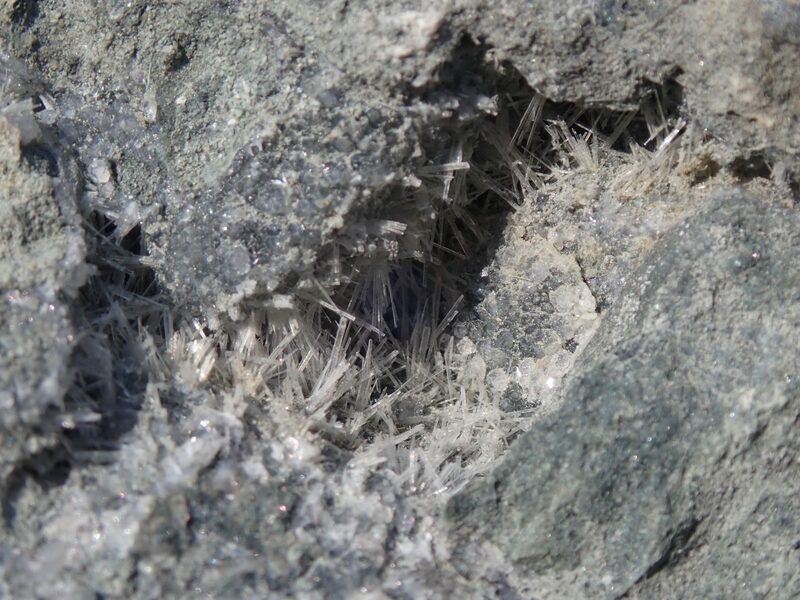 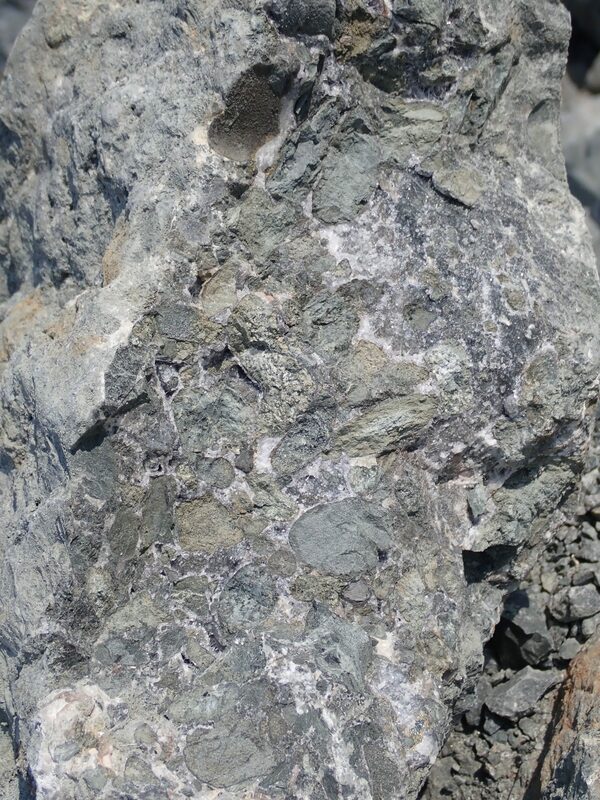 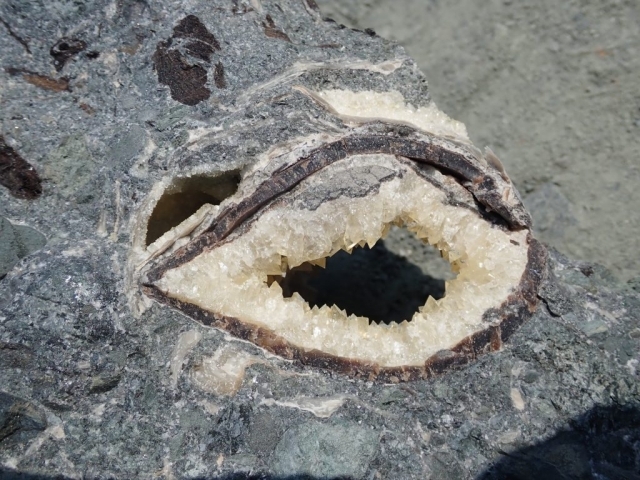 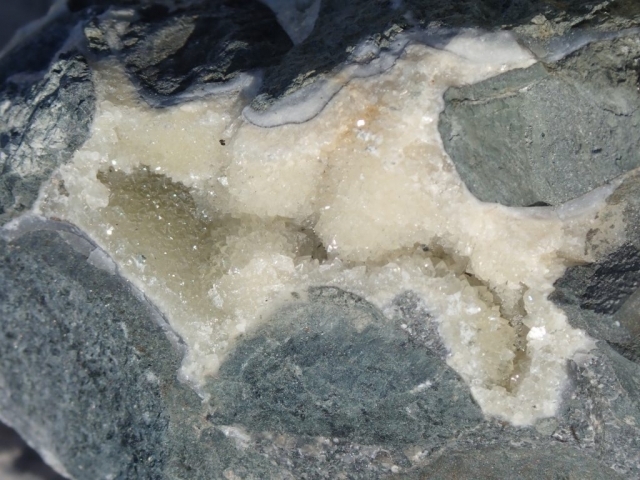 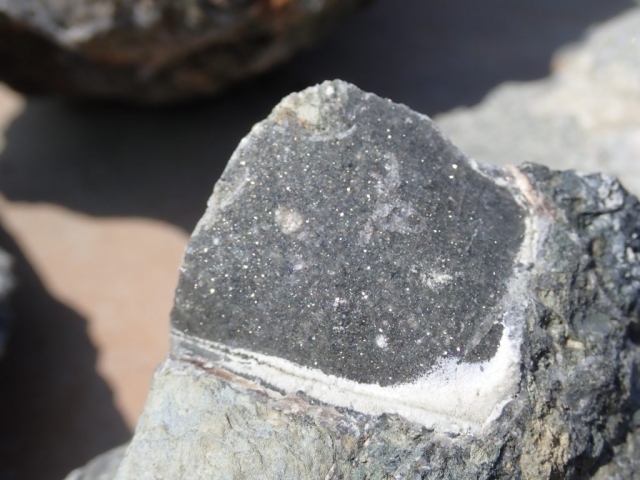 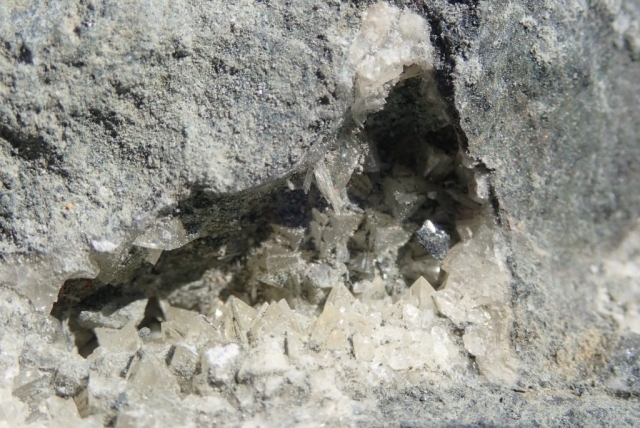 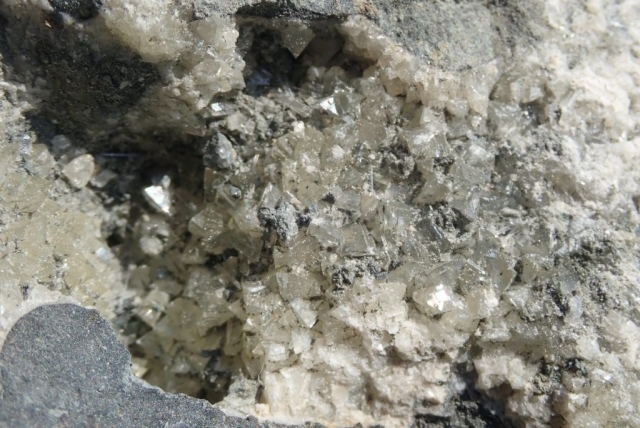 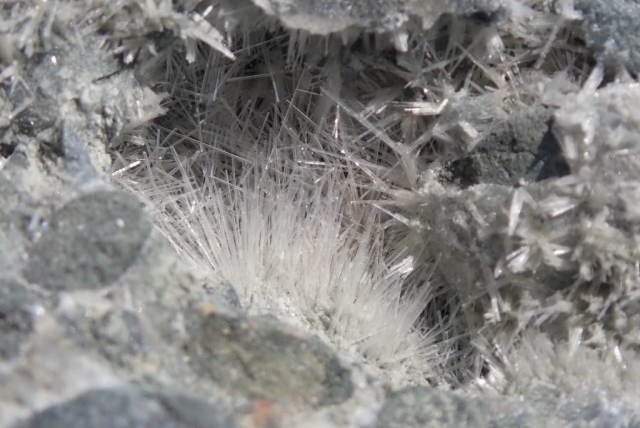 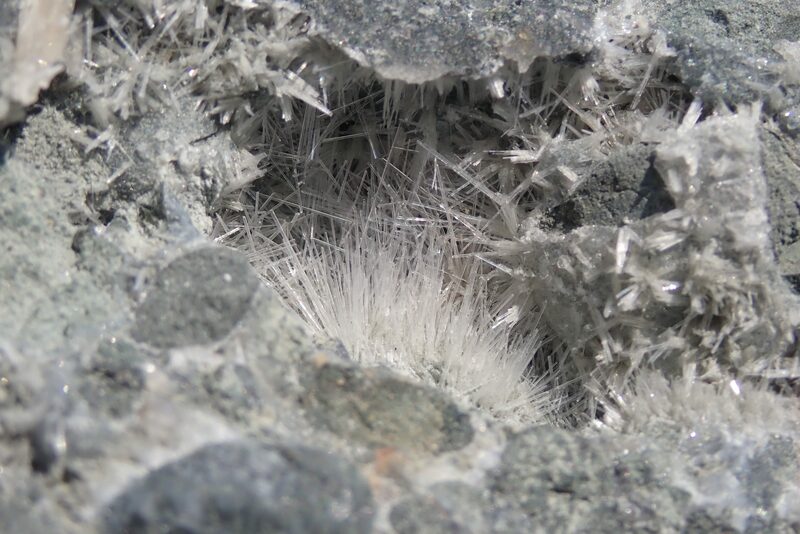 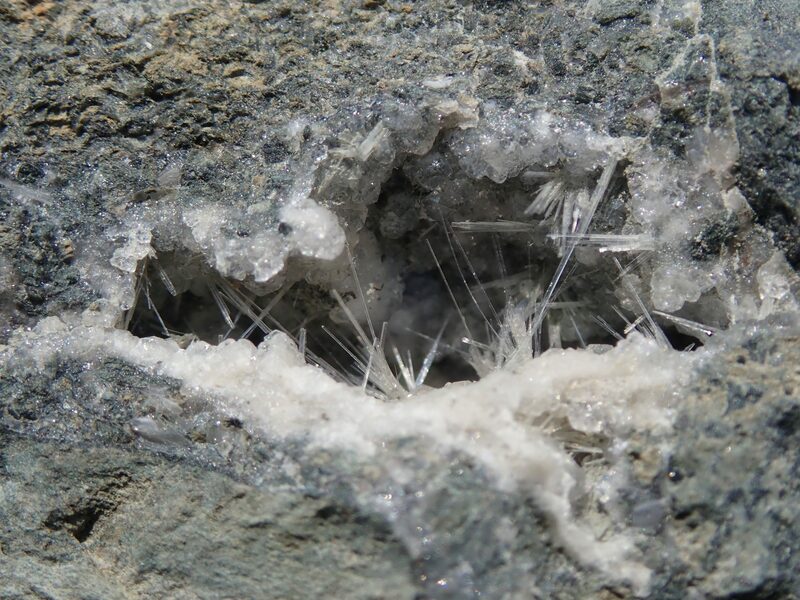 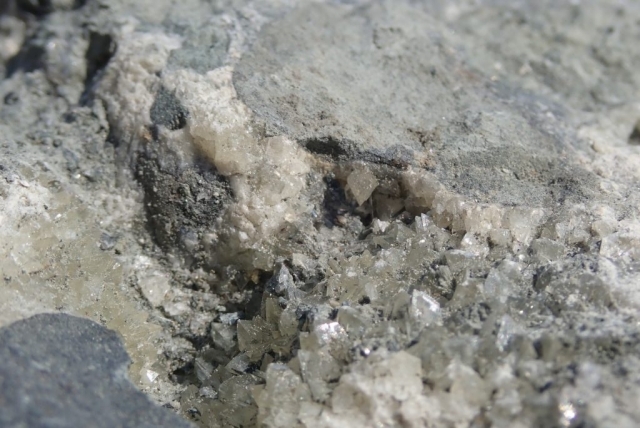 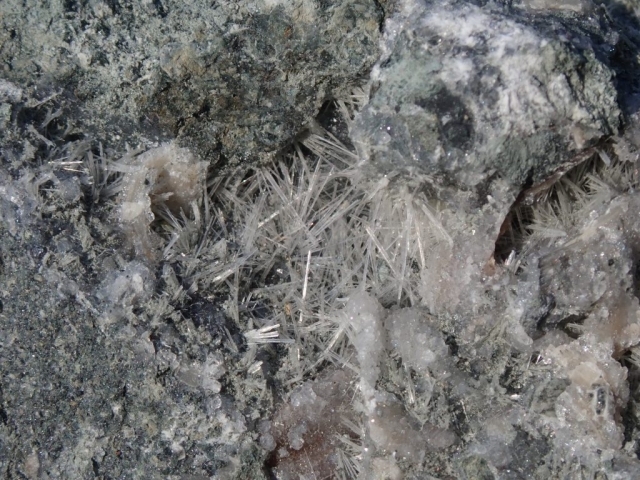 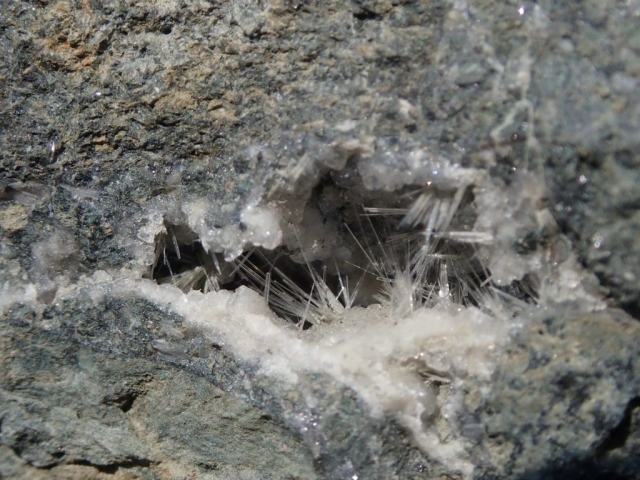 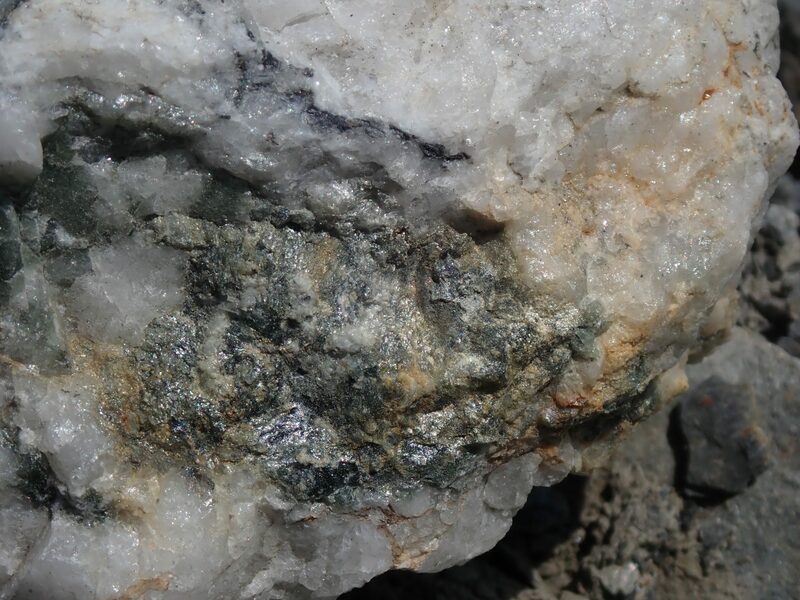 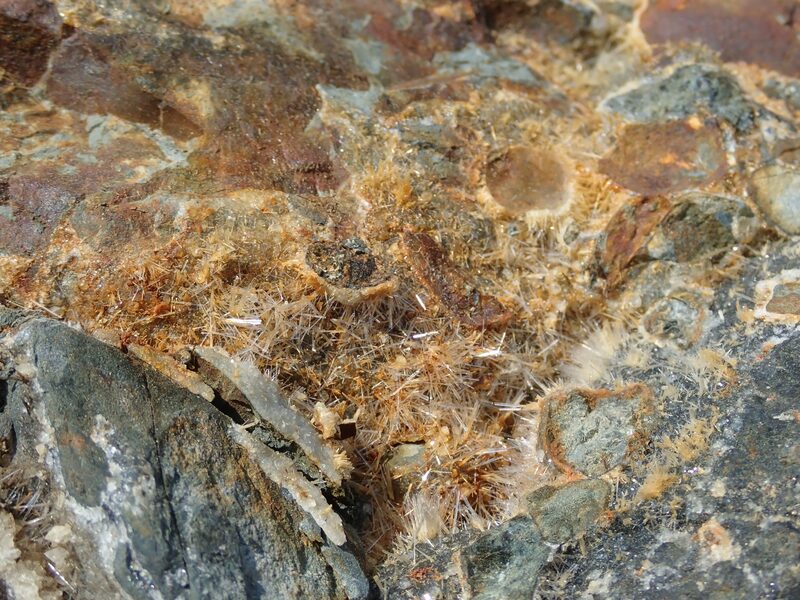 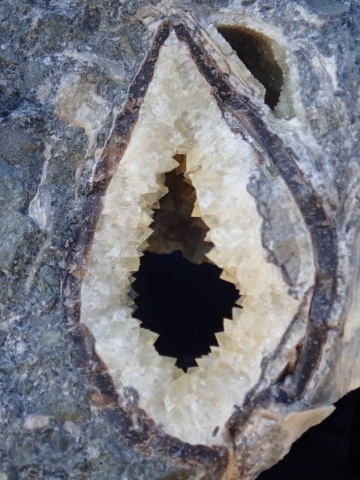 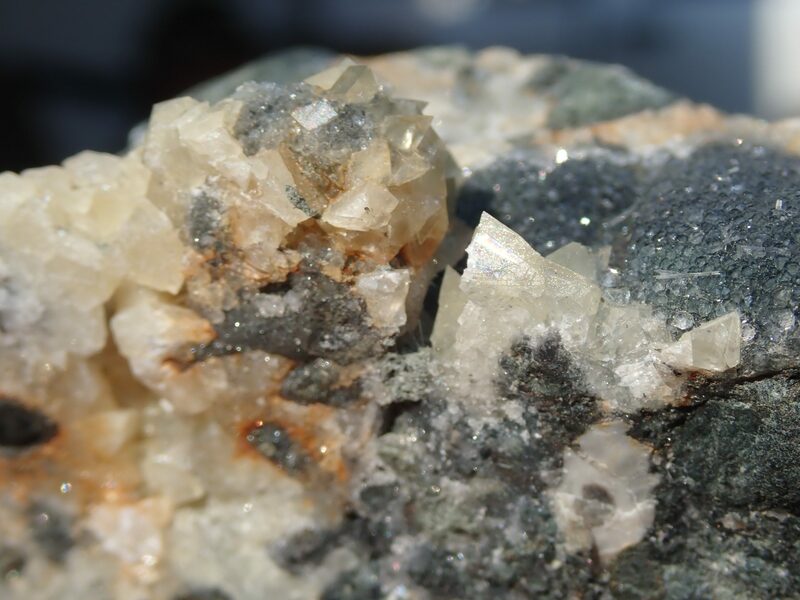 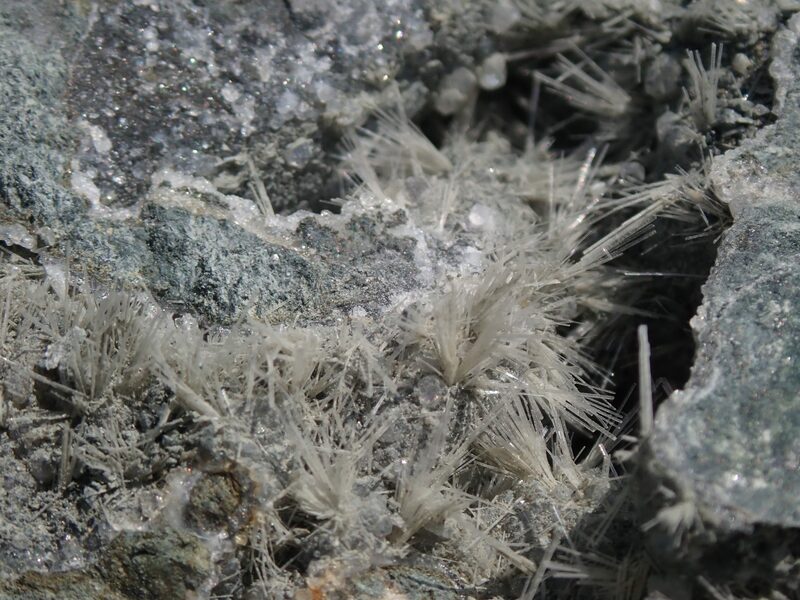 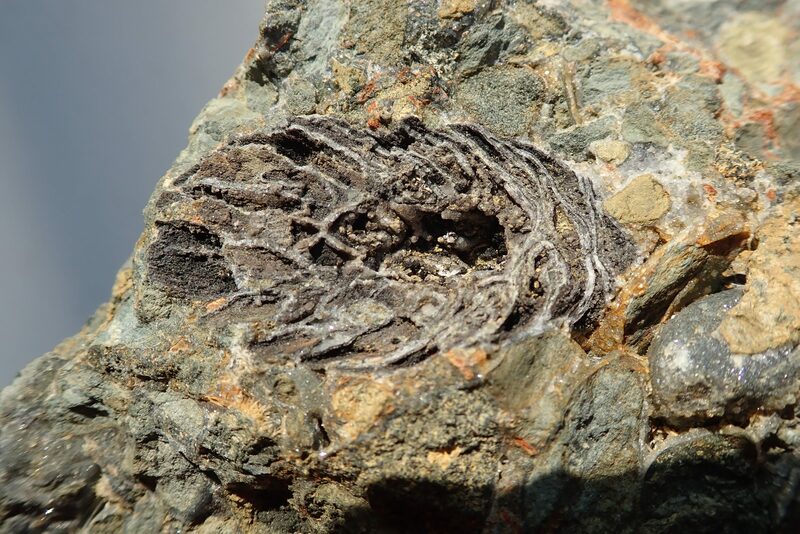 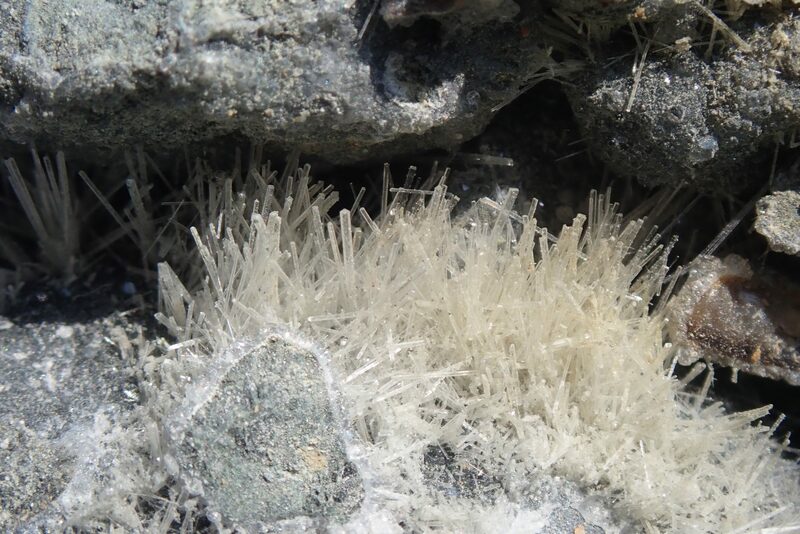 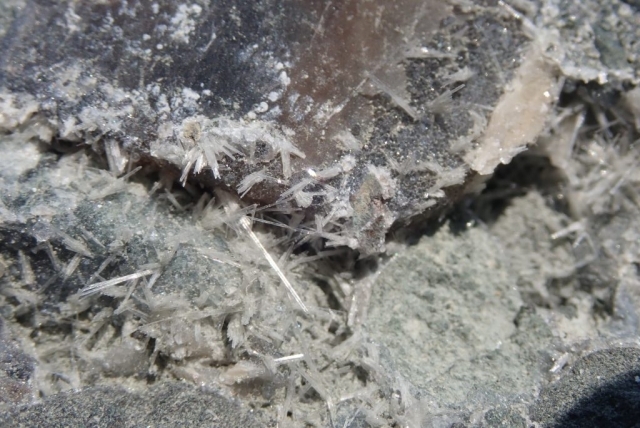 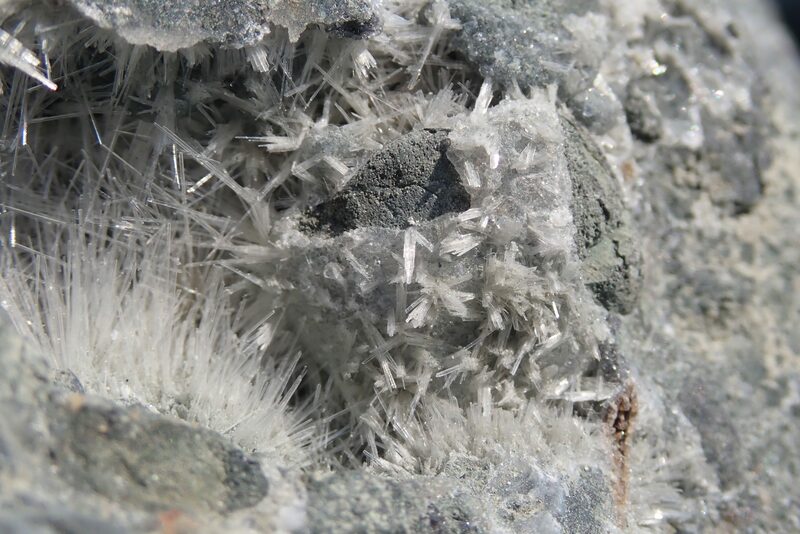 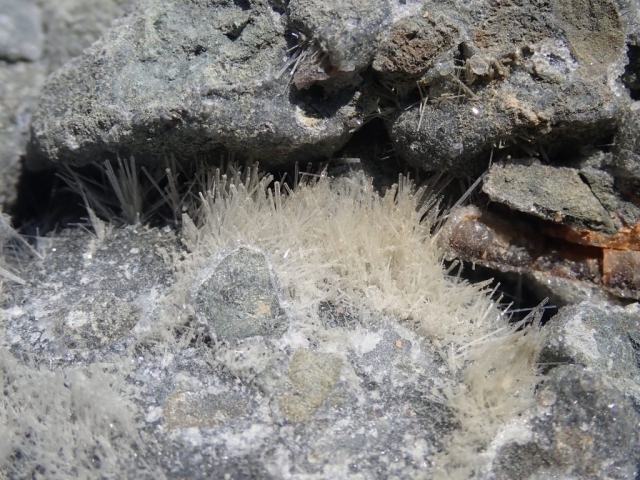 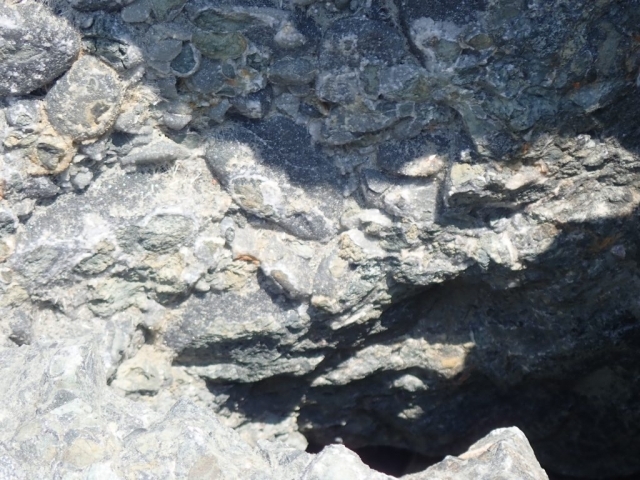 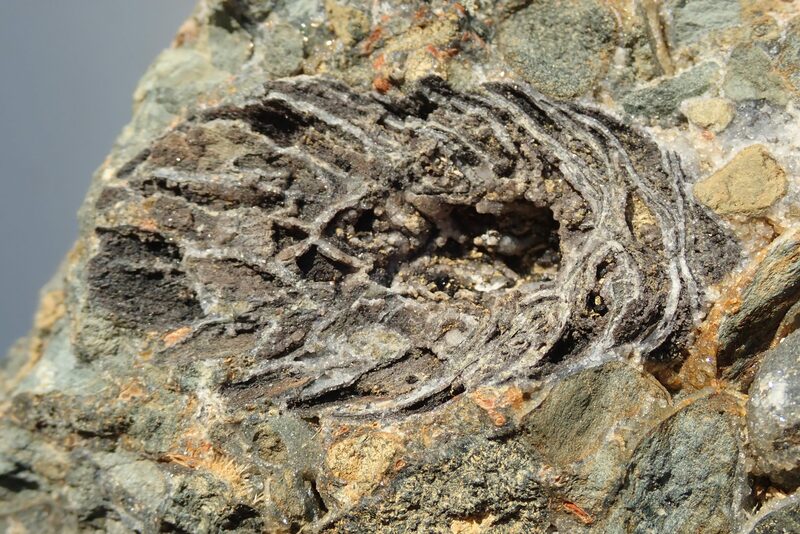 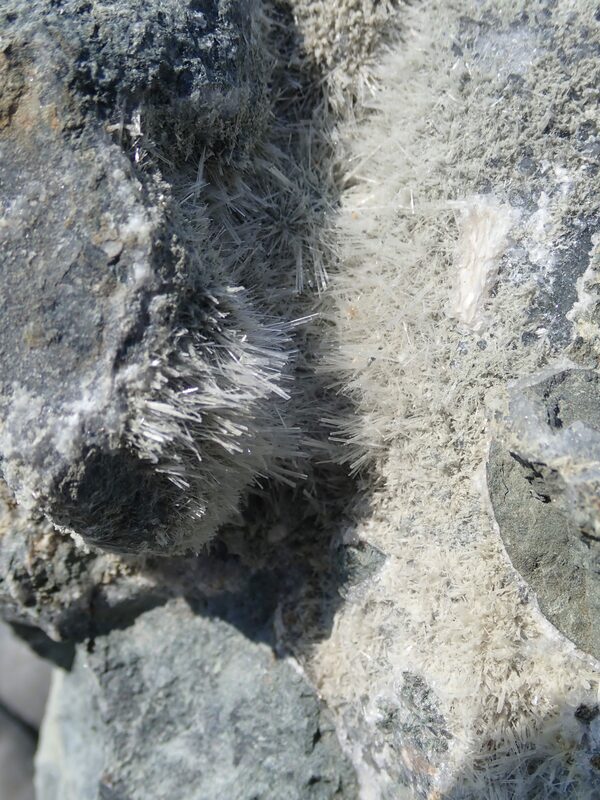 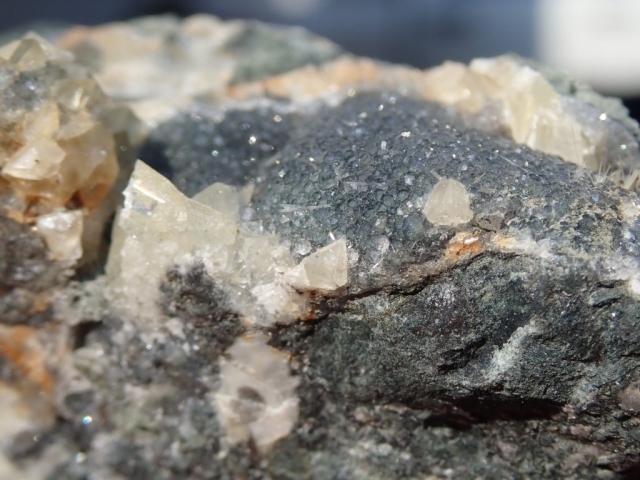 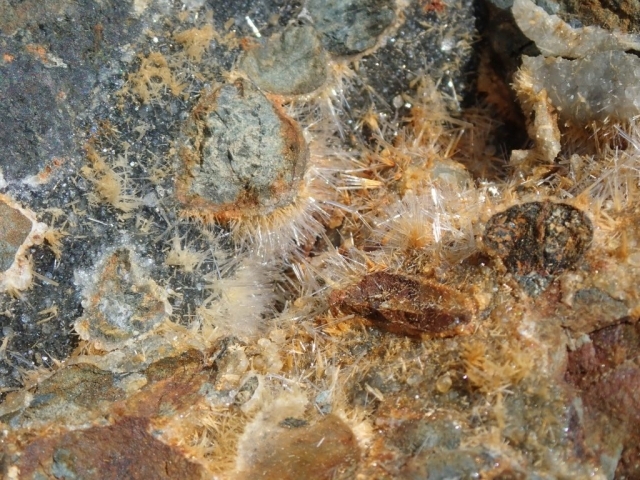 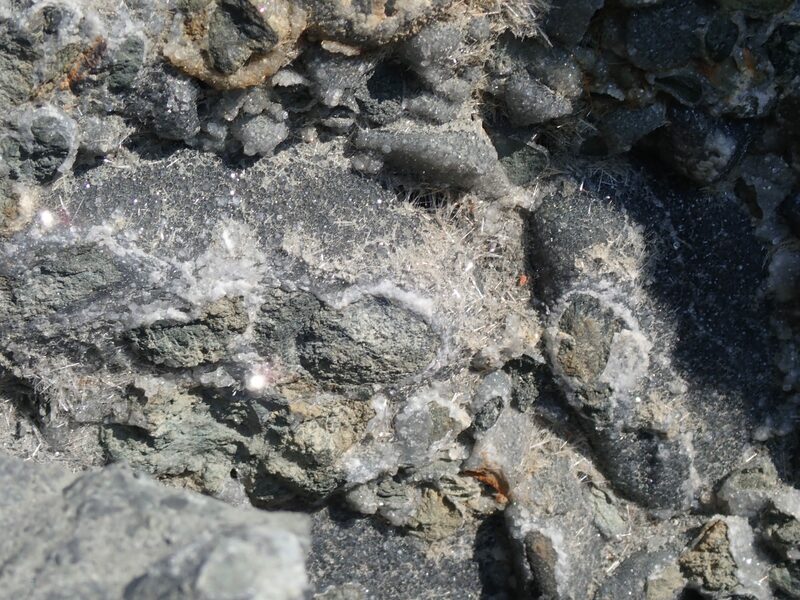 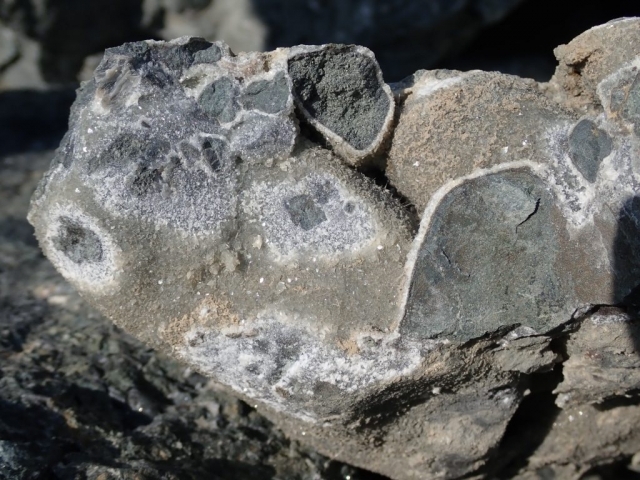 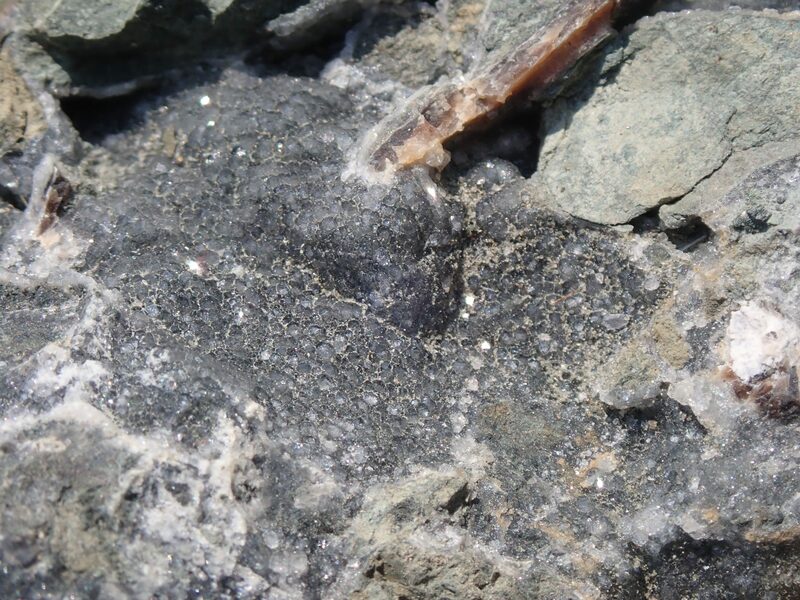 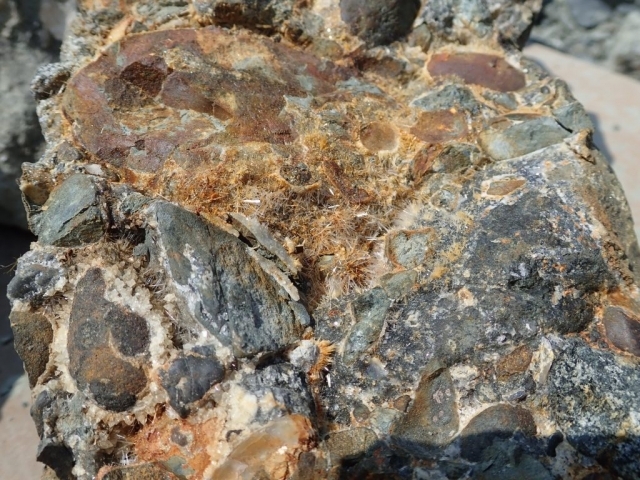 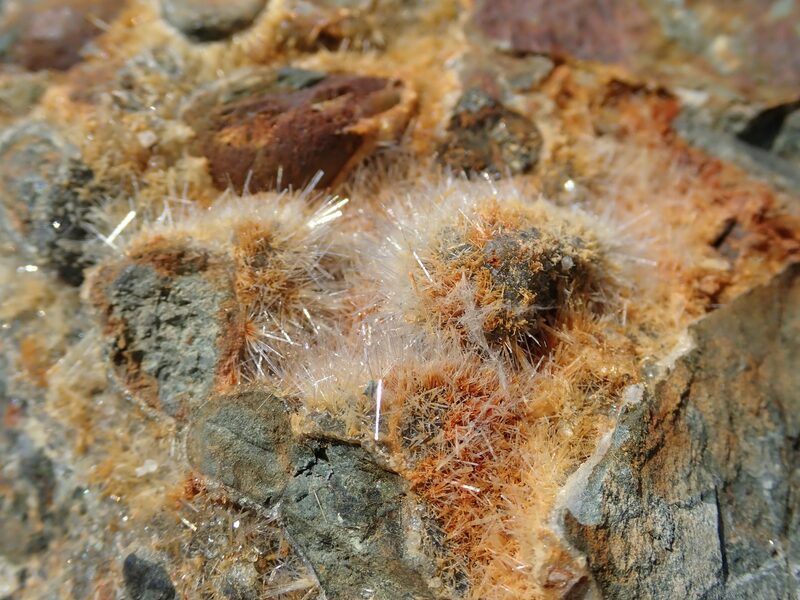 Vugs (volcanic air pockets), with their calcite crystallization, and other assorted and unusual types of crystallization were typical “finds” at this intersection of rock formations. The afternoon was spent at a local Sooke location called Ella Beach. 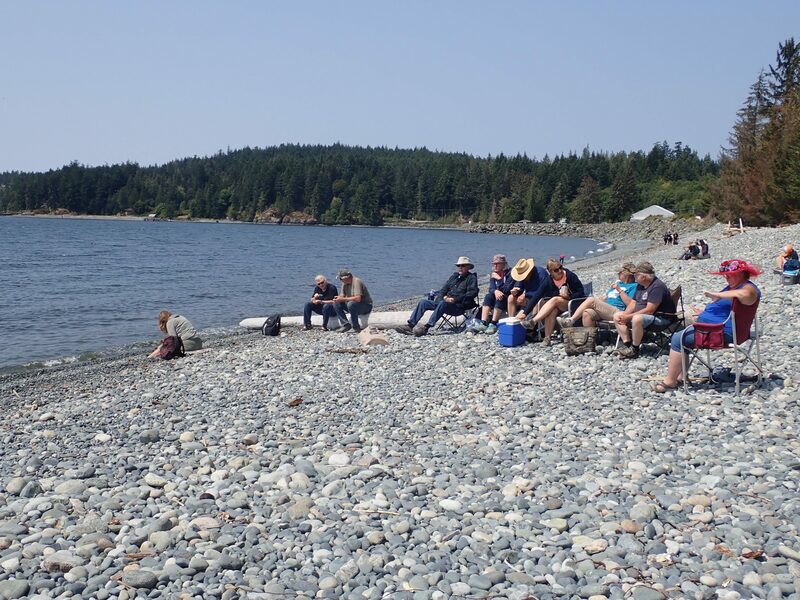 This beach is one of the “pebbliest” beaches around and kept most of us with our heads down looking for that special discovery. 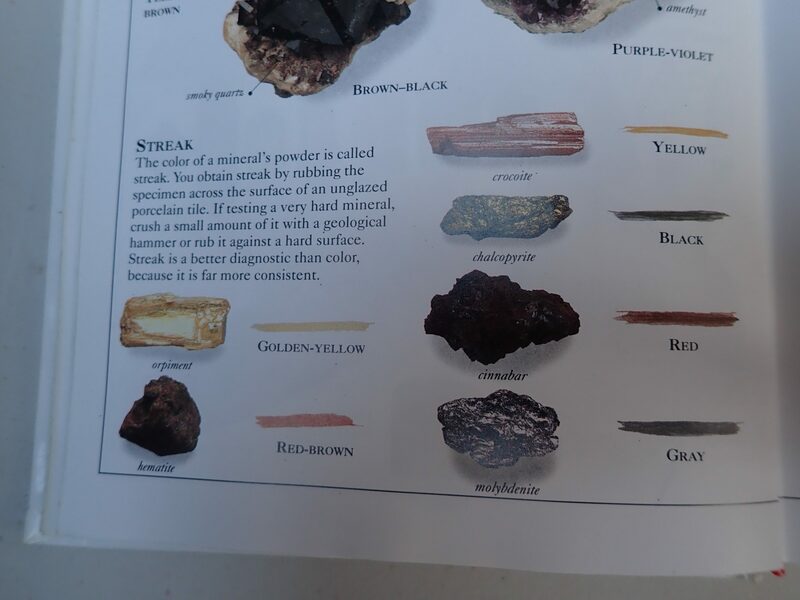 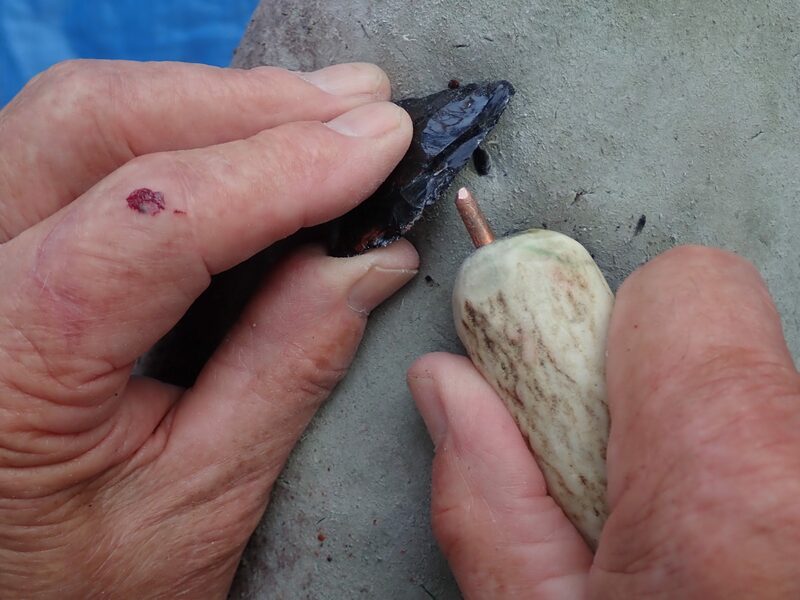 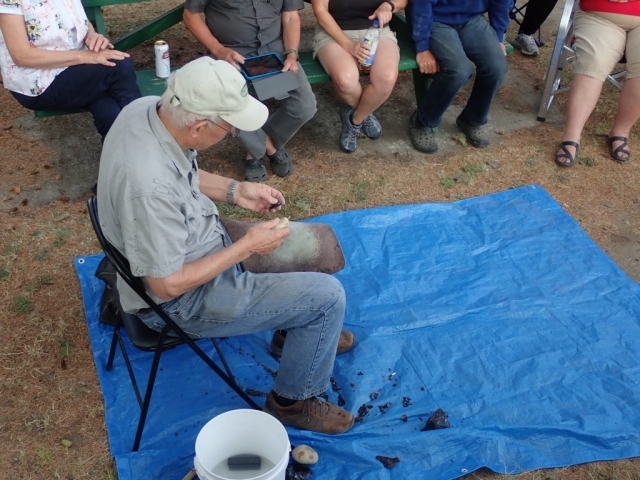 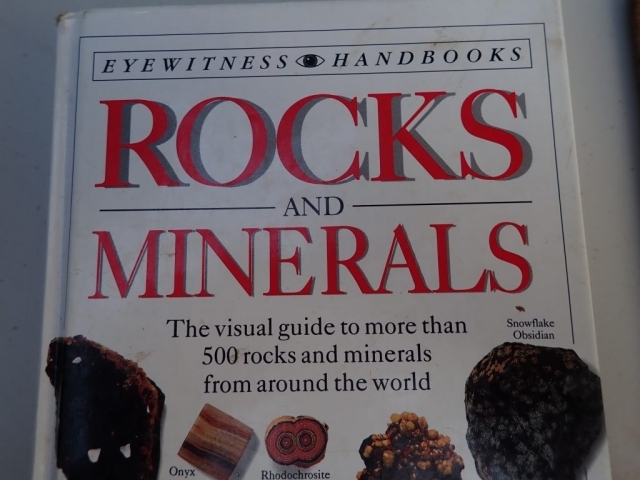 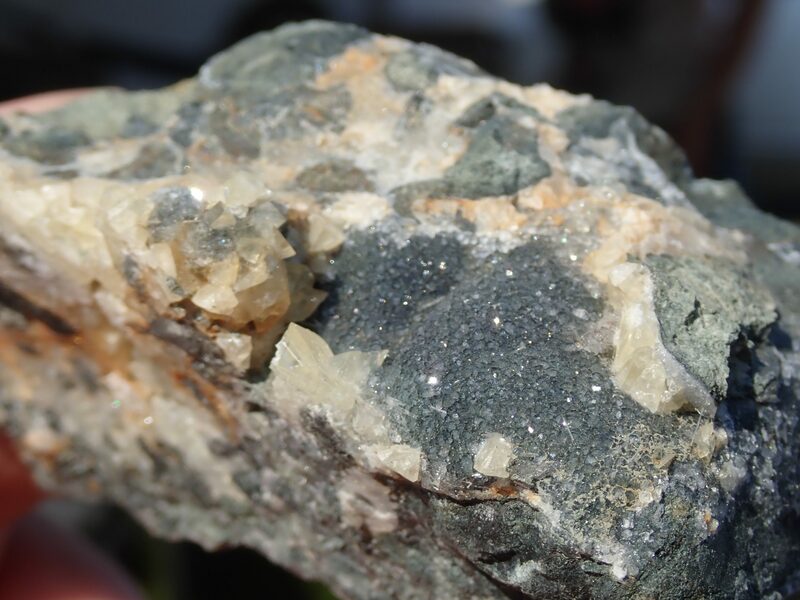 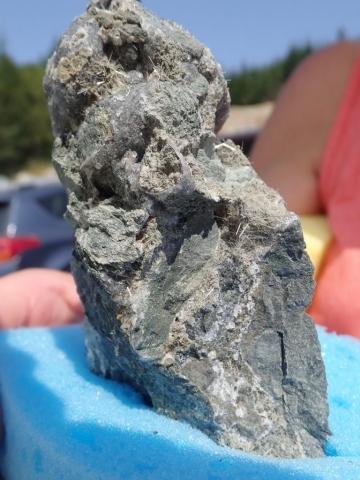 Saturday evening was highlighted by an impromptu potluck meal and an informative session on how to use the rock and mineral identification materials Laphound News – Aug 2018 Page 5 provided in the goody-bags that we each received at registration. 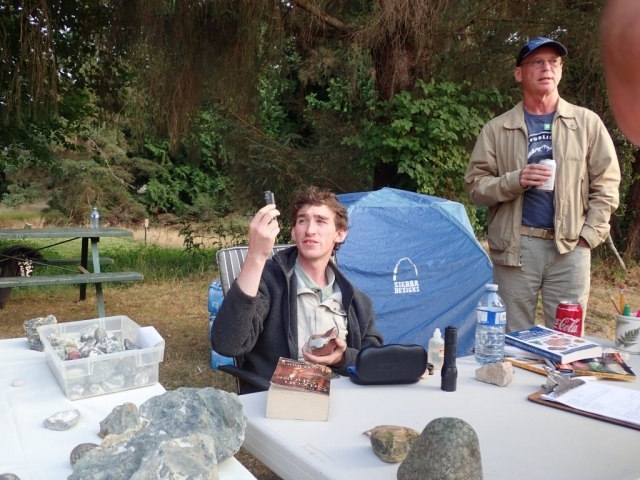 Sean Maier did a great job helping those interested in using the information provided to identify their treasures found during the day. 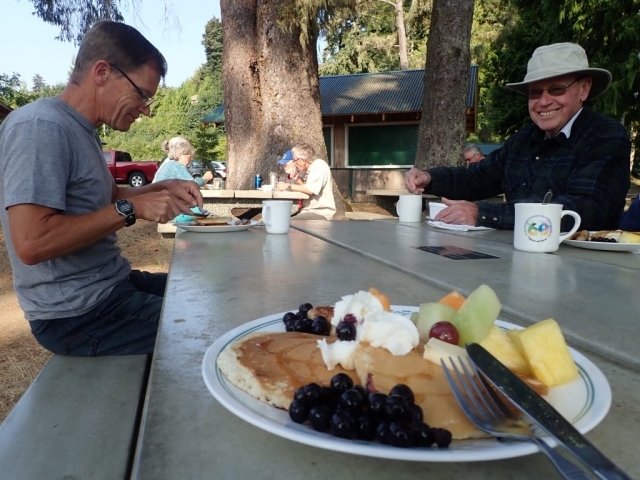 Sunday began with the Sooke Lions Club putting on a great pancake breakfast with sausages, blueberries and fruit salad. 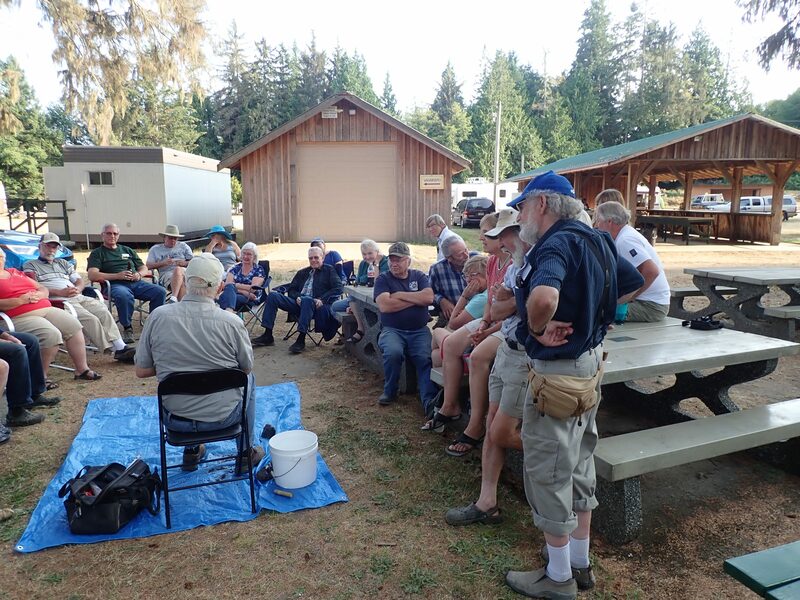 Following breakfast, the Island Zone meeting took place under the shade of conifers at the campsite. 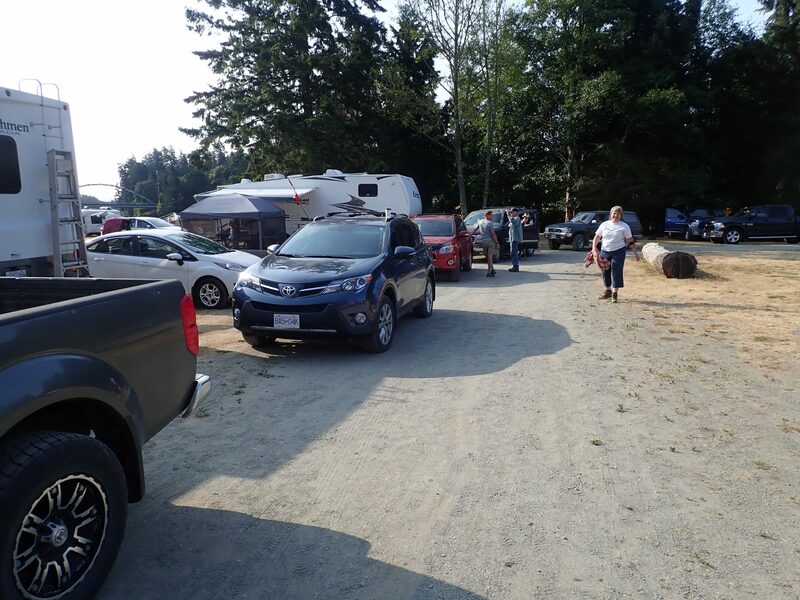 Finally, after the zone meeting, a tail-gate sale and auction concluded the Gemboree for this year. 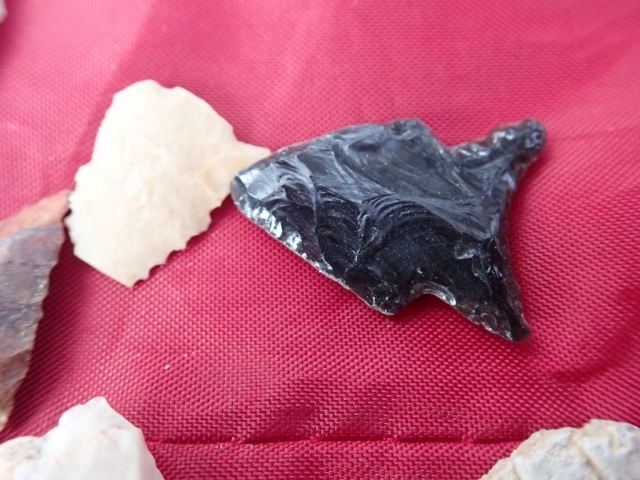 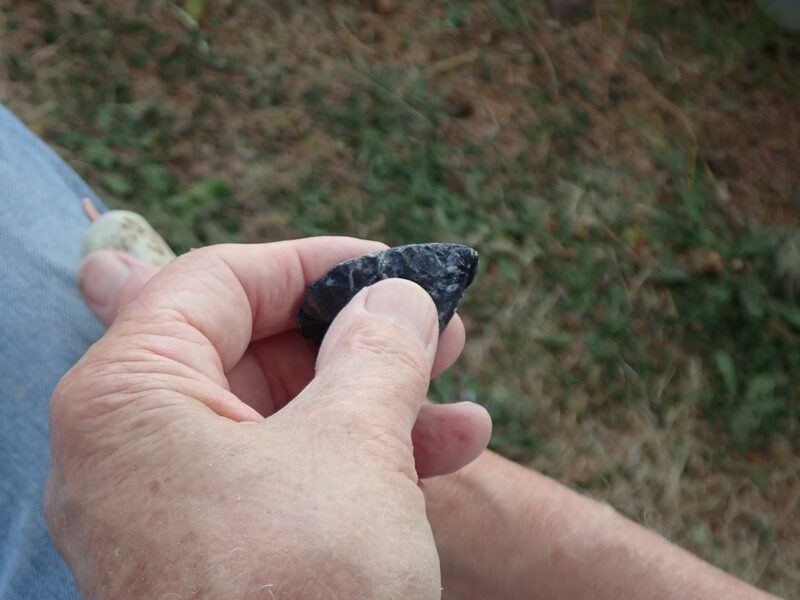 Bruzz Bethel gave a demonstration of flint knapping in the campground. 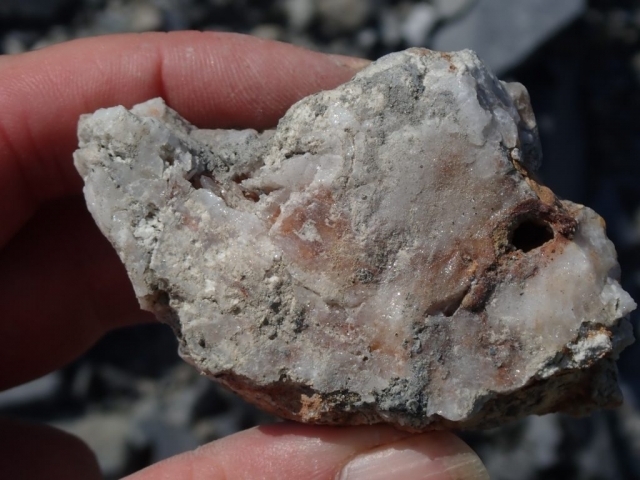 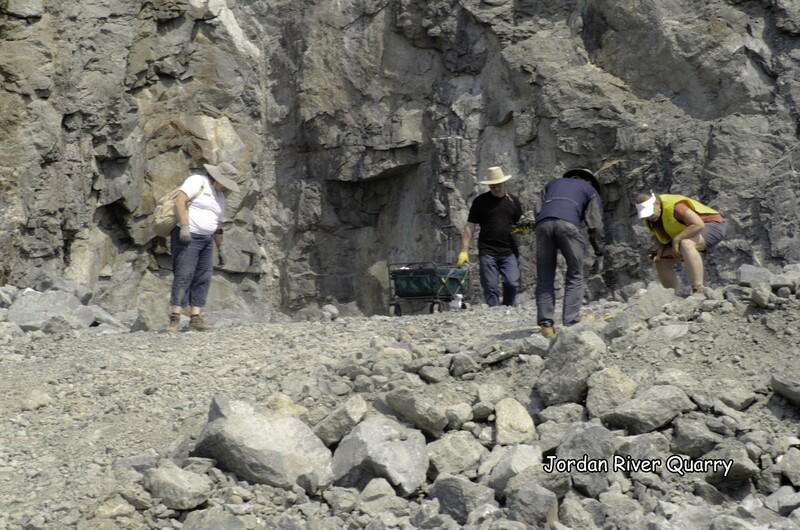 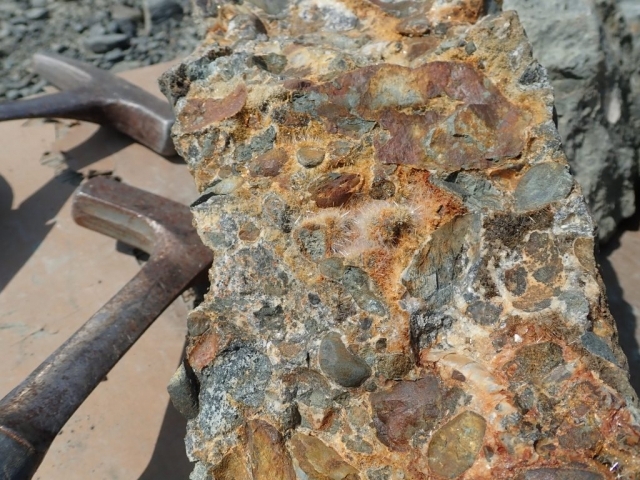 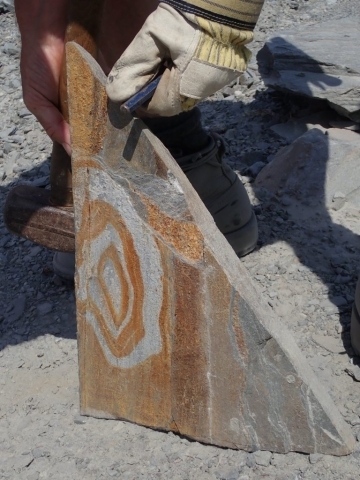 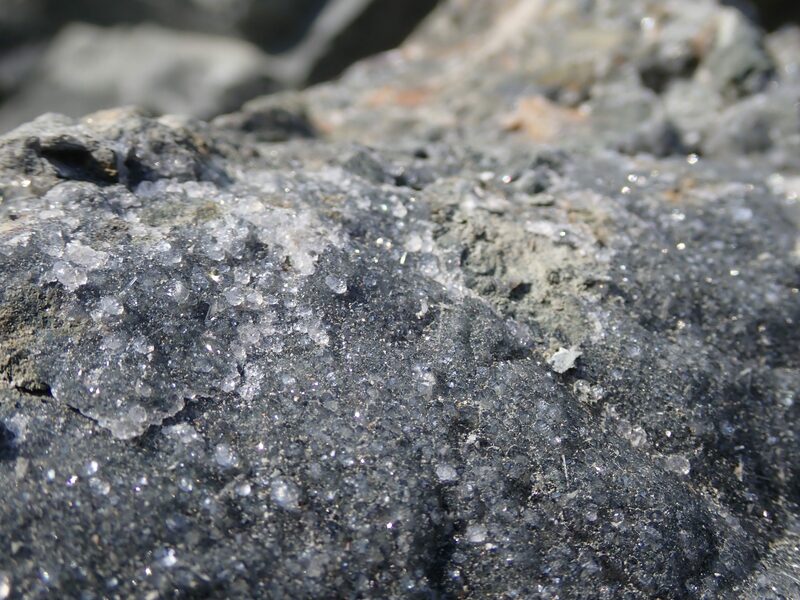 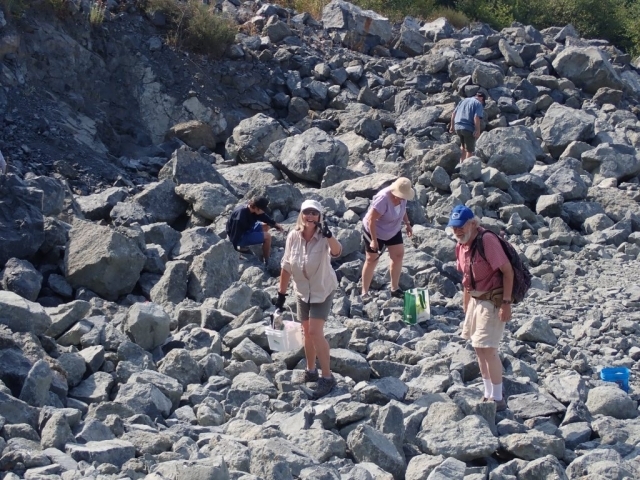 The Jordan River Quarry and Sandpit produces rock for road building, but the rock is full of fossils and crystals. For a wonderful few hours we were given free rein with hammers, chisels and buckets to discover and collect to our heart’s content. 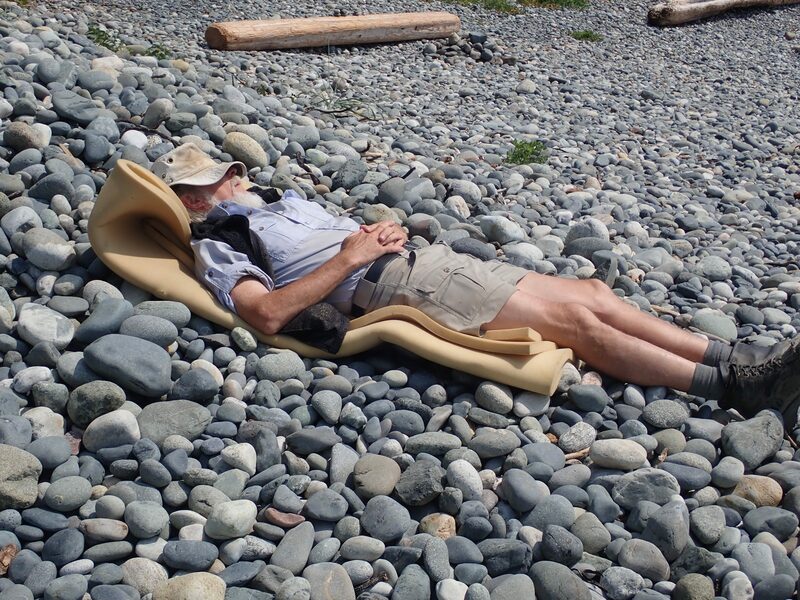 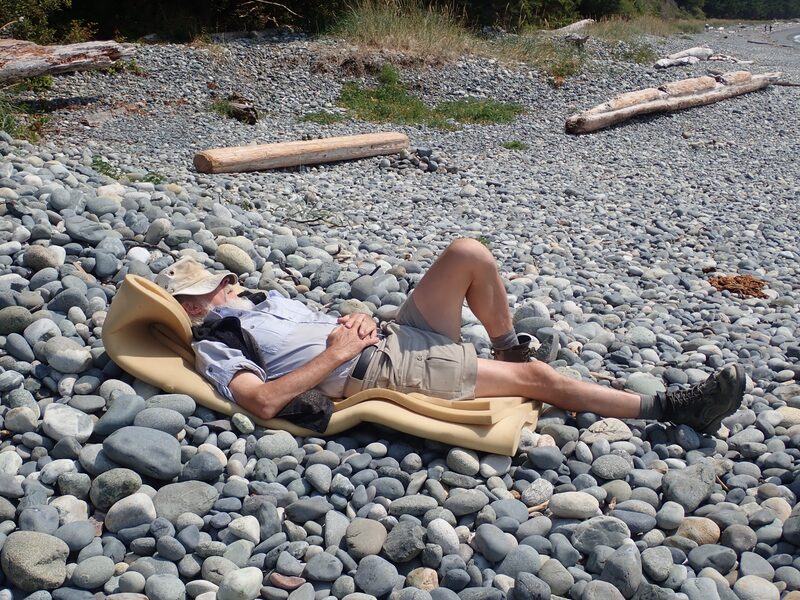 Ella Beach is a pebble beach fairly close to the Sooke River Campground. 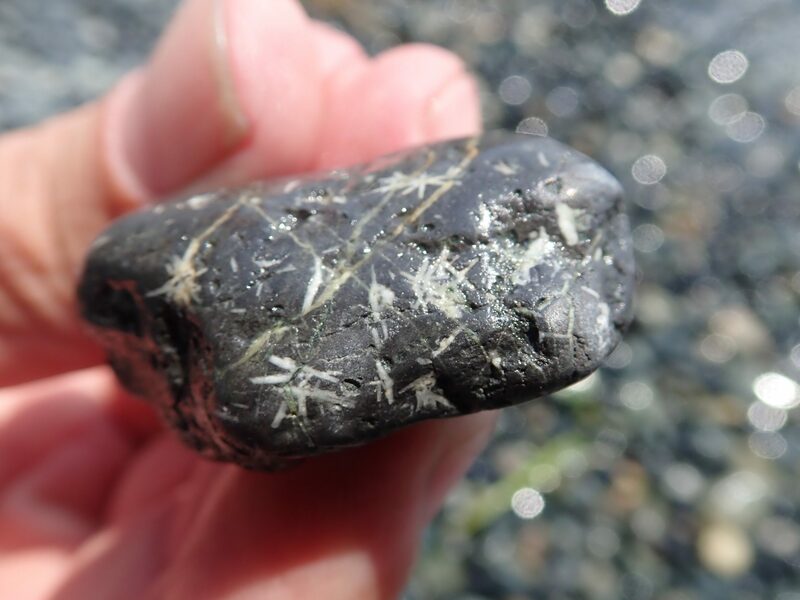 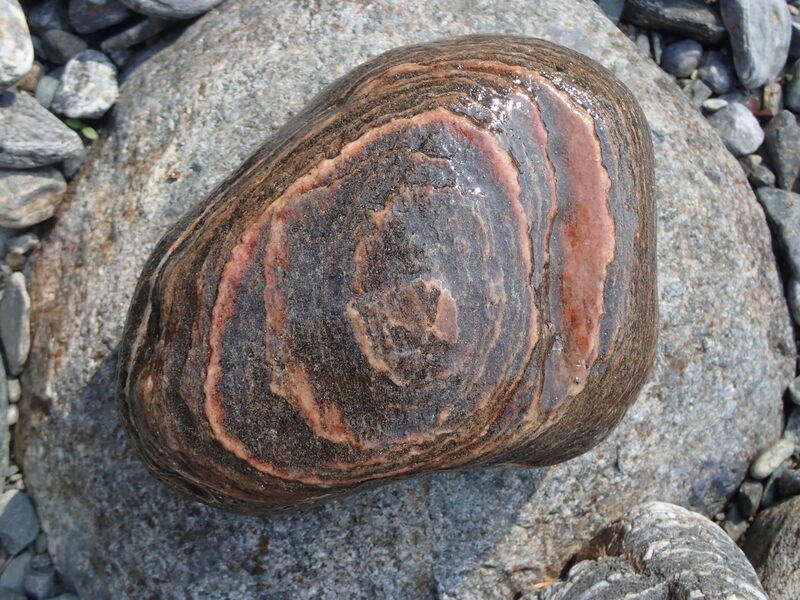 The large variety of rocks that create the pebbles give an opportunity to find (and identify) your favourites. 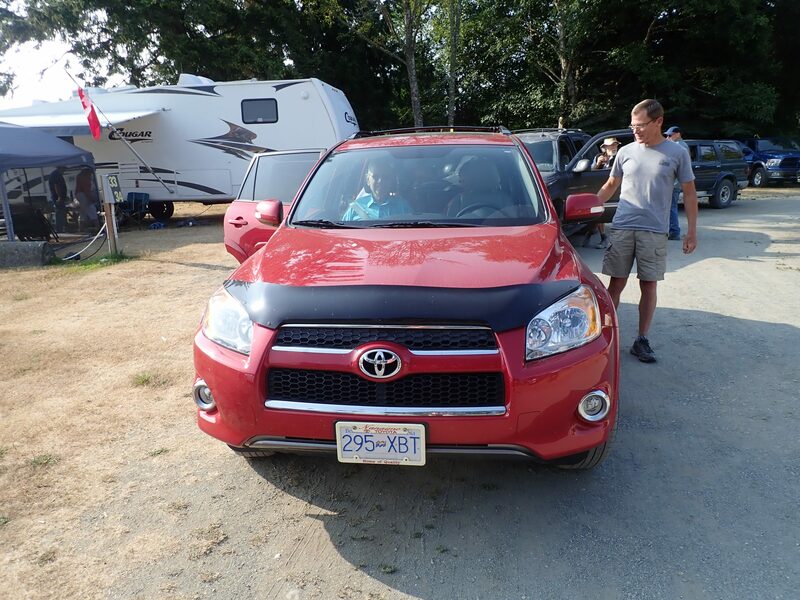 can be anywhere in Canada (not just BC), & must have been a member in good standing for the prior 3 years.